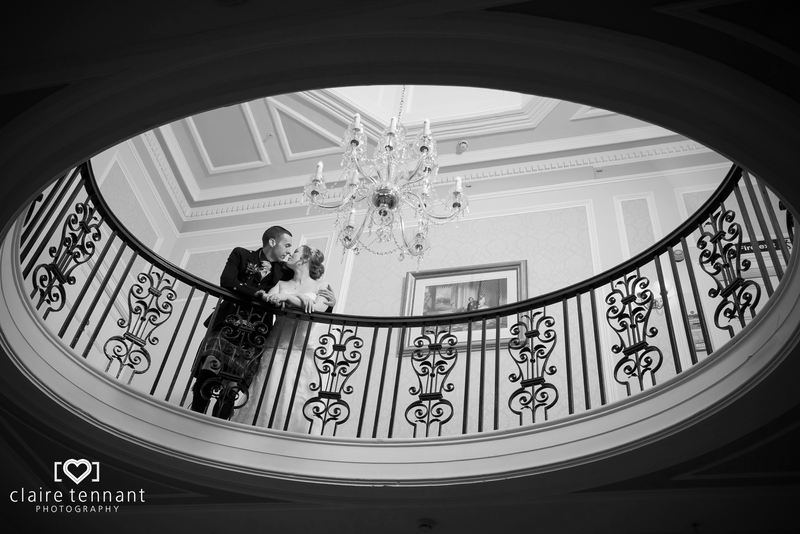 Adele and Grant are lovely people and so perfect for each other. 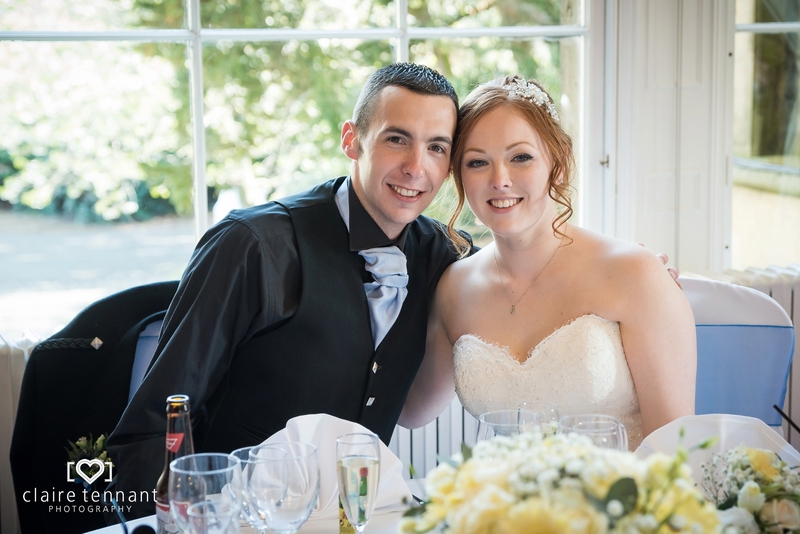 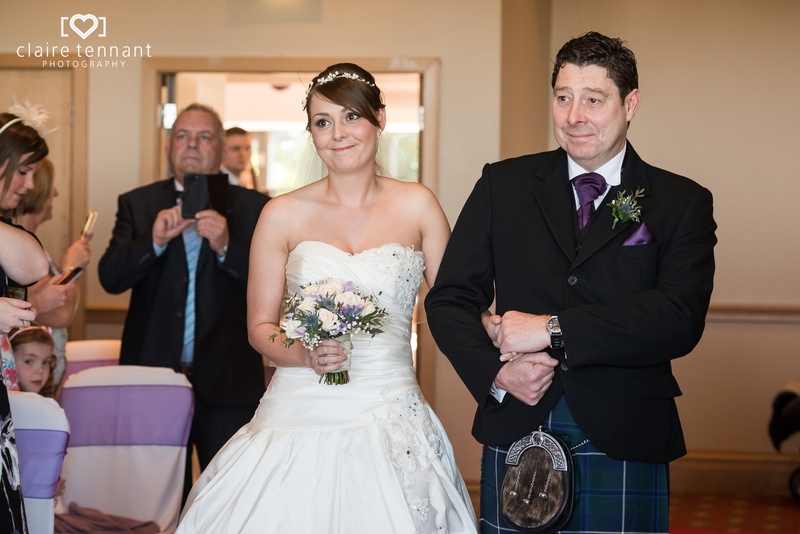 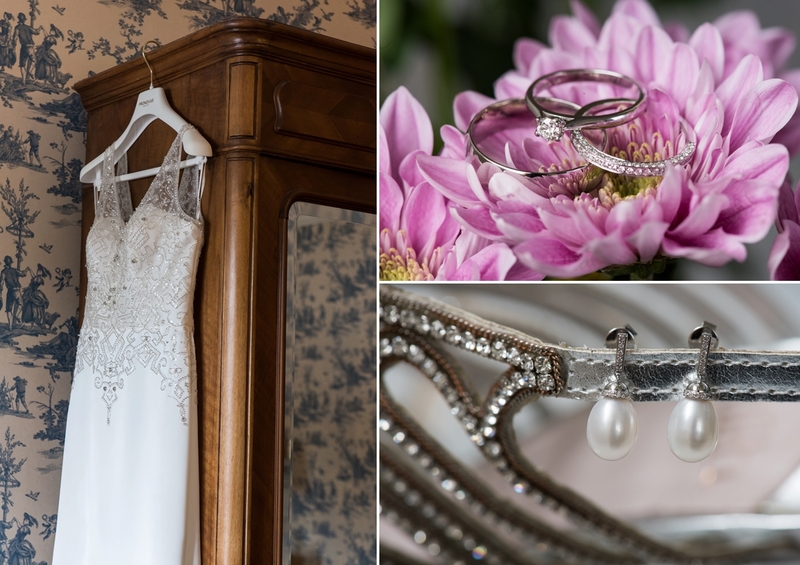 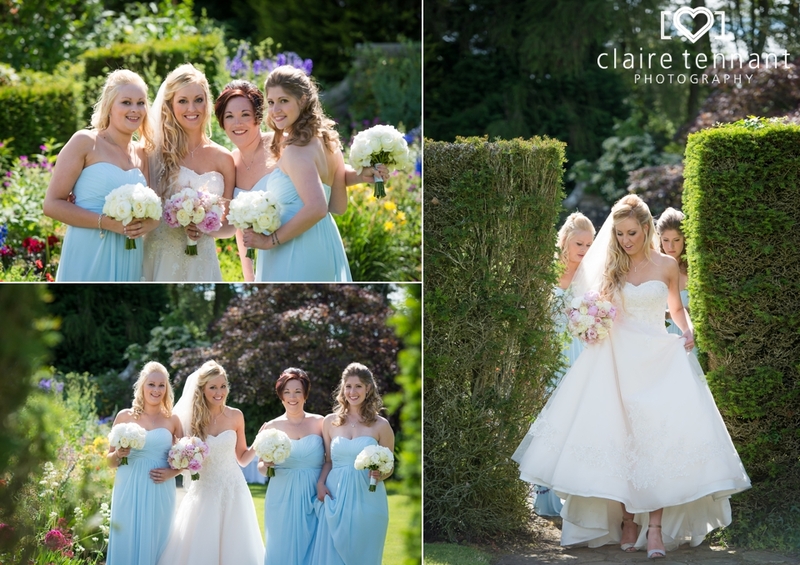 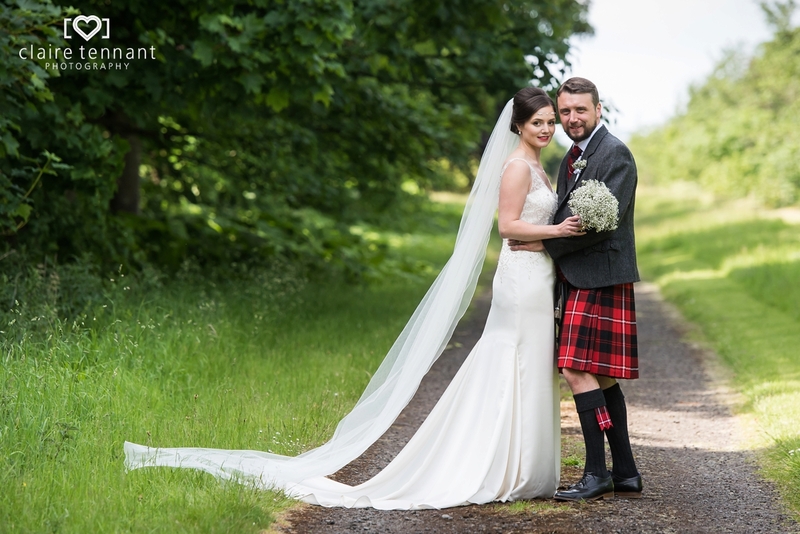 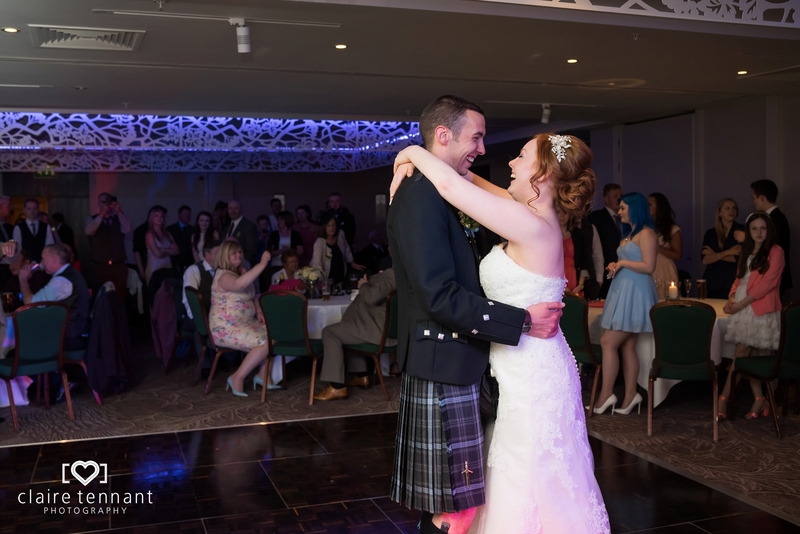 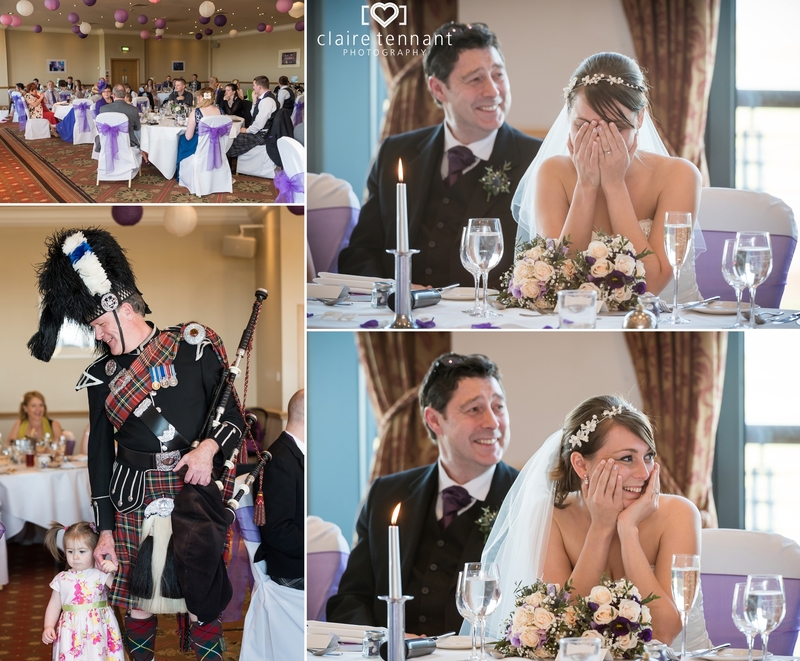 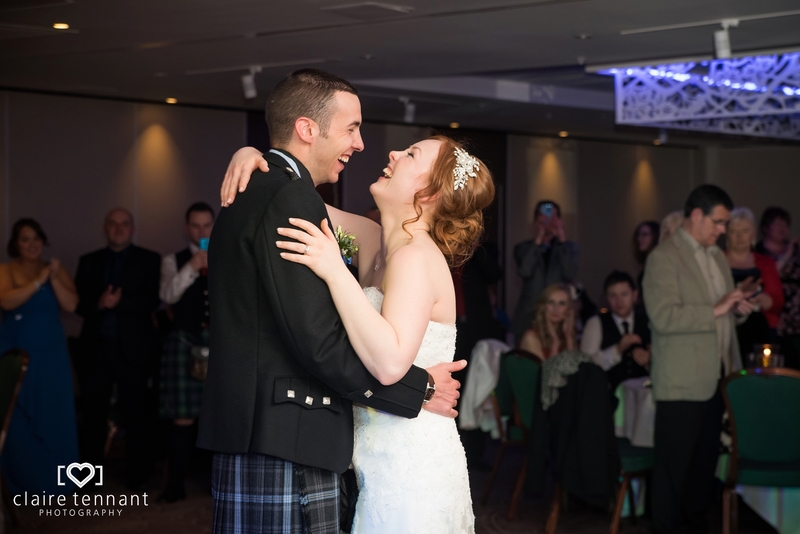 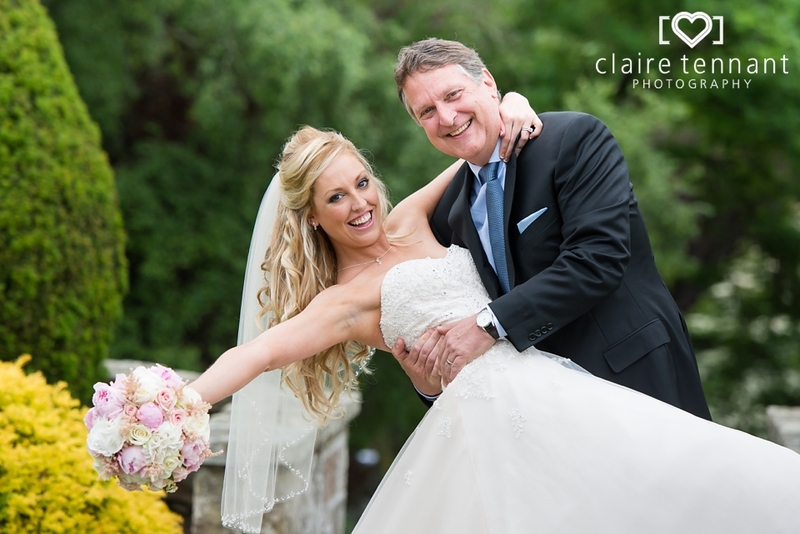 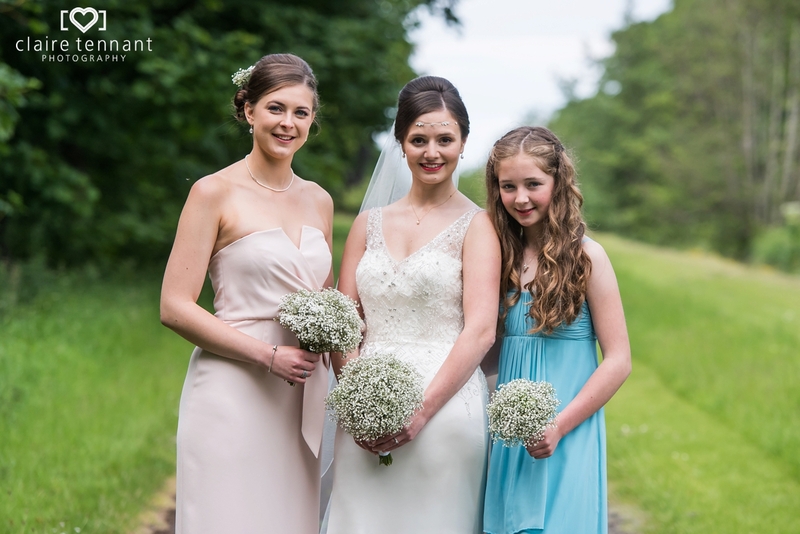 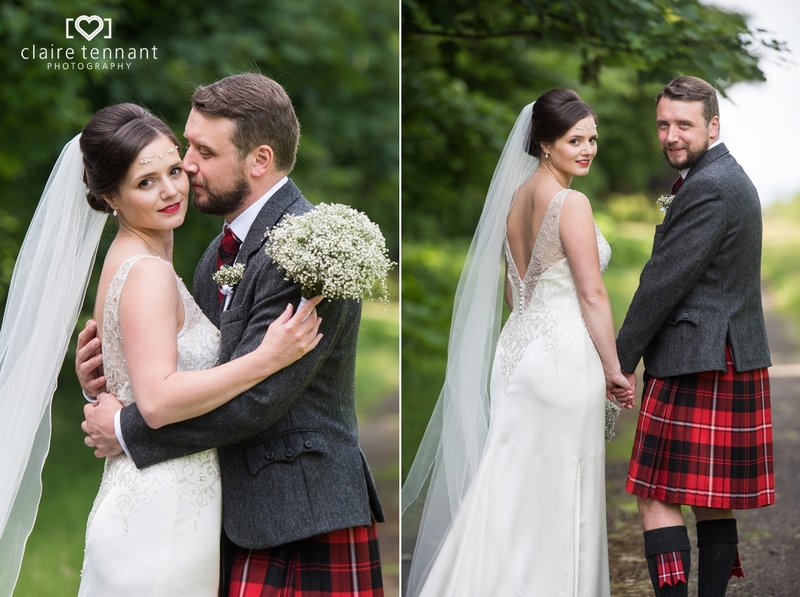 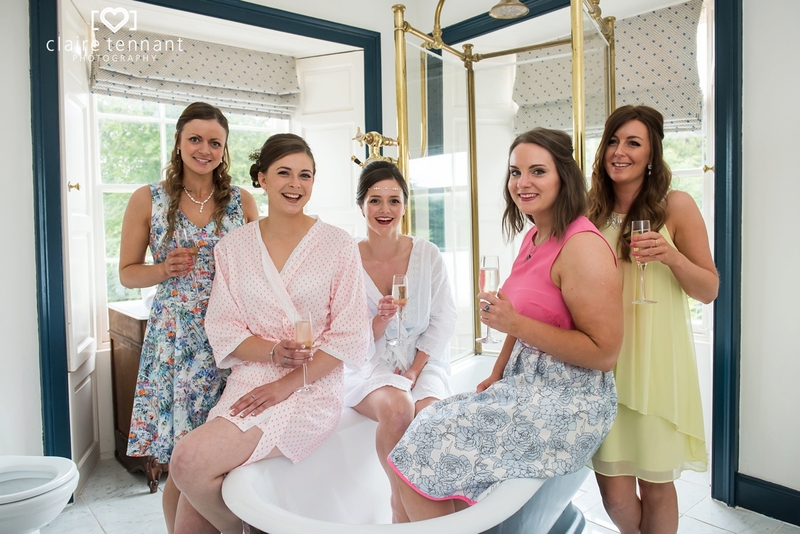 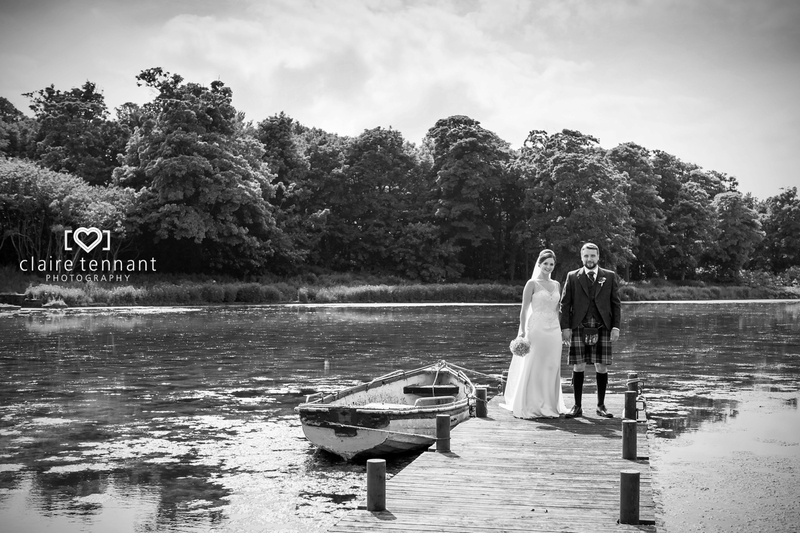 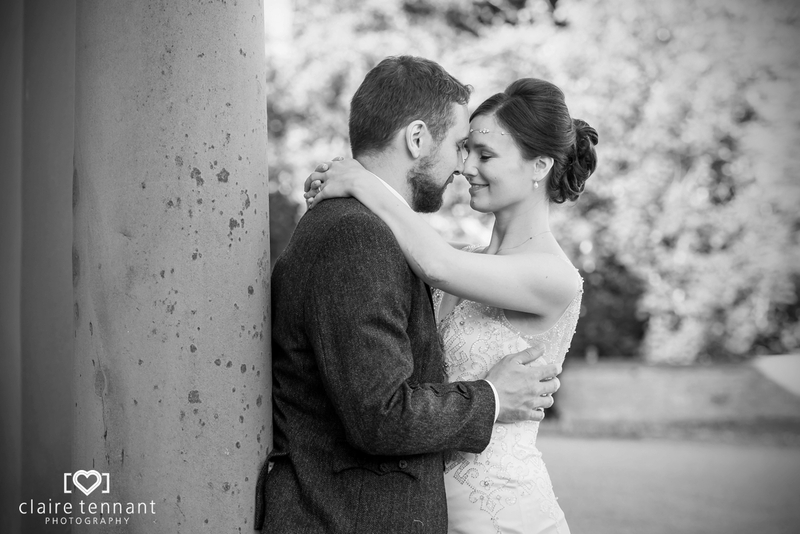 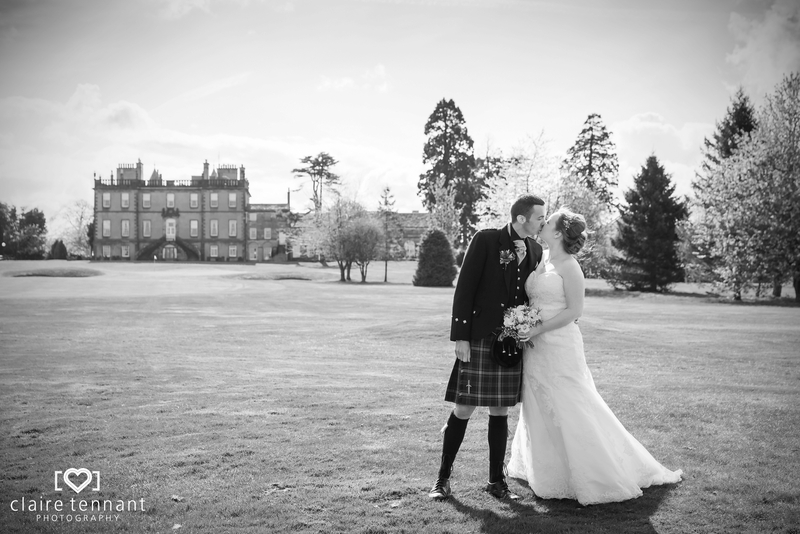 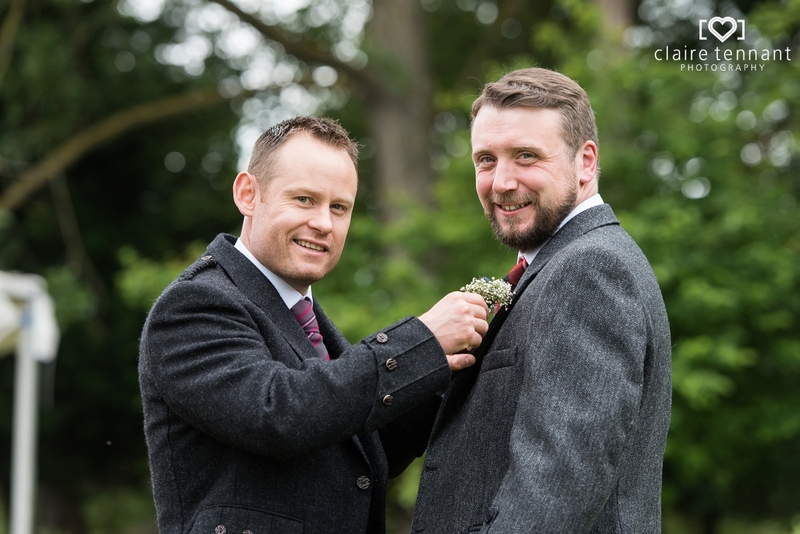 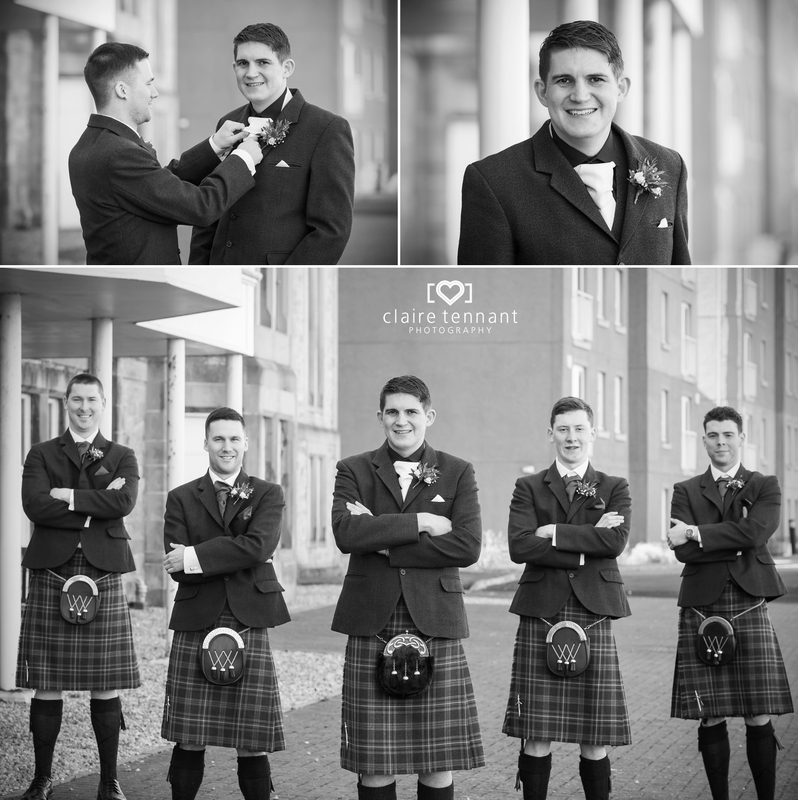 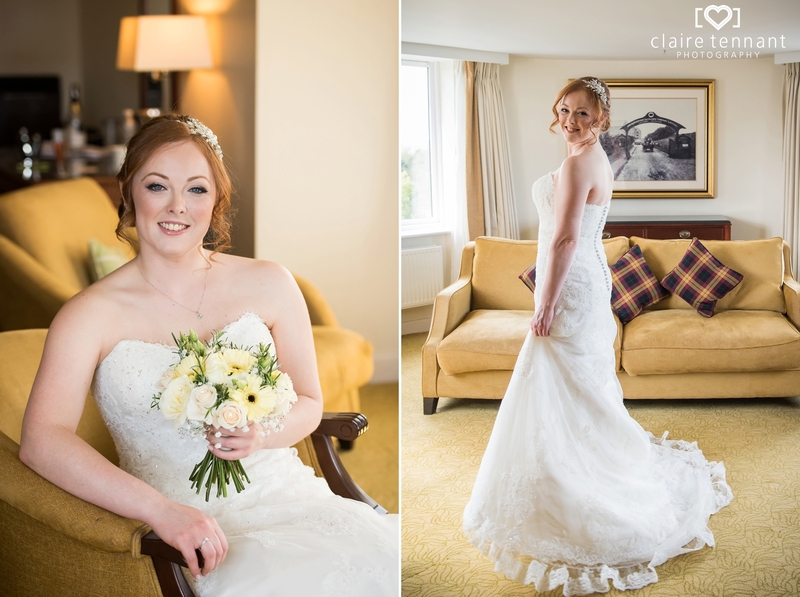 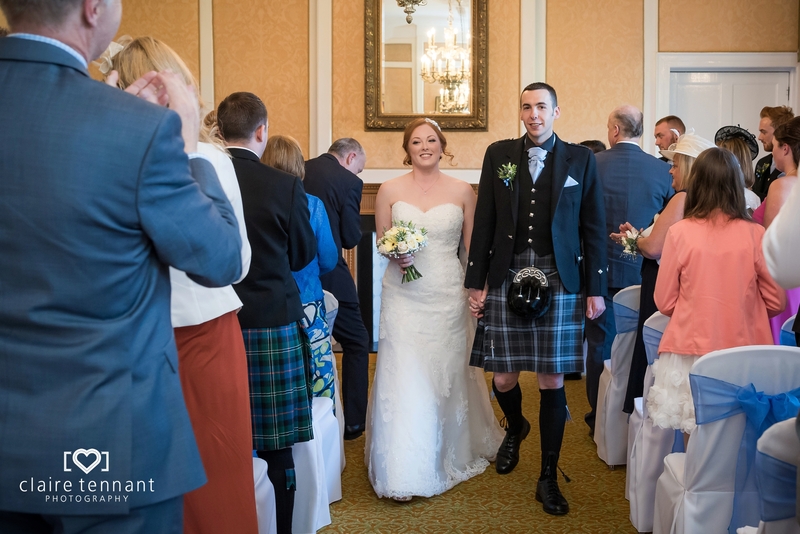 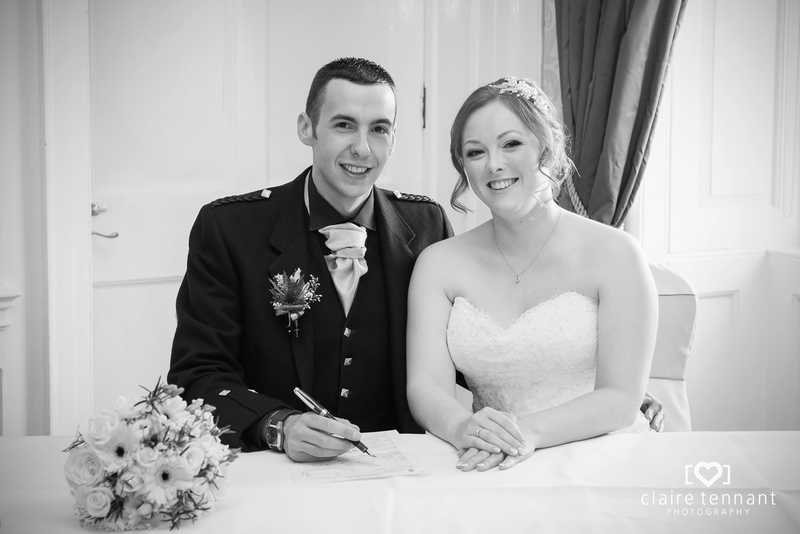 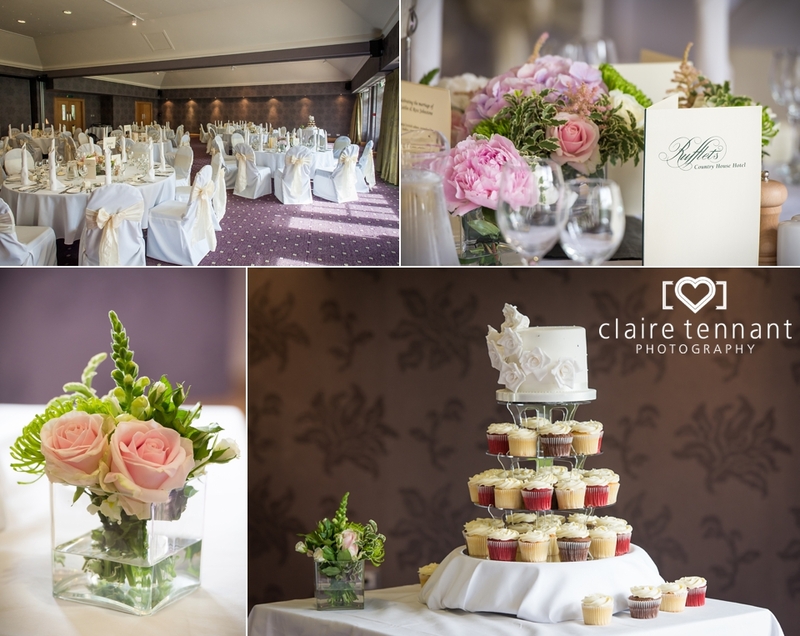 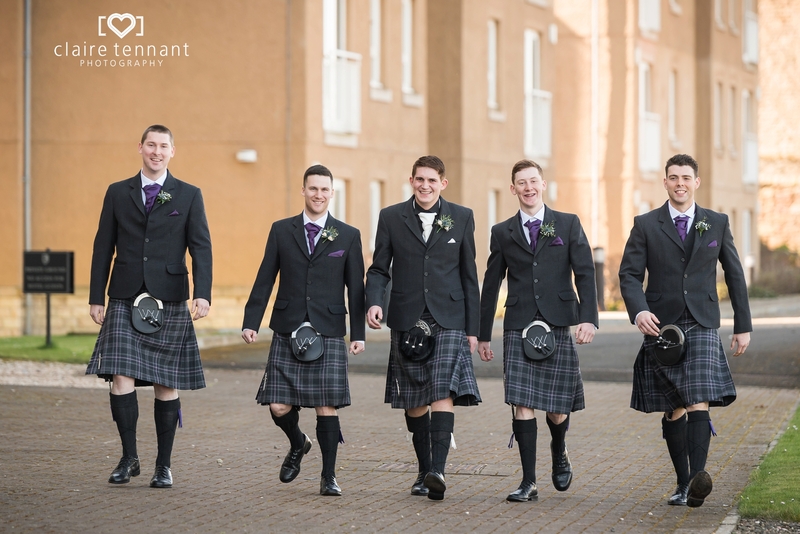 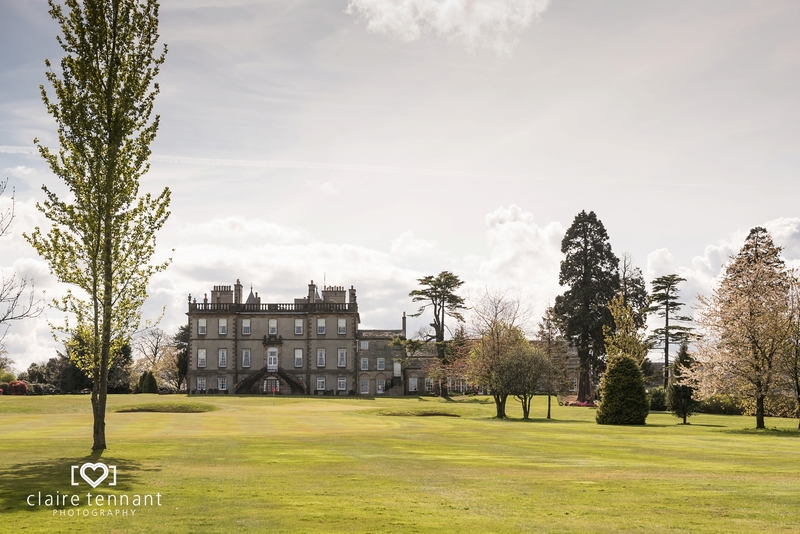 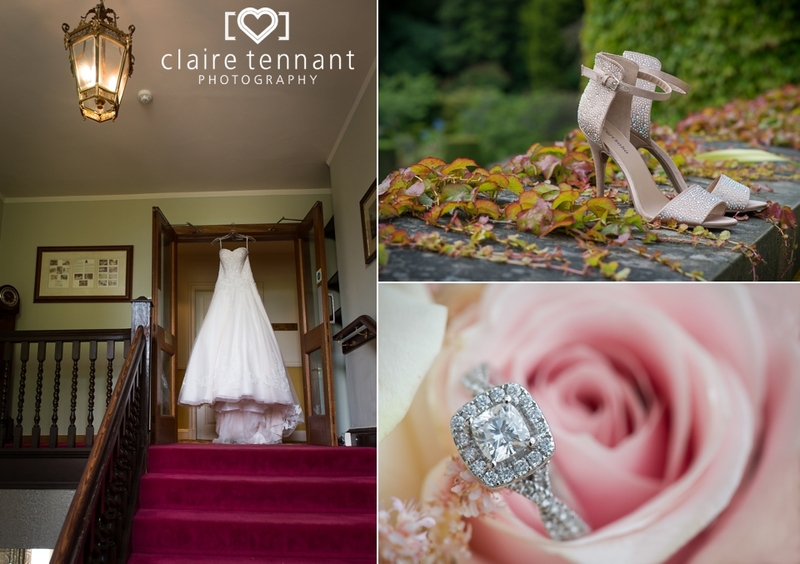 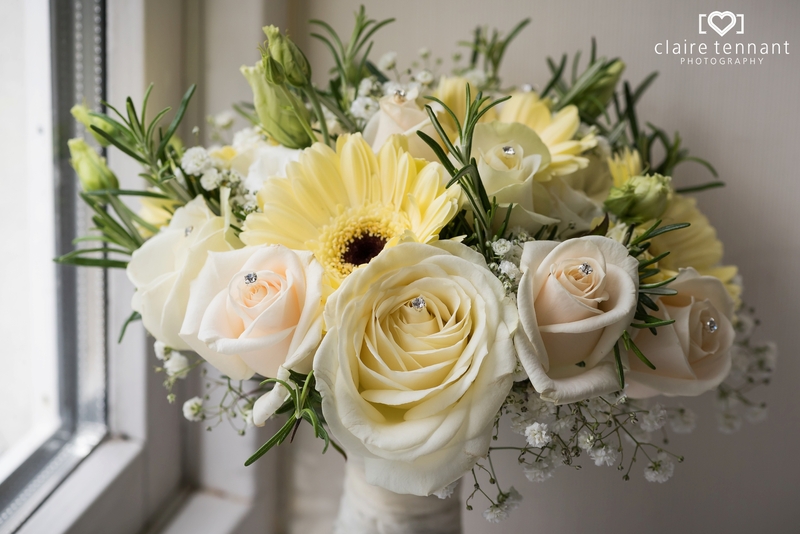 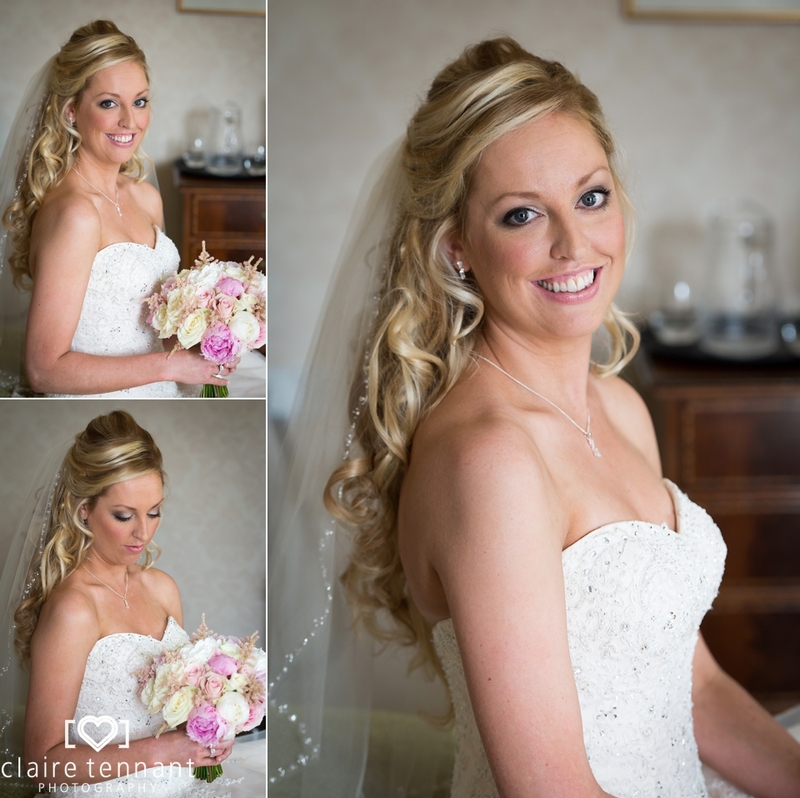 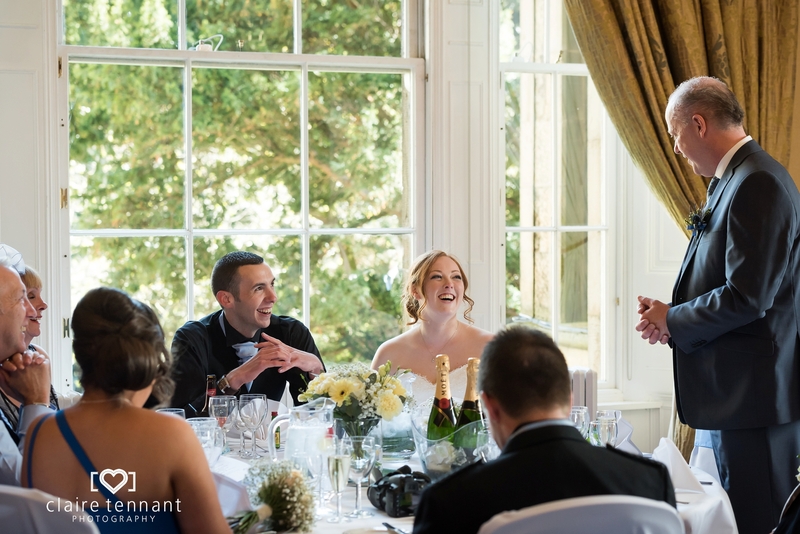 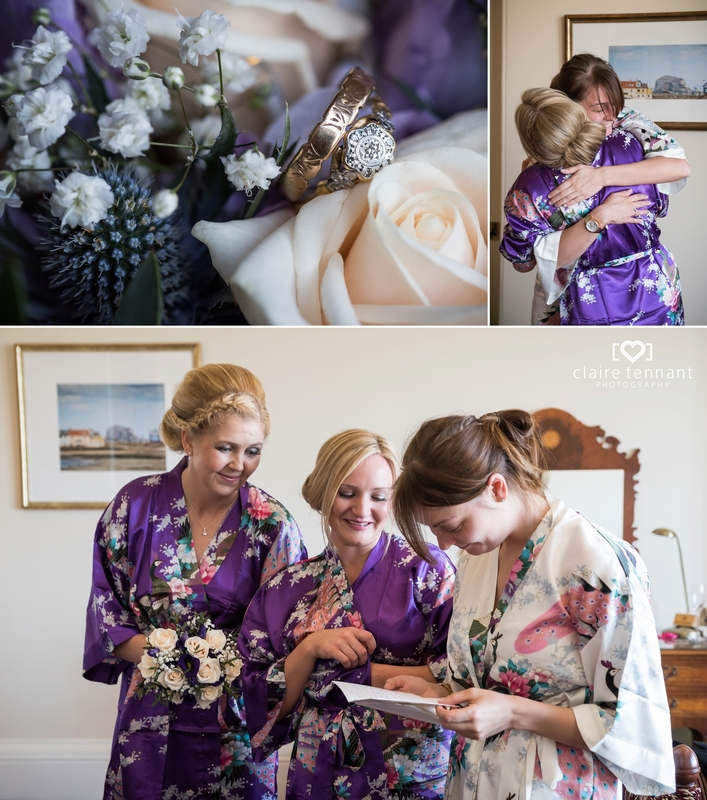 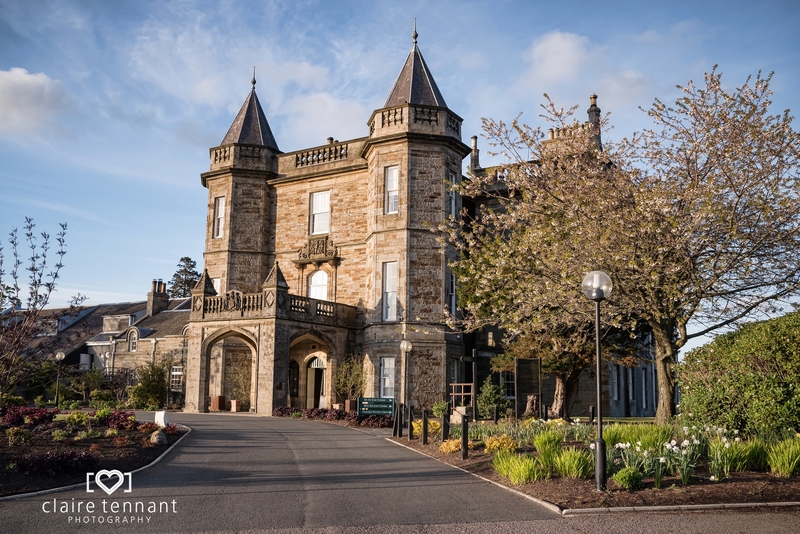 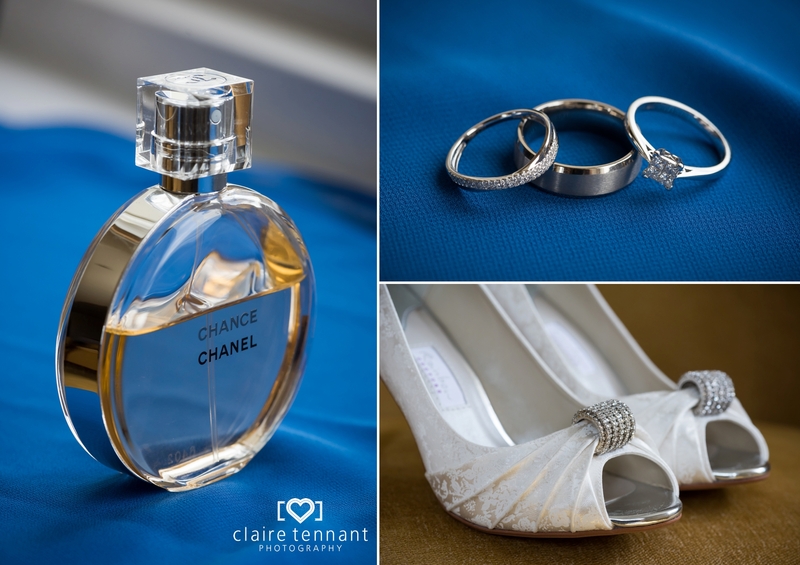 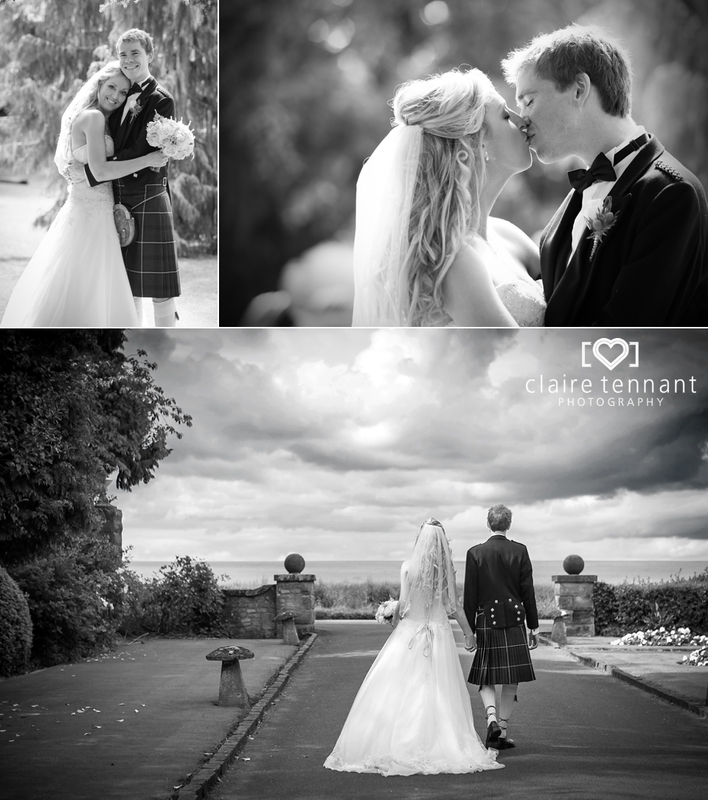 It was a pleasure to photograph their Spring Marriott Dalmahoy wedding near Edinburgh. 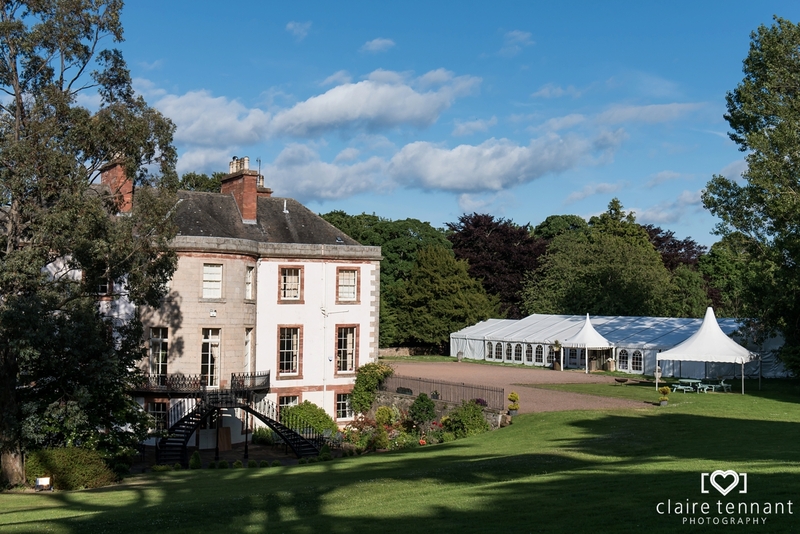 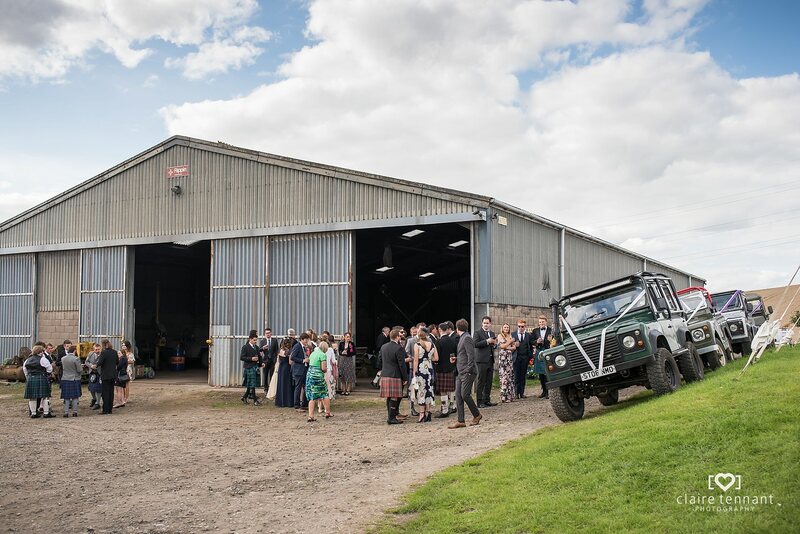 This is a venue I know very well and it is very close to my heart as my husband and I got married there in 2011! 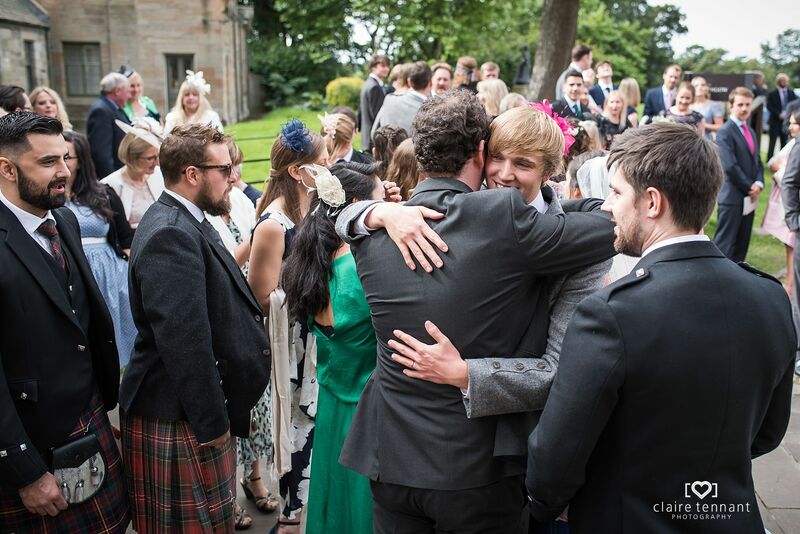 Since then I have worked there a few times and each time feels special. 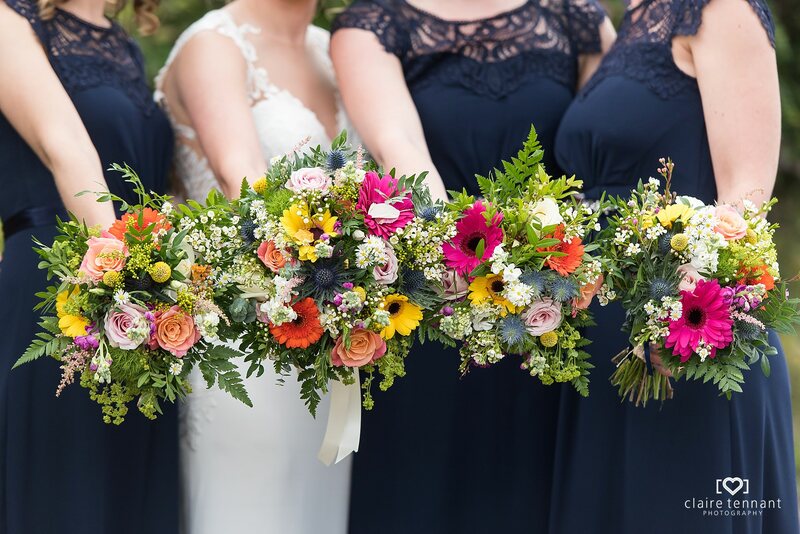 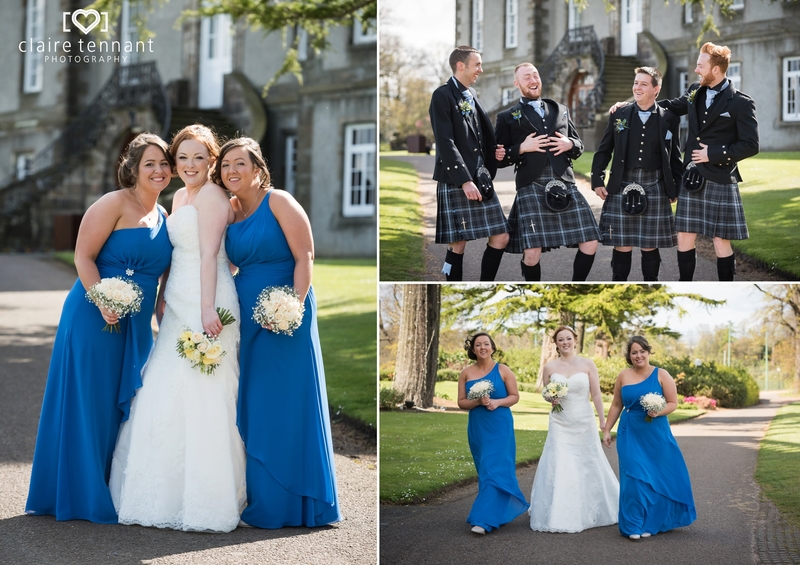 The couple chose a bright blue and yellow colour theme which tied in really well with the décor of the hotel as well as being perfect for Spring. 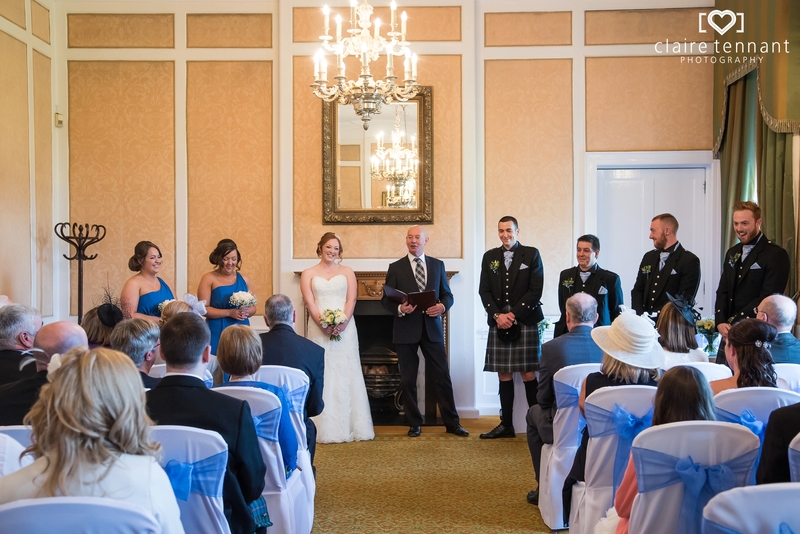 I’m not sure if matching the venue colour scheme was intentional or just a coincidence but it looked great being so coordinated! 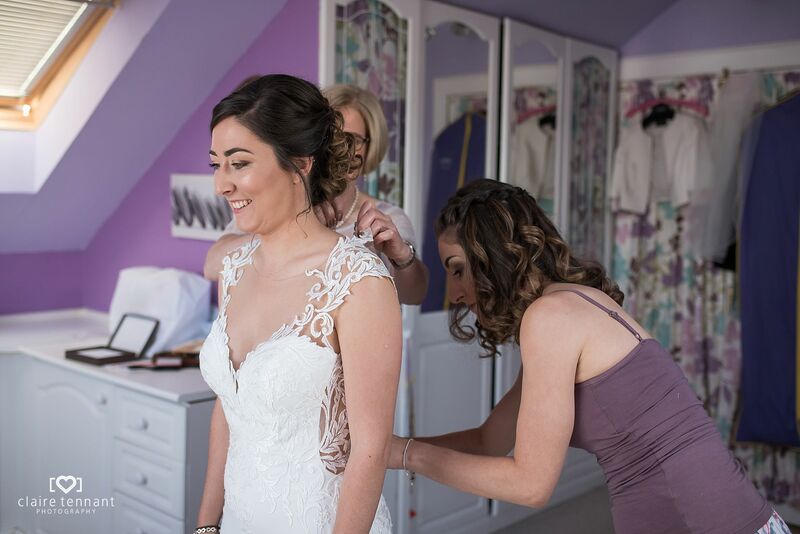 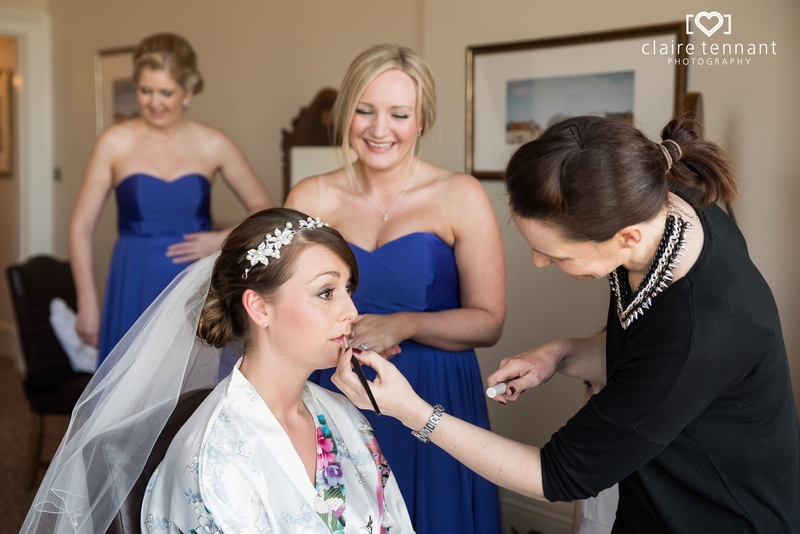 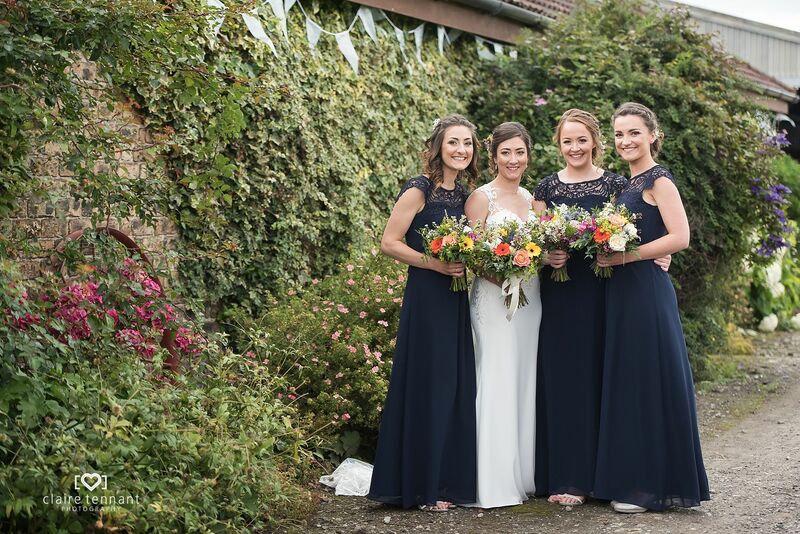 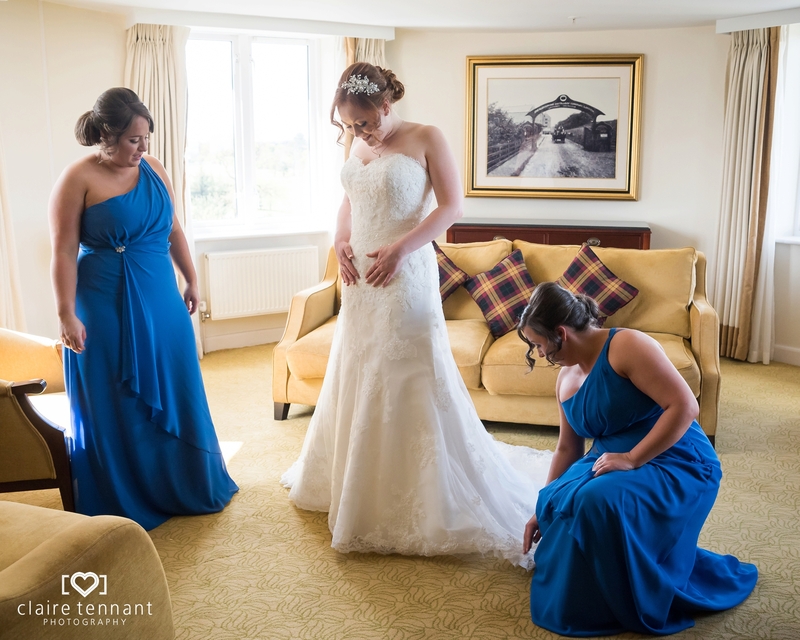 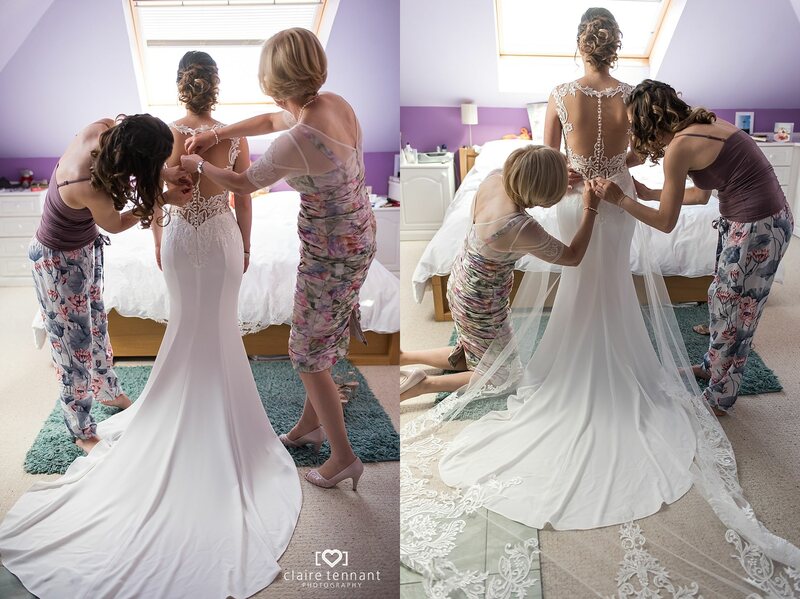 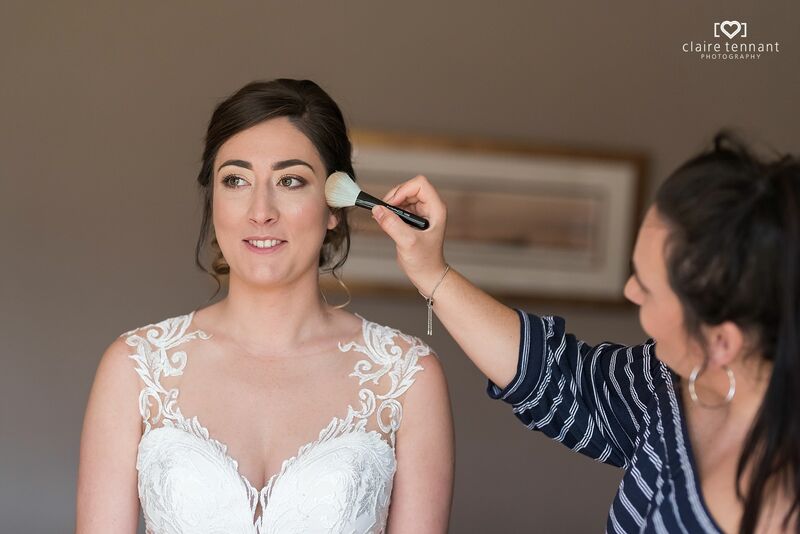 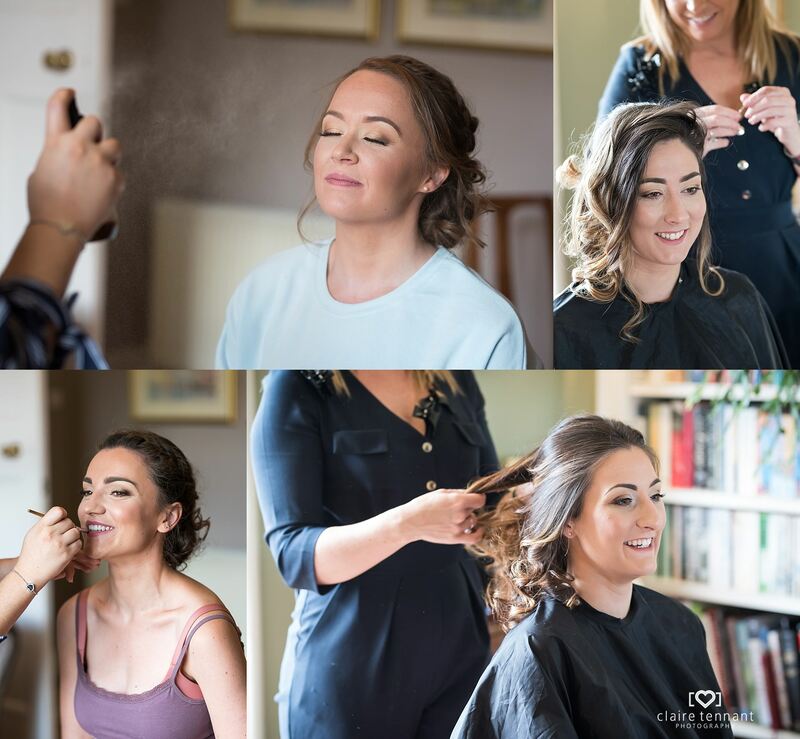 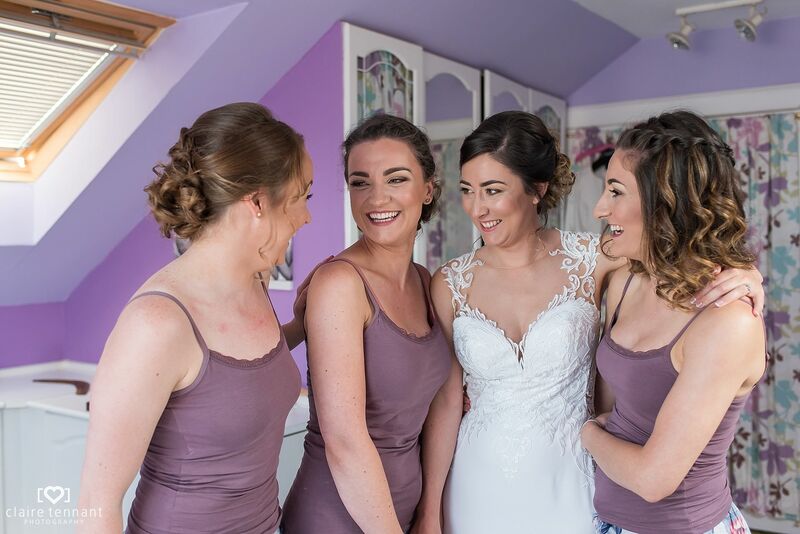 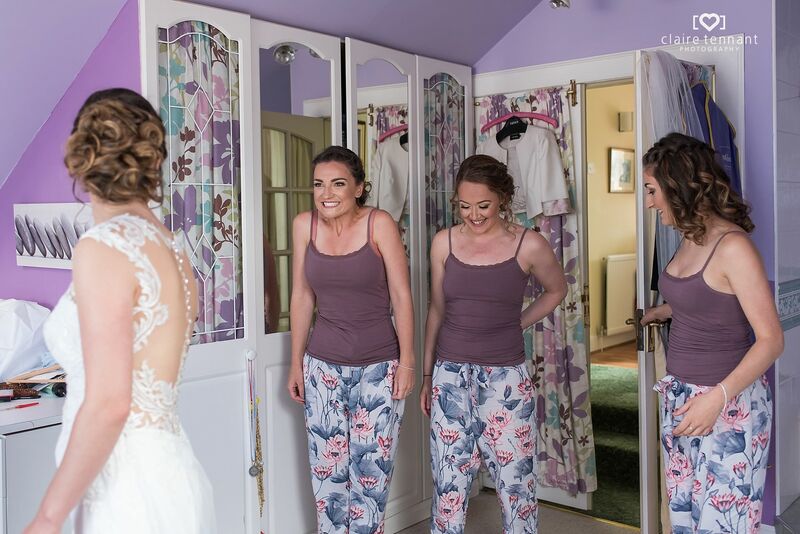 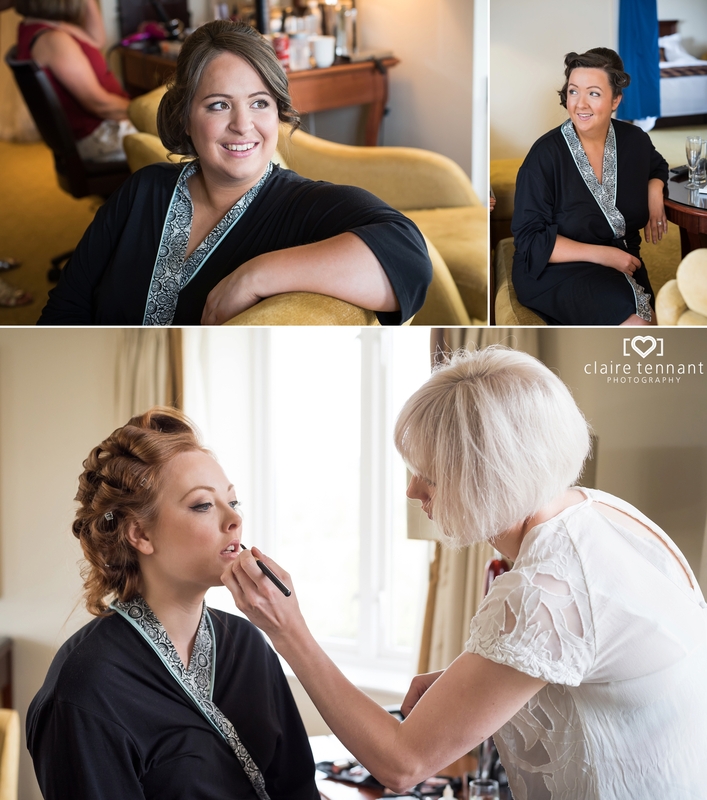 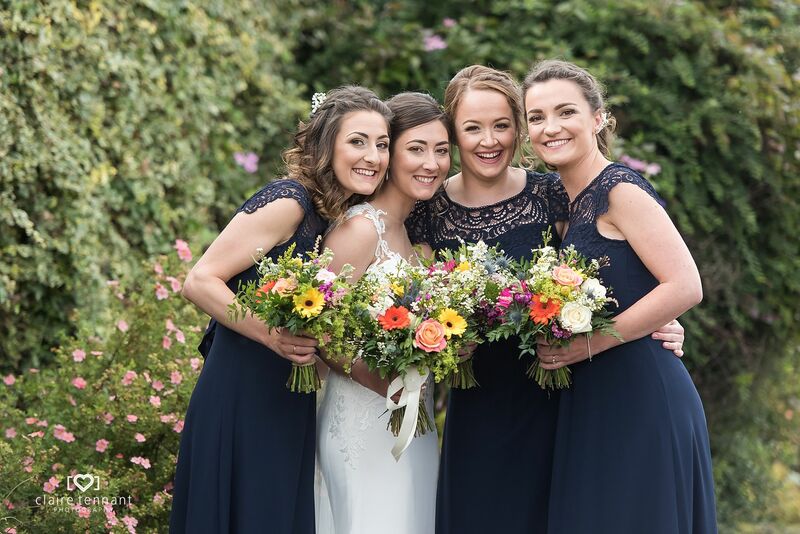 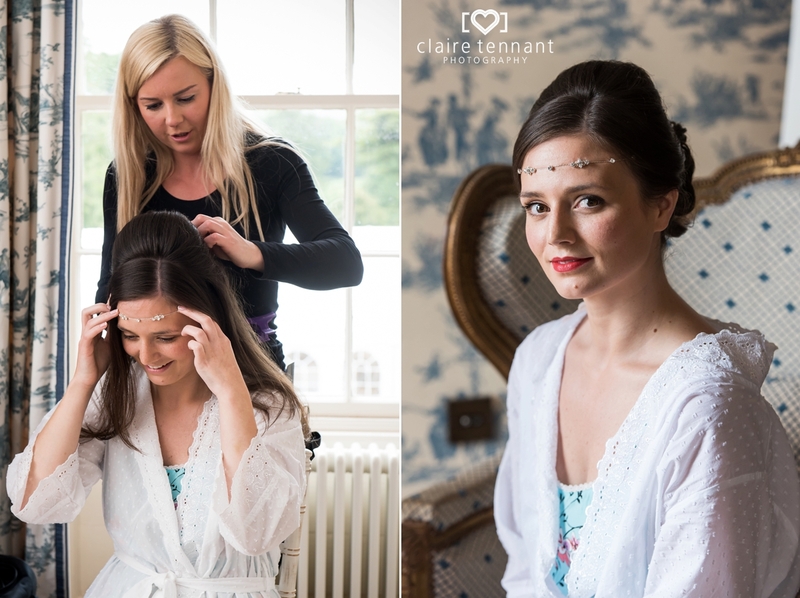 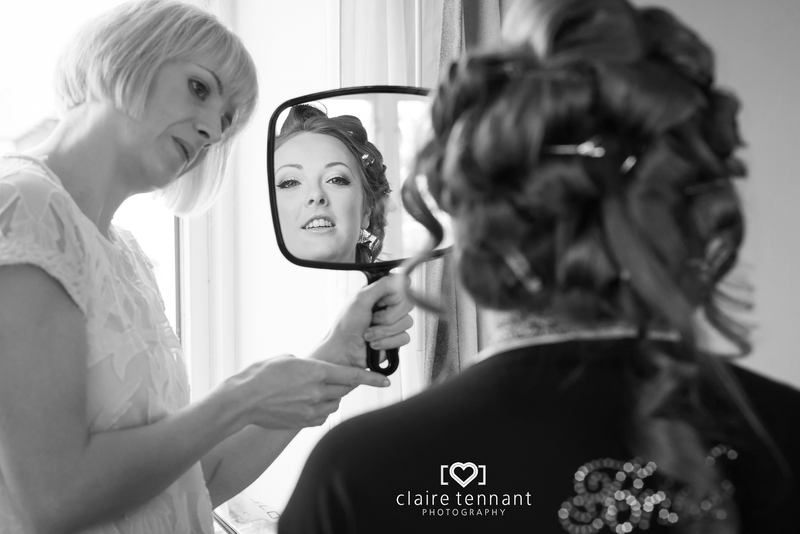 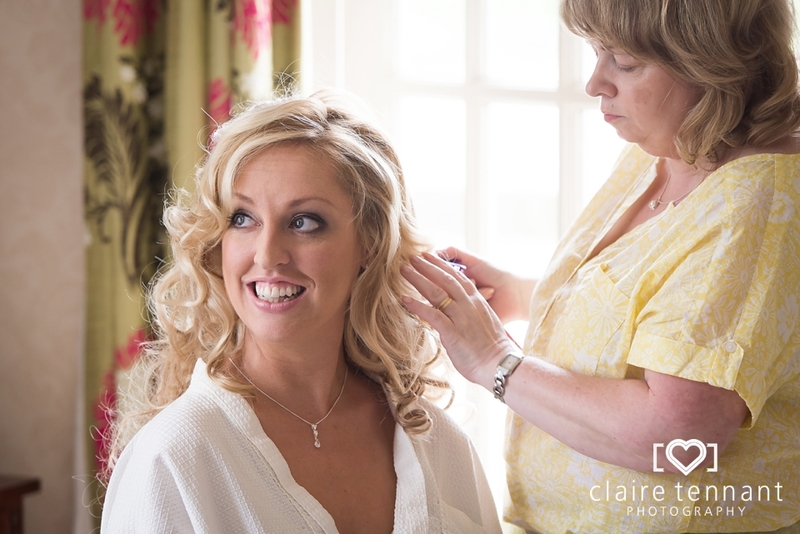 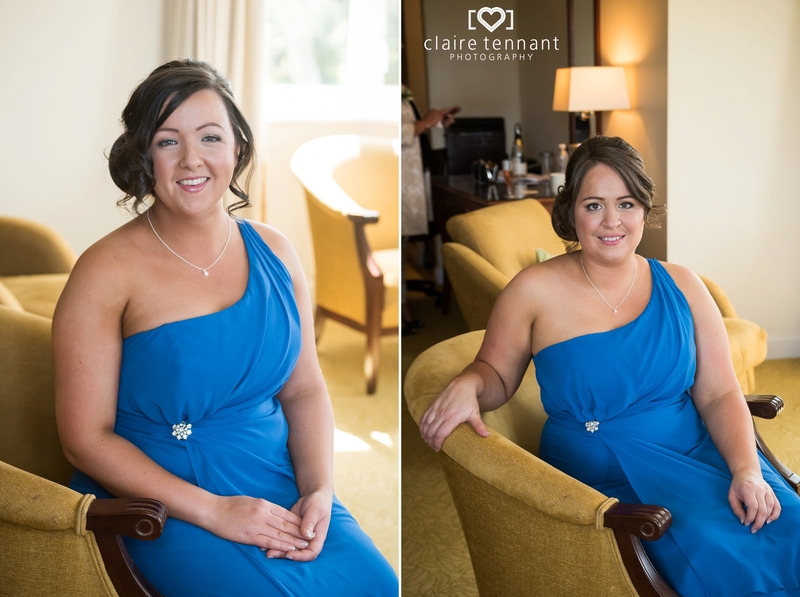 Adele got ready with her bridesmaids at Dalmahoy on the morning of the wedding which was very handy as I was able to nip back and forth between her and Grant. 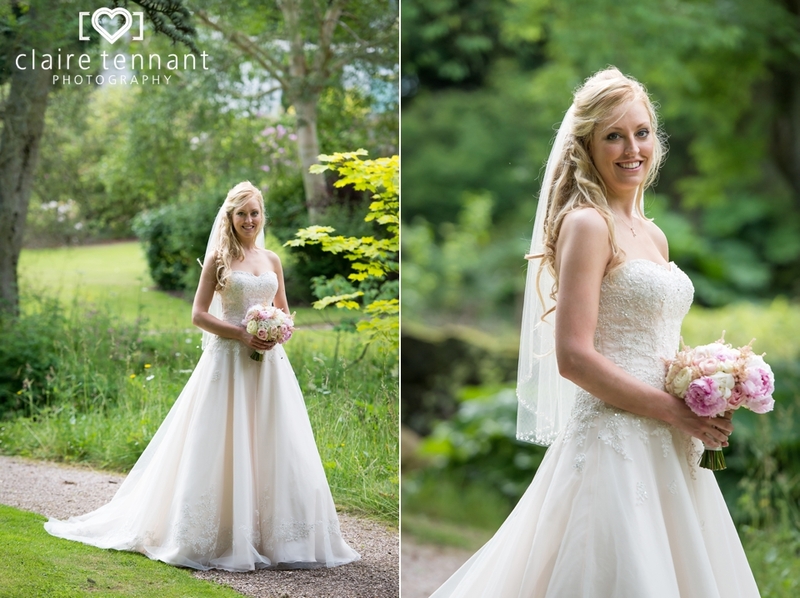 It also meant I was able to capture some portrait photos of her in her beautiful wedding dress just before she went down for the ceremony. 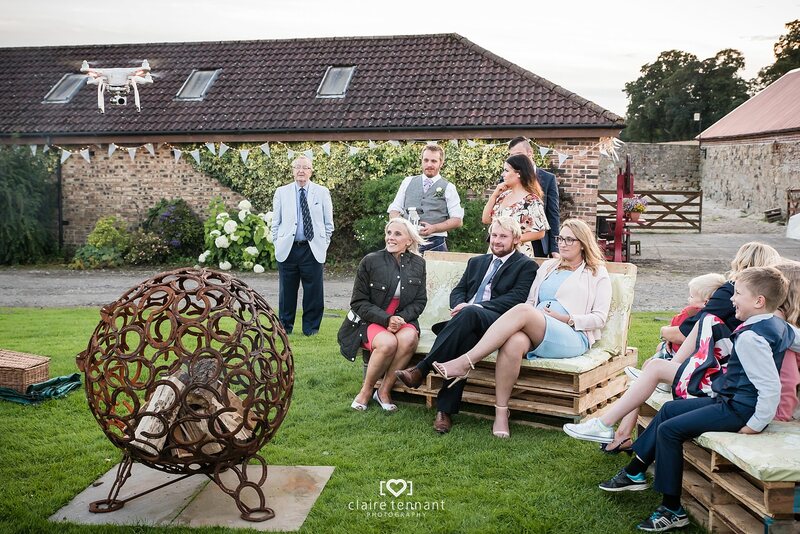 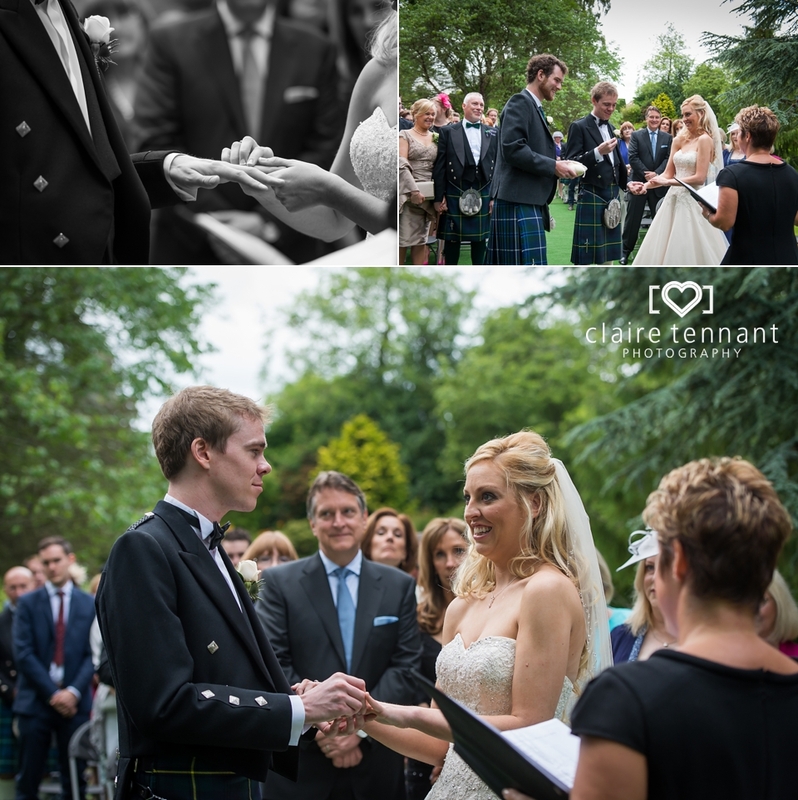 Their humanist ceremony was touching and gave their guests a lovely insight into their personalities and relationship. 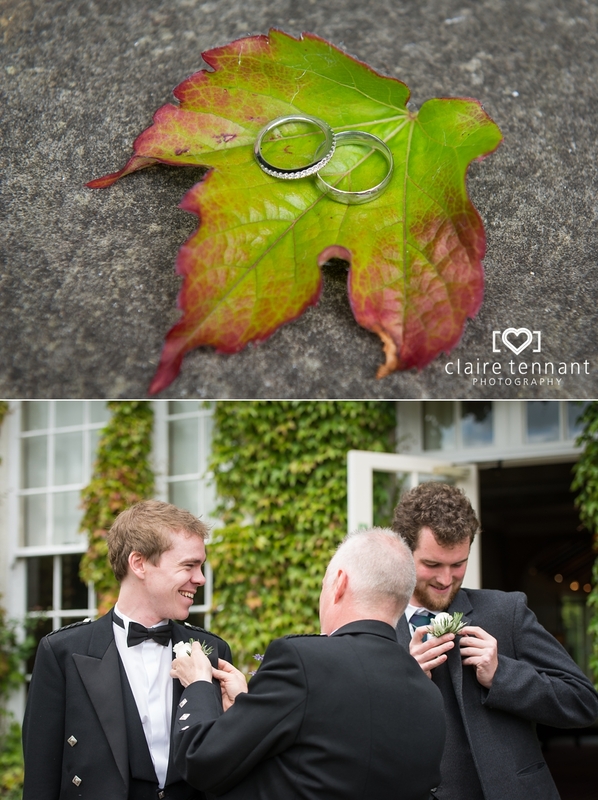 After the ceremony I captured some natural shots before launching into the official group photos. 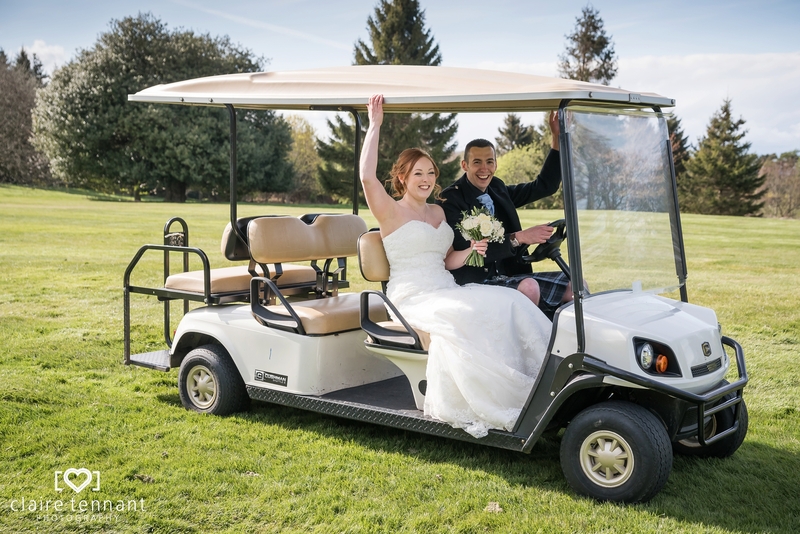 Then the three of us hopped onto a golf buggy and whizzed over to the pond for some romantic couple photos! 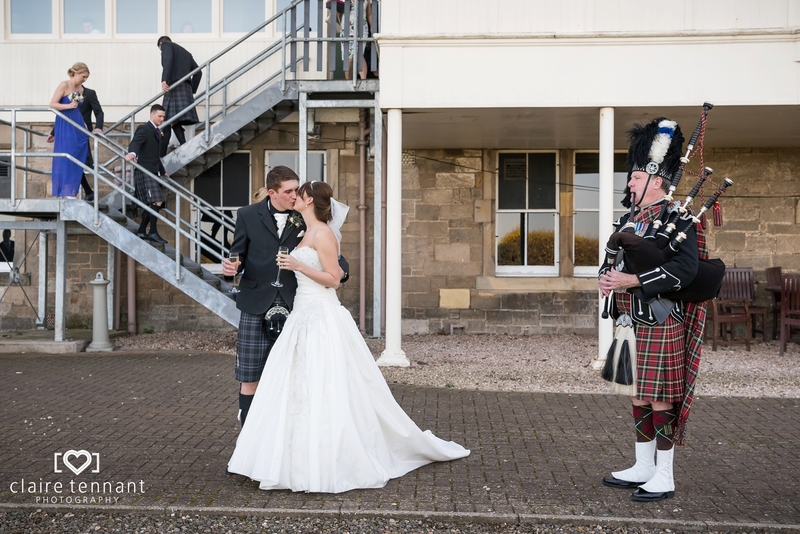 It was great to get some photos with the venue in the distance too. 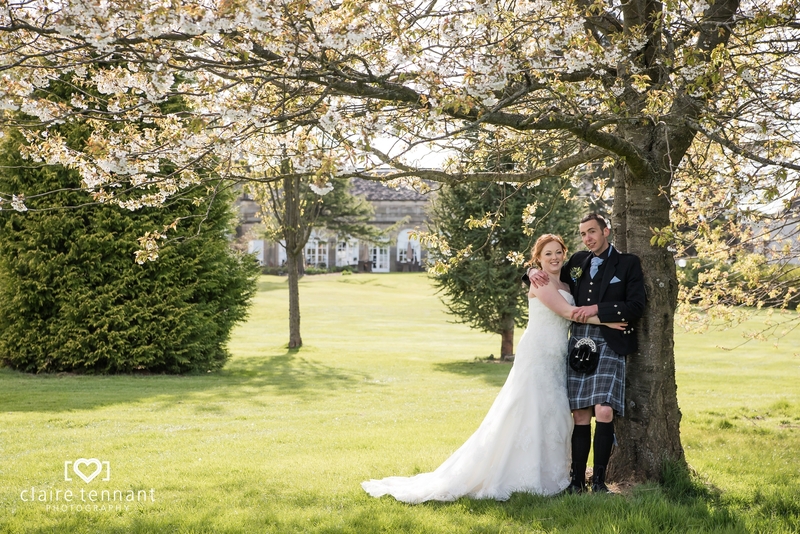 On our way back we found a blossom tree which was still in bloom which made a lovely backdrop. 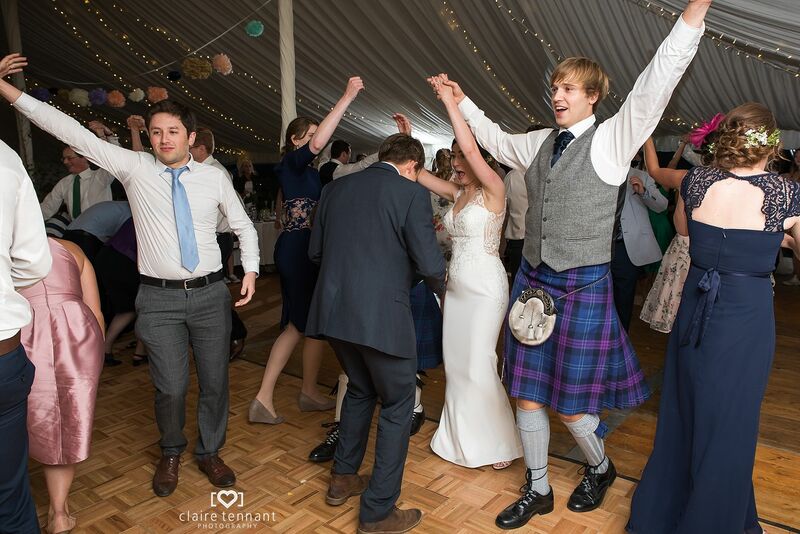 After dinner the party really started and I left everyone dancing the night away and having a great time. 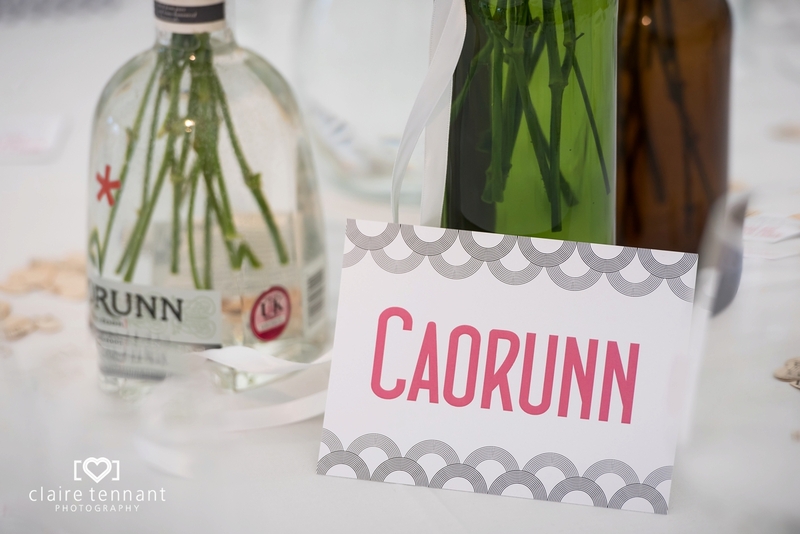 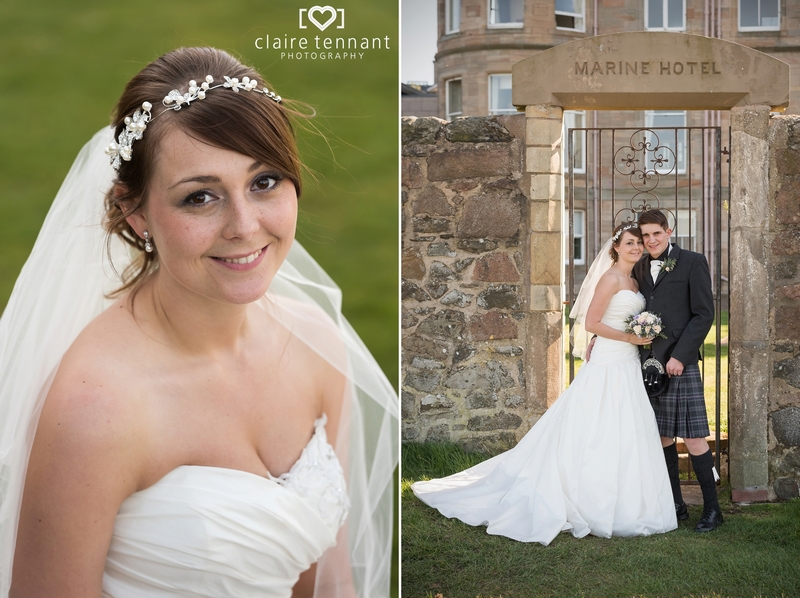 I really enjoyed photographing Kim and Kevin’s Macdonald Marine Hotel wedding last Spring. 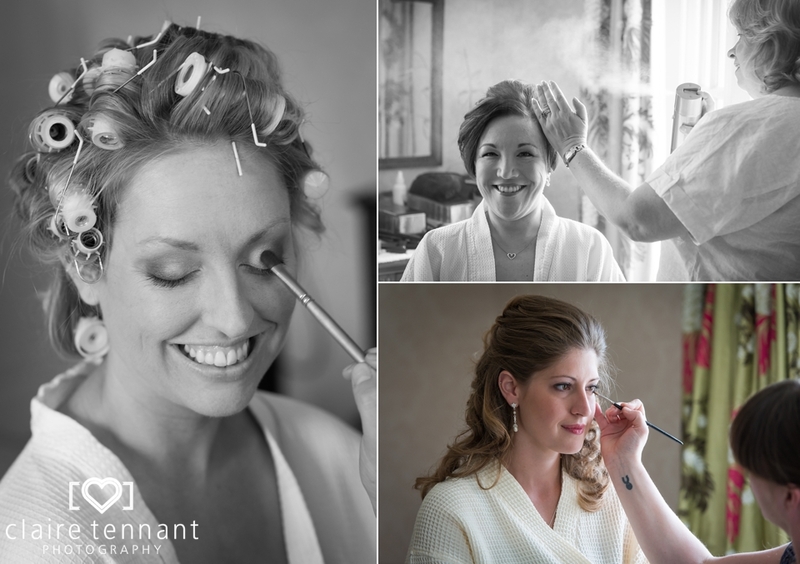 I was there from the bridal preparations until the first few dances and it was a fun, relaxed day from start to finish. 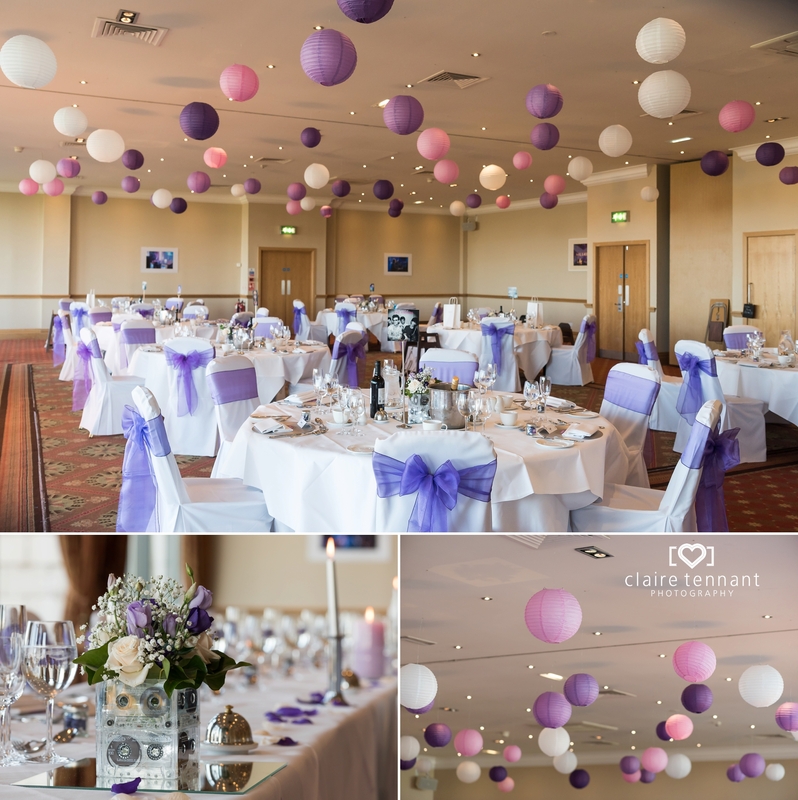 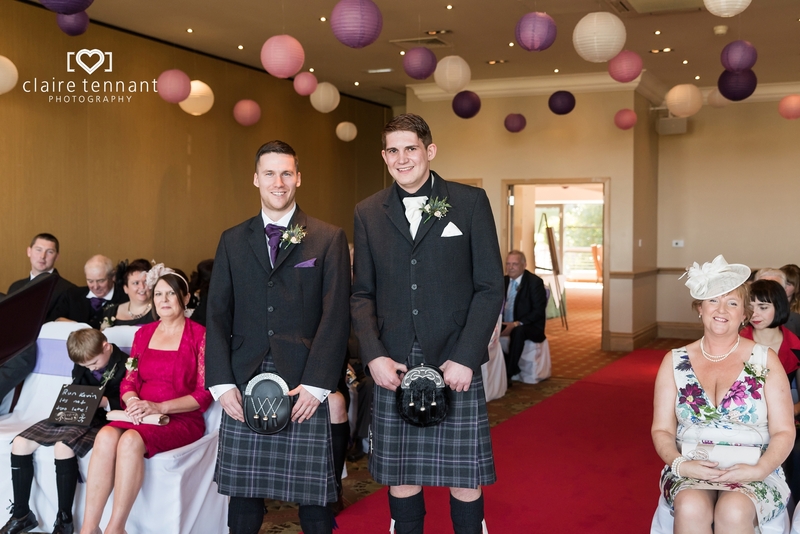 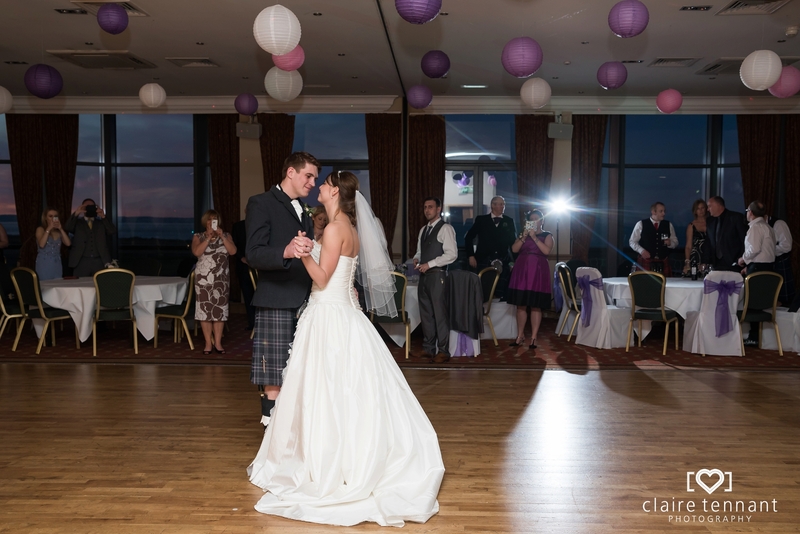 The purple and white paper lanterns that decorated the room looked great and gave a nice added pop of colour. 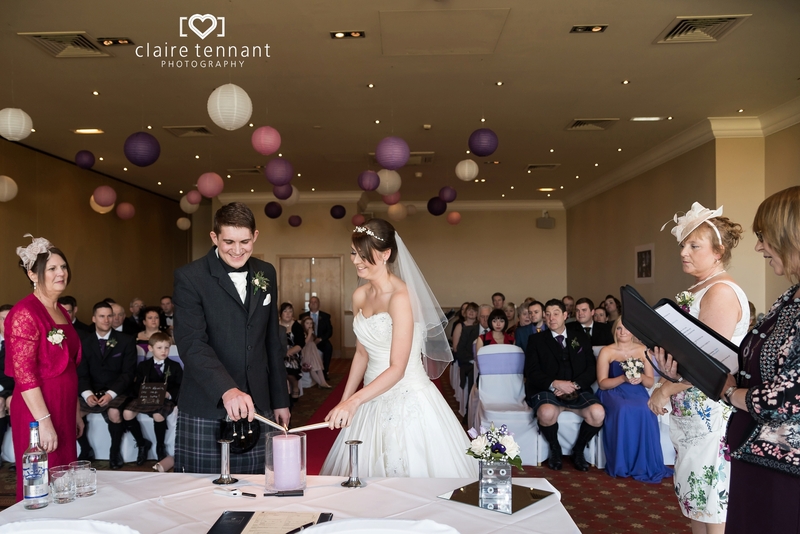 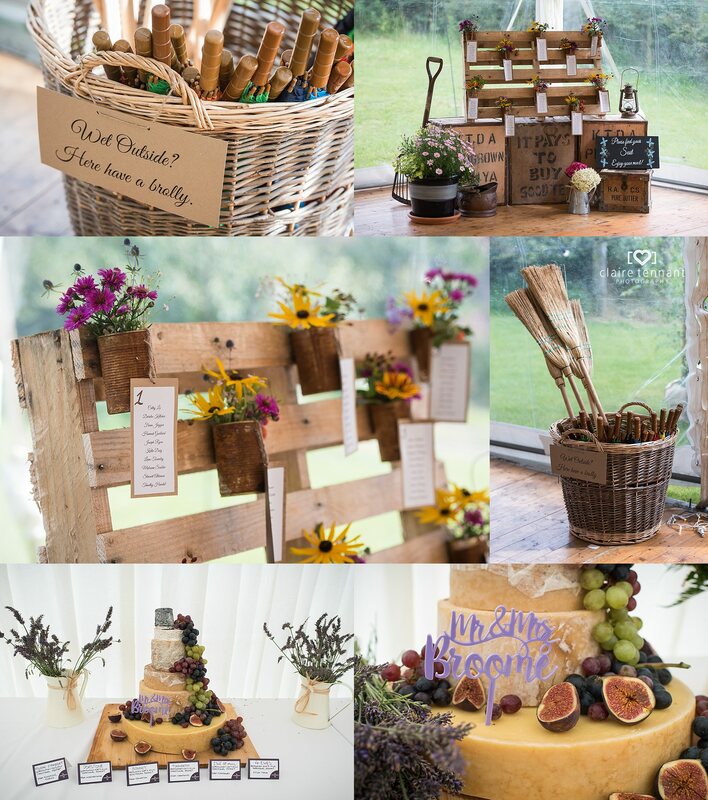 I also loved how they had incorporated their love of music into the day with lots of musical theme details and decor. 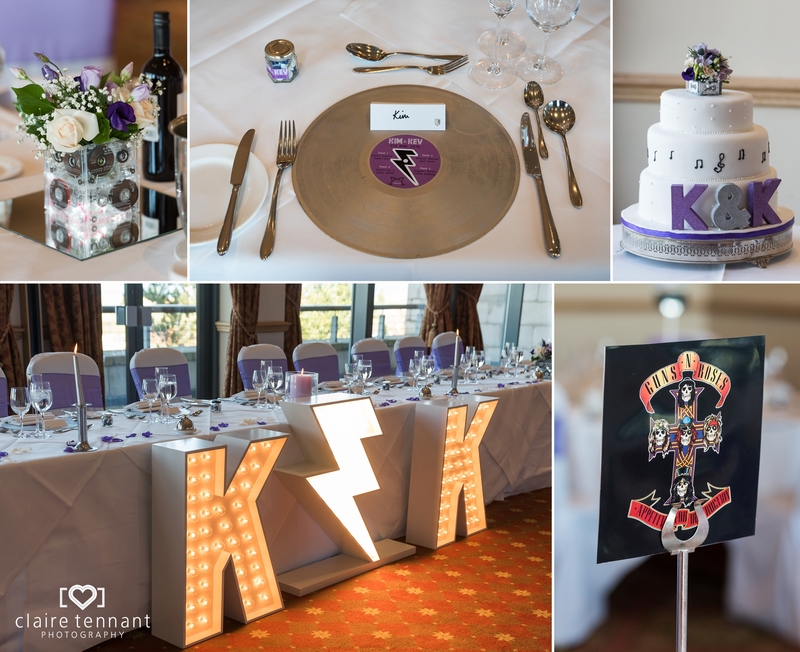 They had obviously put a lot of effort in as most of these personal touches were hand made by Kim and Kevin – even the big K K light up sign! 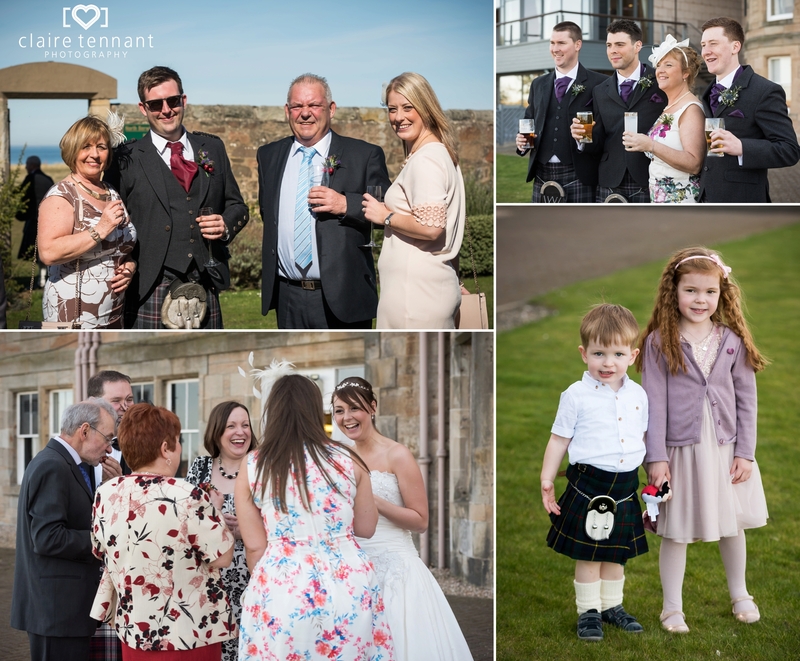 The weather was warm and sunny which meant guests were able to sip their drinks outside in the sunshine after the ceremony. 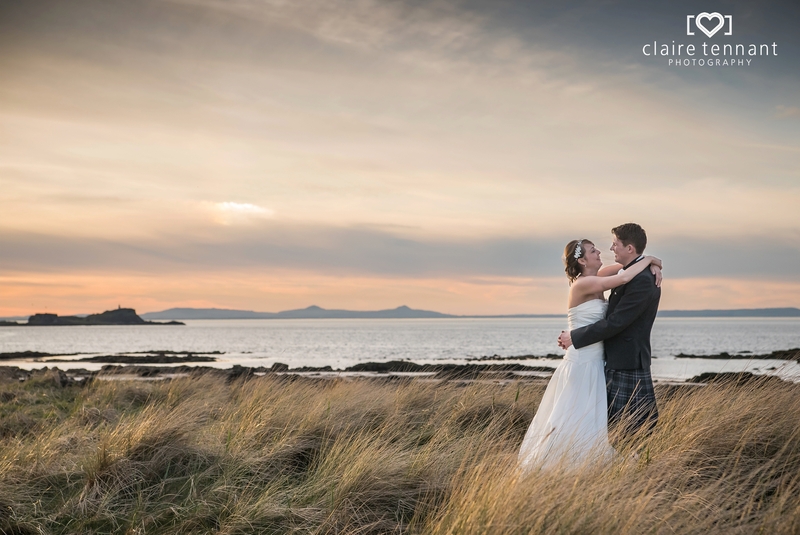 As it was such a nice day we decided to do the majority of the couple shots after dinner on the beach. 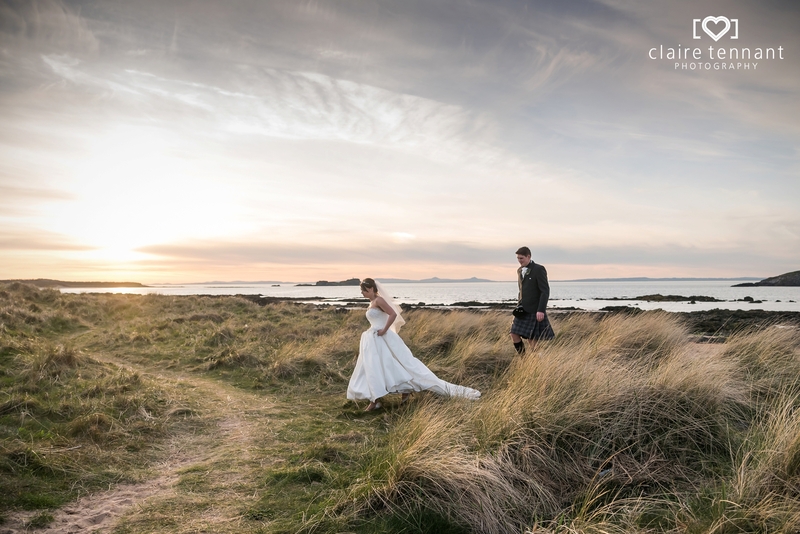 We timed it perfectly and just as we arrived at the beach the sun started to go down. 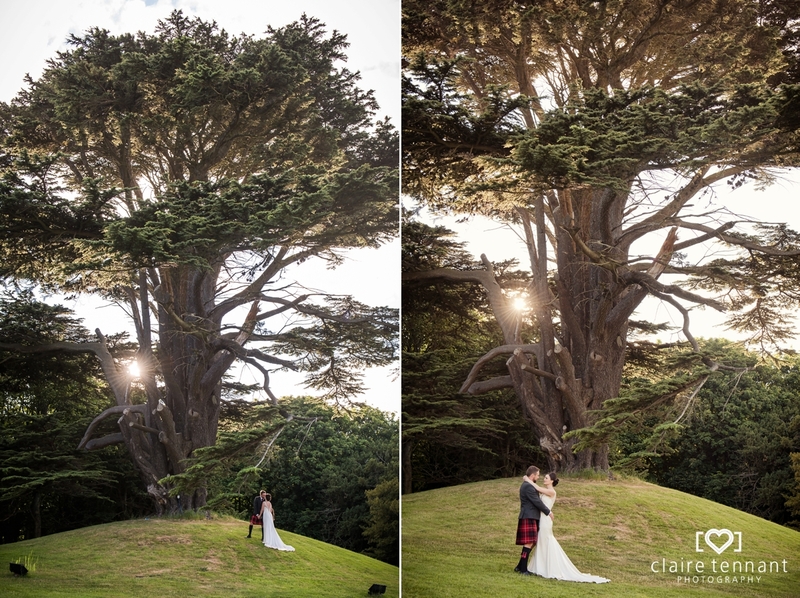 You can’t beat that beautiful soft golden hour light for portraits. 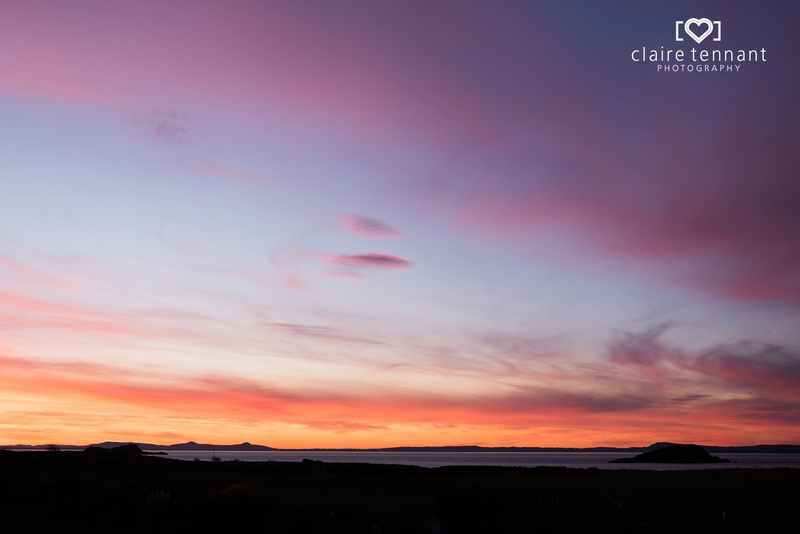 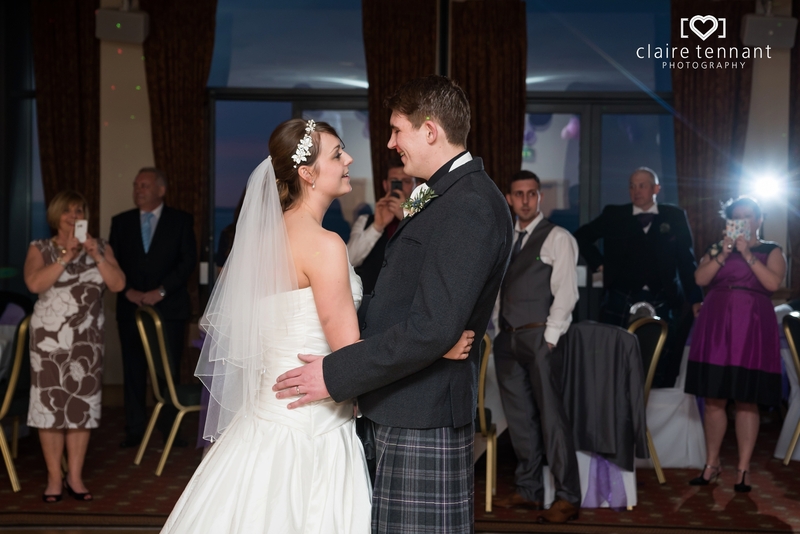 Then it was back to Macdonald Marine Hotel for the evening dancing. 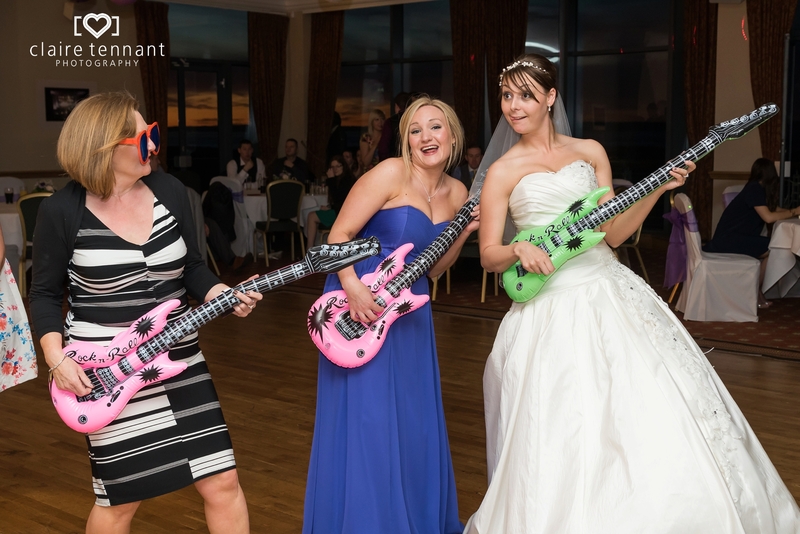 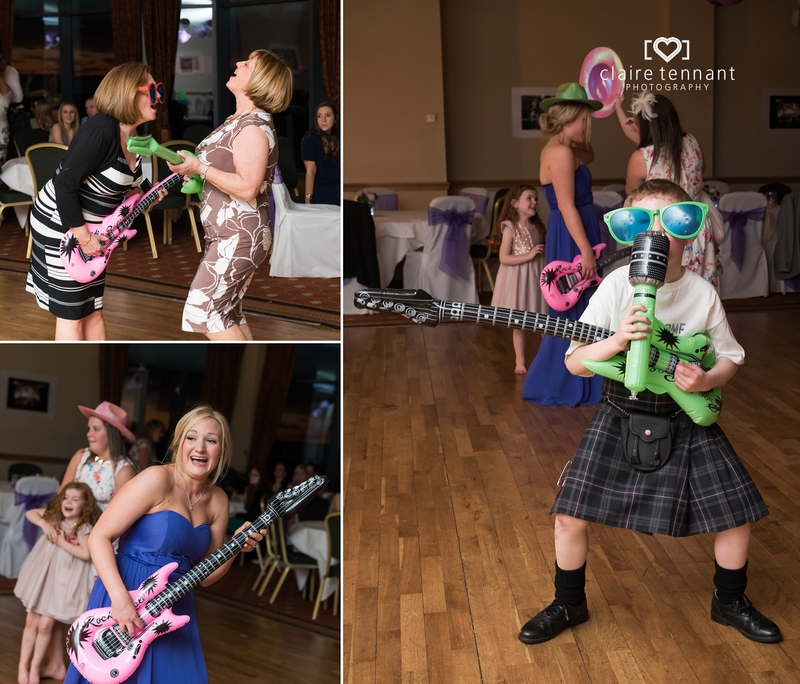 The props went down a storm and caused much hilarity on the dance floor! 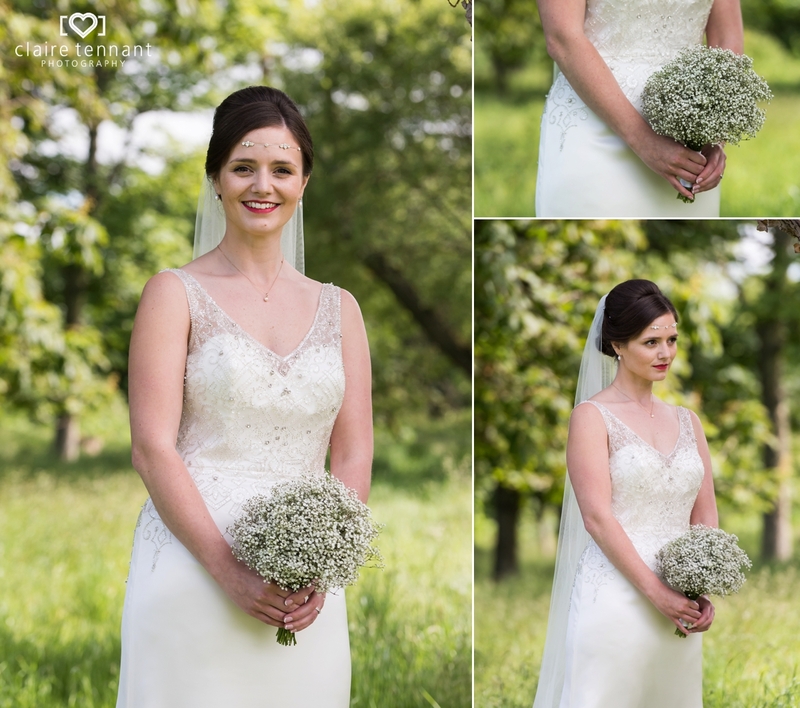 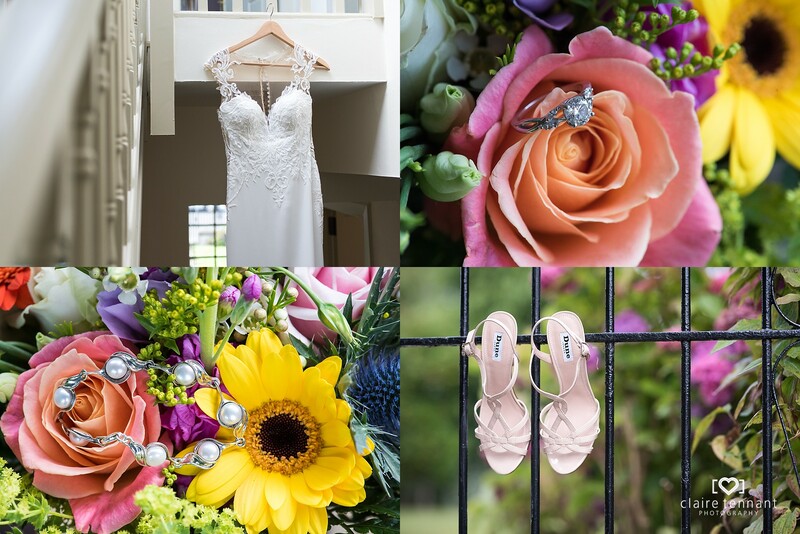 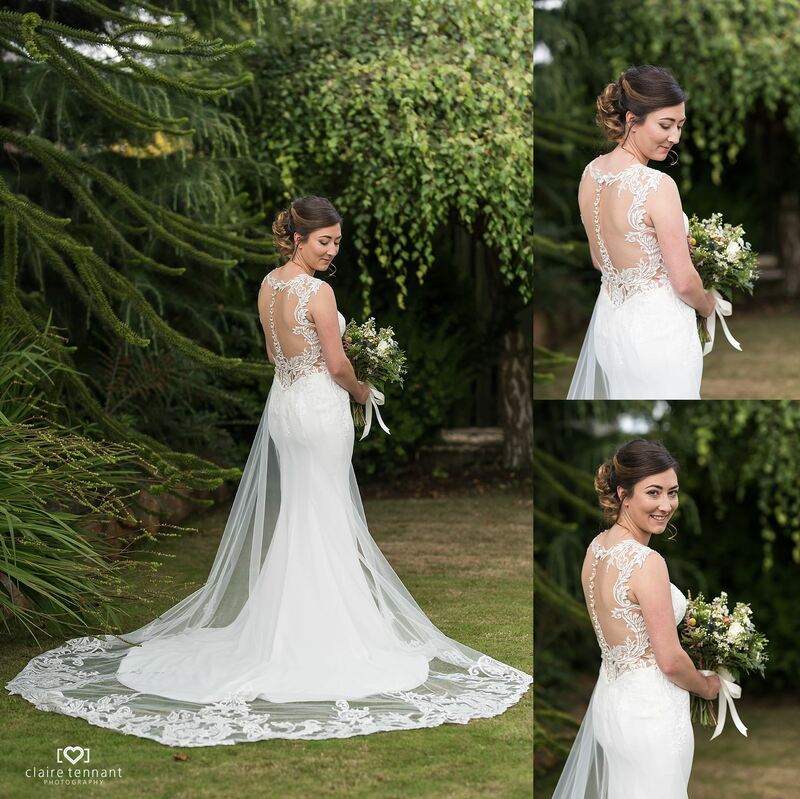 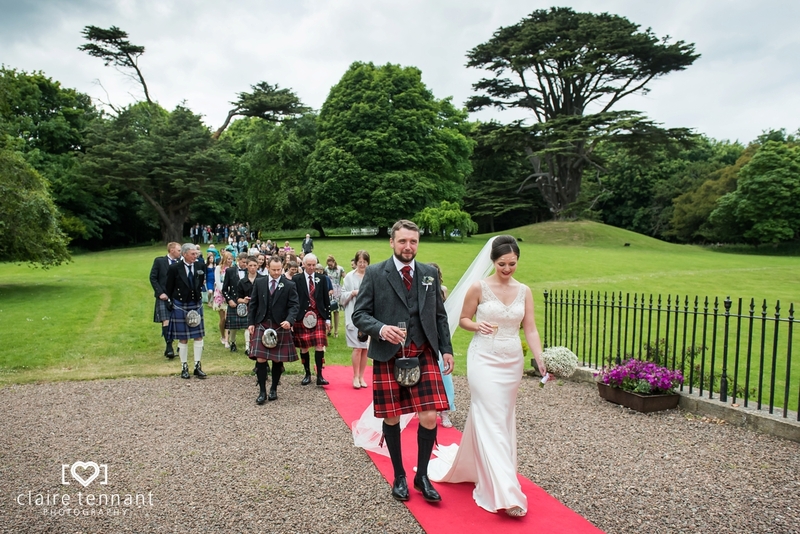 I loved photographing Lindy and Gordon’s beautiful Summer wedding at Broxmouth Park. 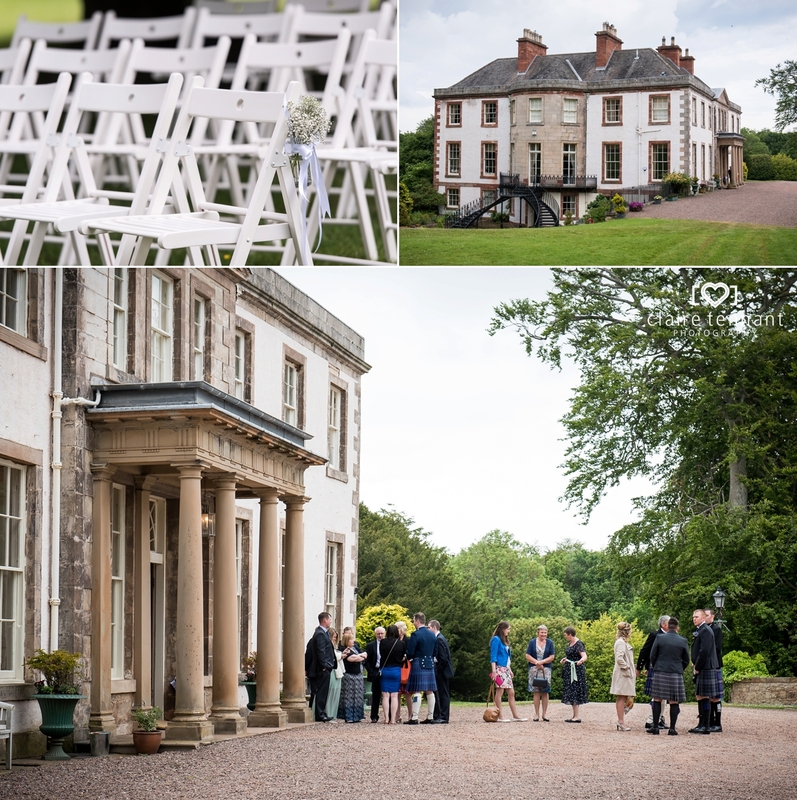 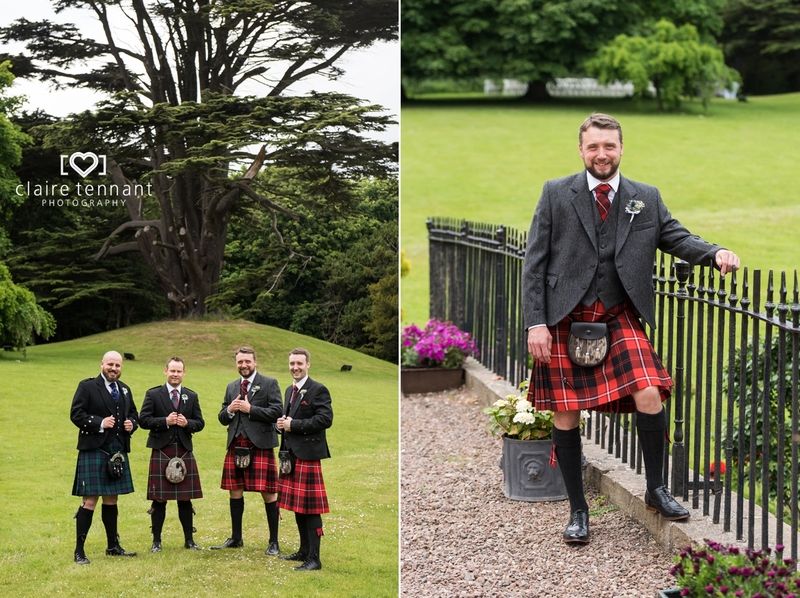 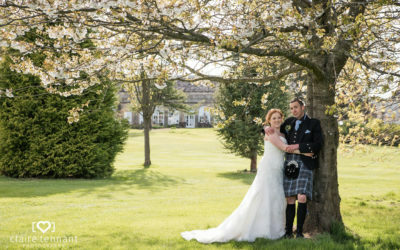 The venue and grounds are absolutely stunning with so many fantastic locations for photos and to top it off Lindy and Gordon are such lovely people who never stopped smiling. 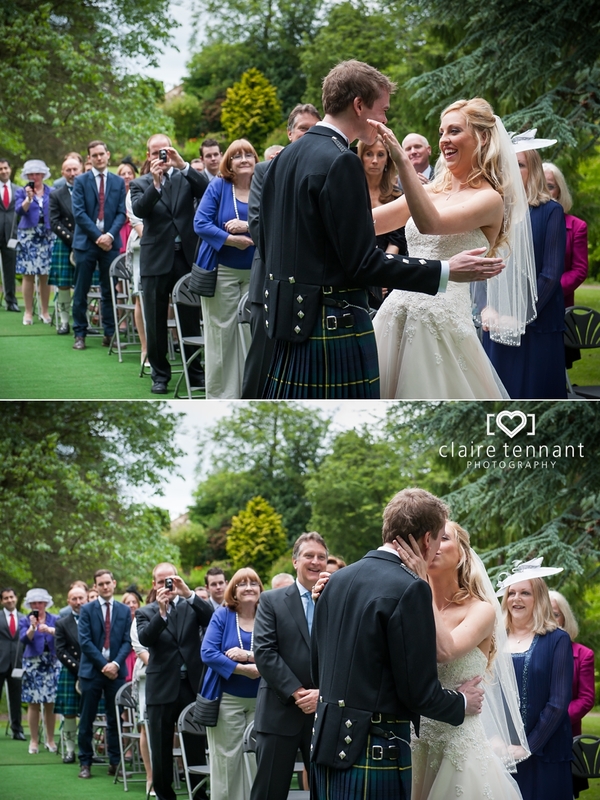 They had both dreamt of an outdoor ceremony but the weather was wet and cloudy in the morning. 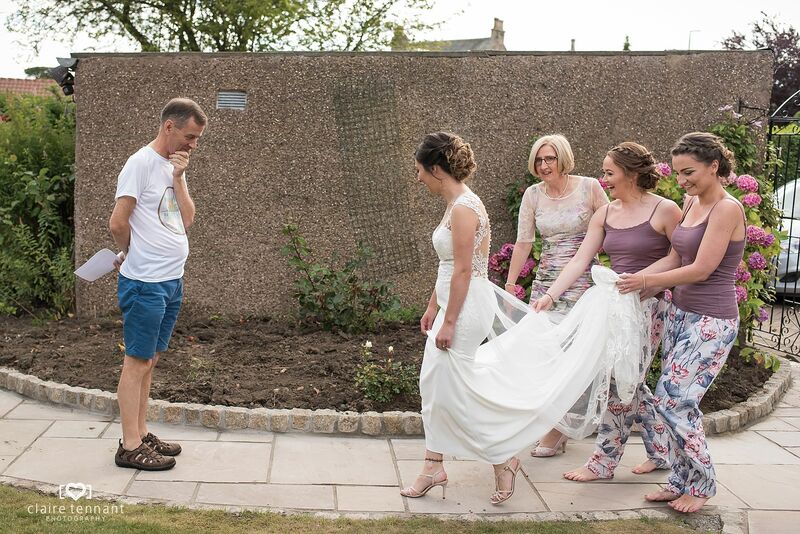 Luckily it began to improve just in time about an hour before the ceremony, so made the call to go ahead with the outdoor plans. 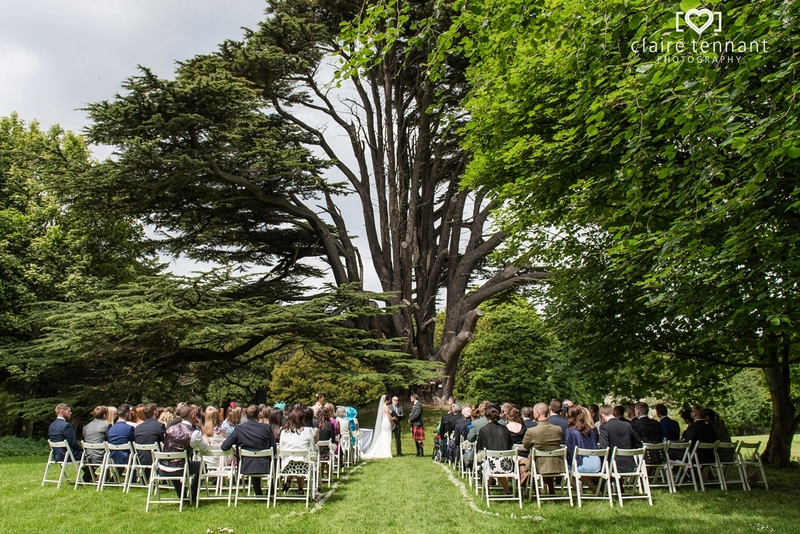 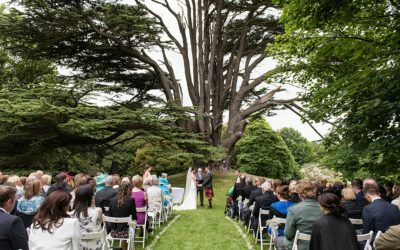 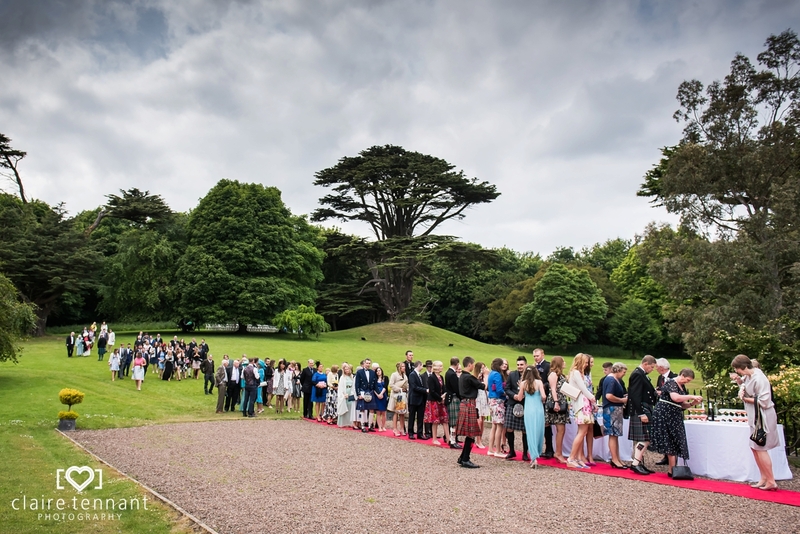 The ceremony was held up a slight slope and in front of a giant tree which was a very picturesque location. 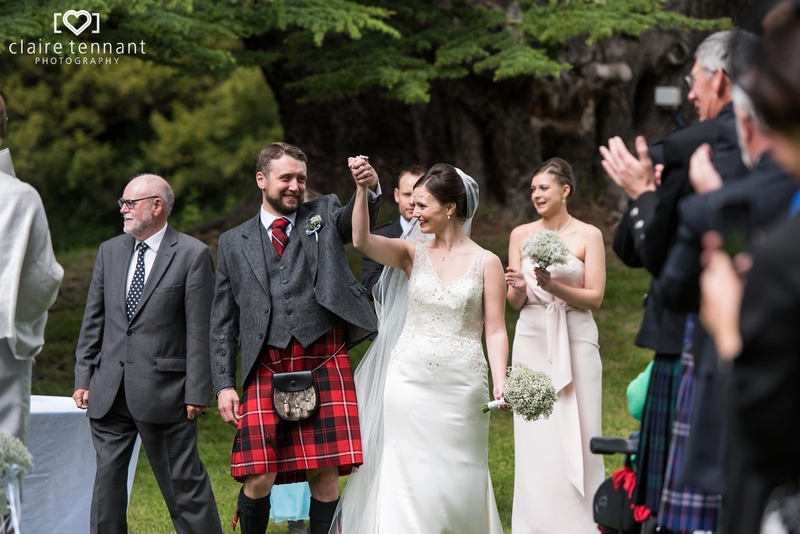 After the ceremony Lindy and Gordon mingled with their guest for a little while before starting the official group photos. 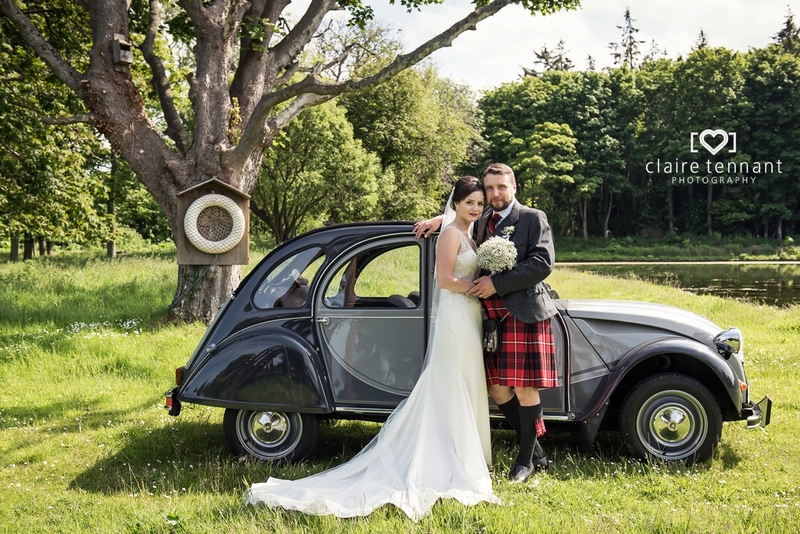 Gordon’s Dad had brought his vintage Citroen car along to the wedding which proved very useful as he drove us along to the pond on Broxmouth’s grounds and it also made a cool prop for some photos! 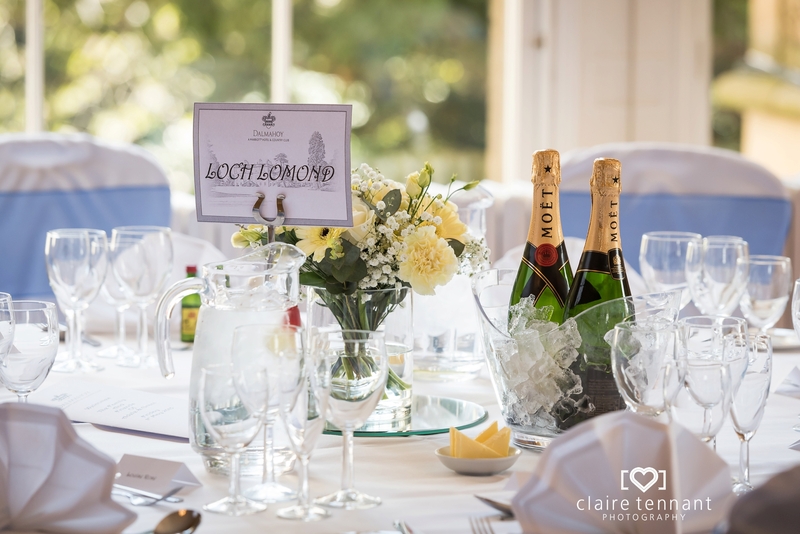 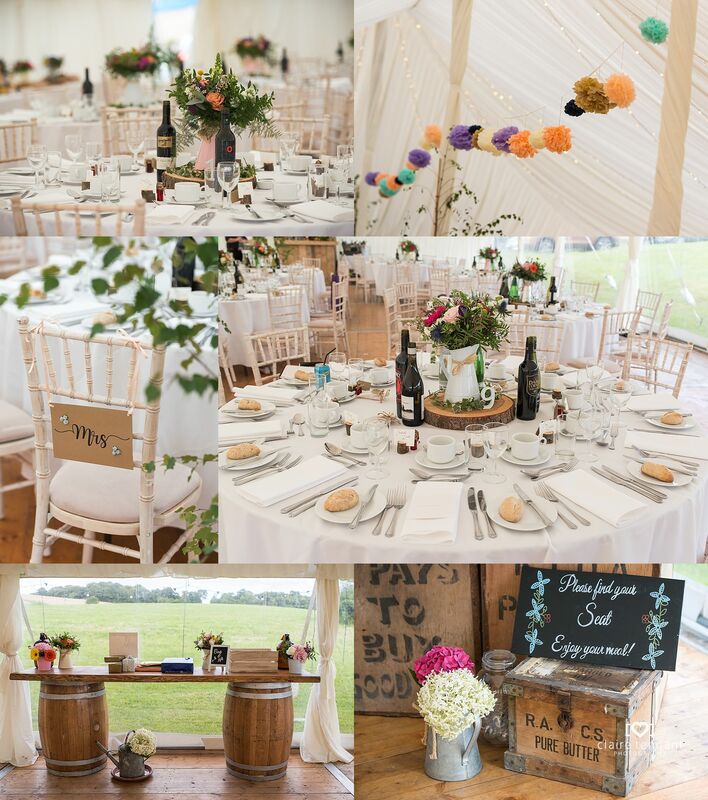 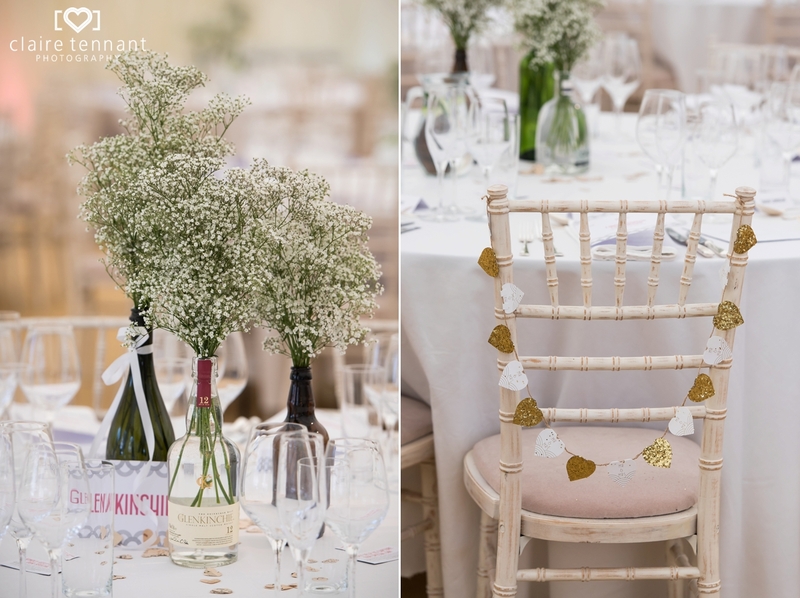 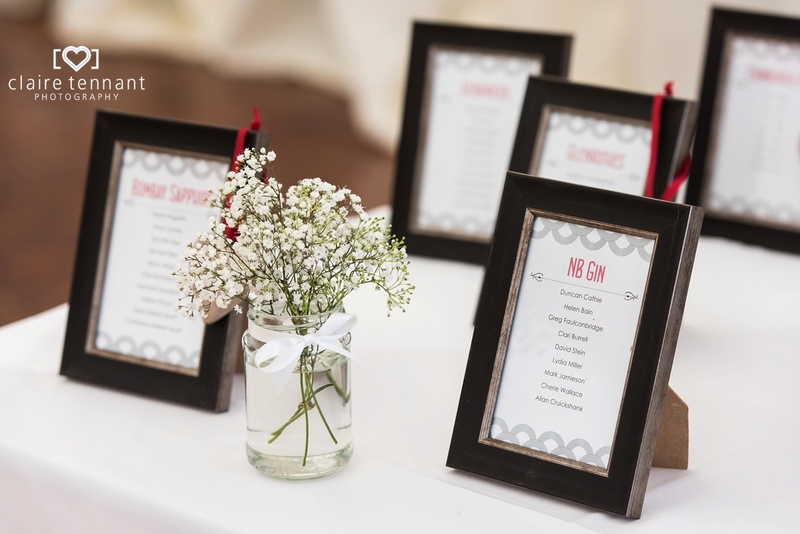 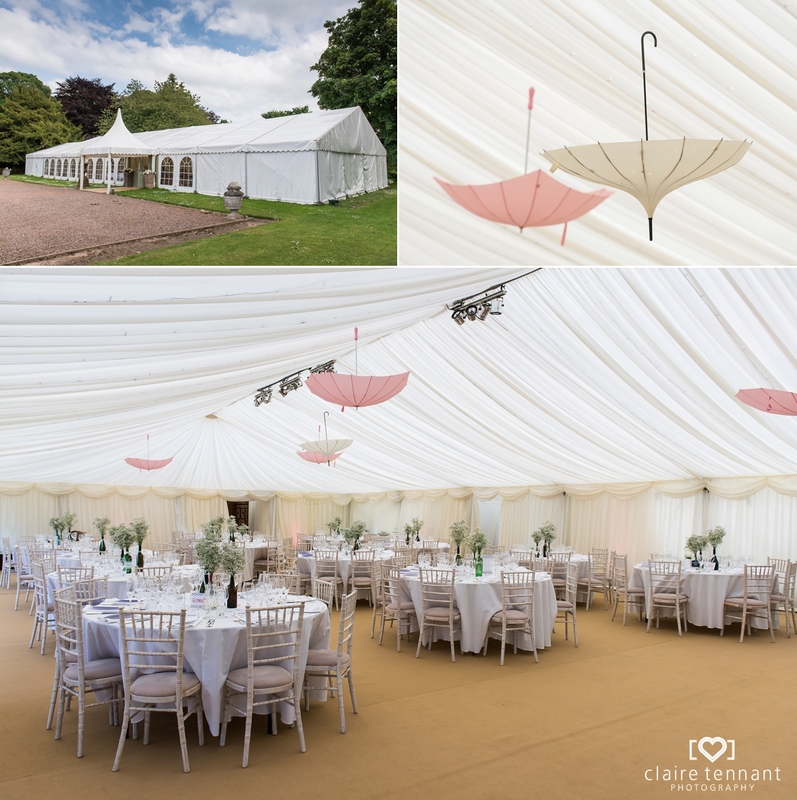 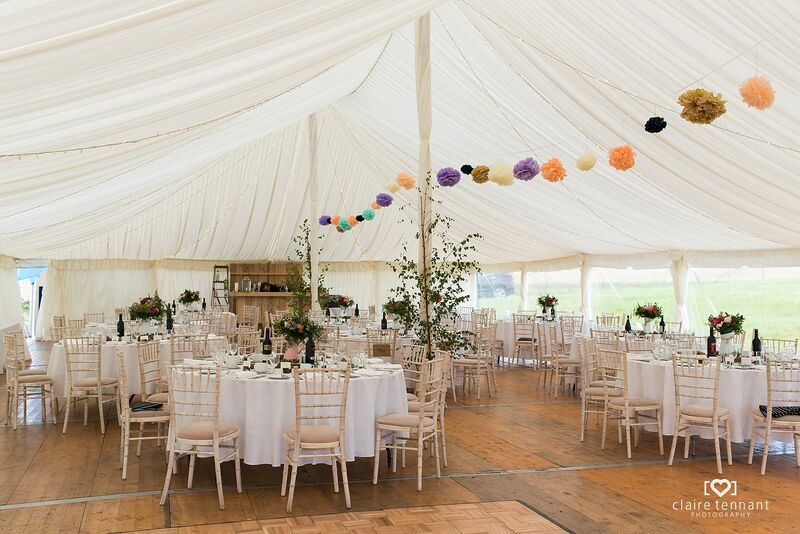 Lindy and Gordon’s wedding breakfast was held in a large marquee which had been decorated with lots of lovely details. 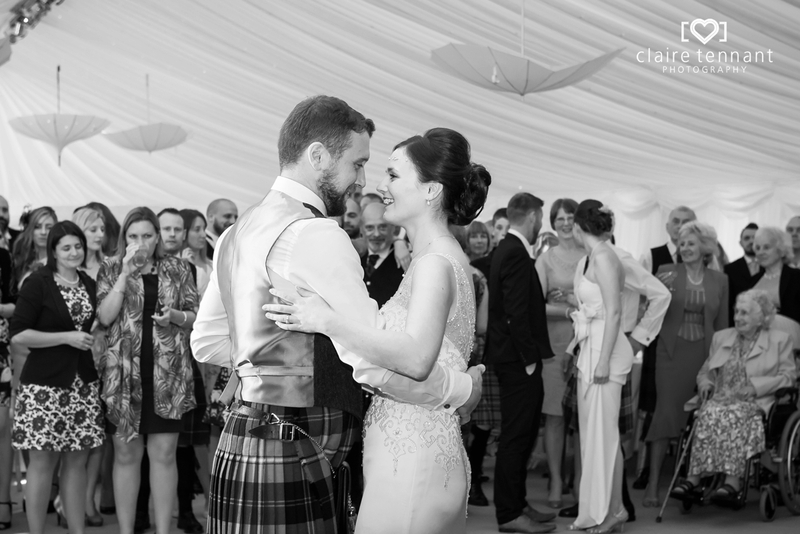 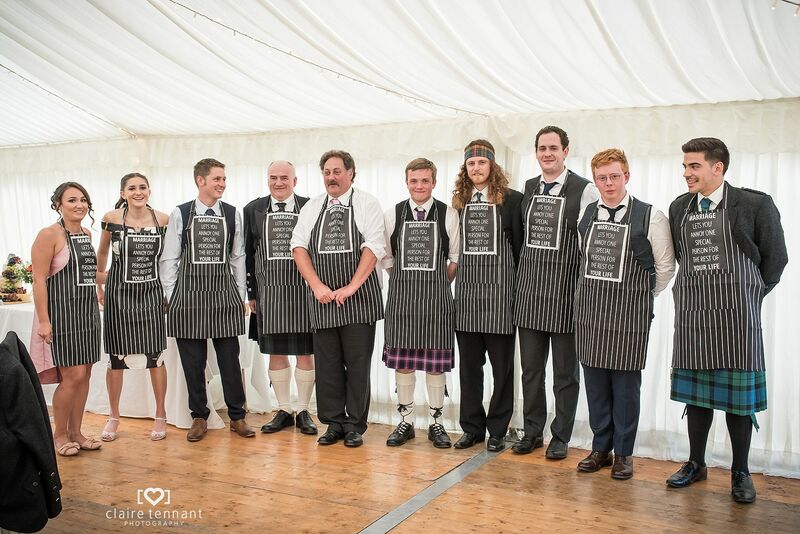 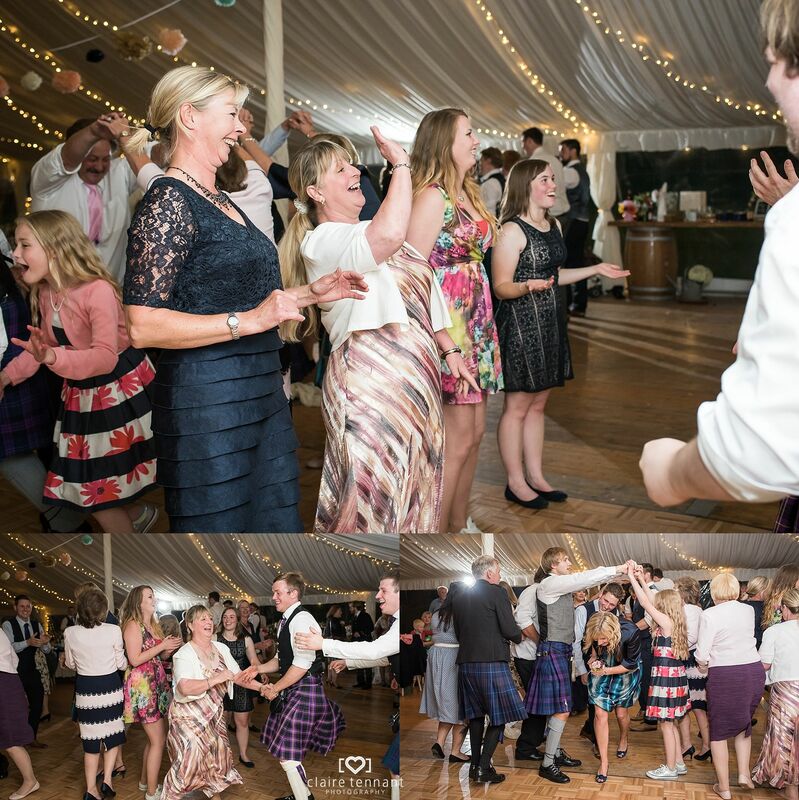 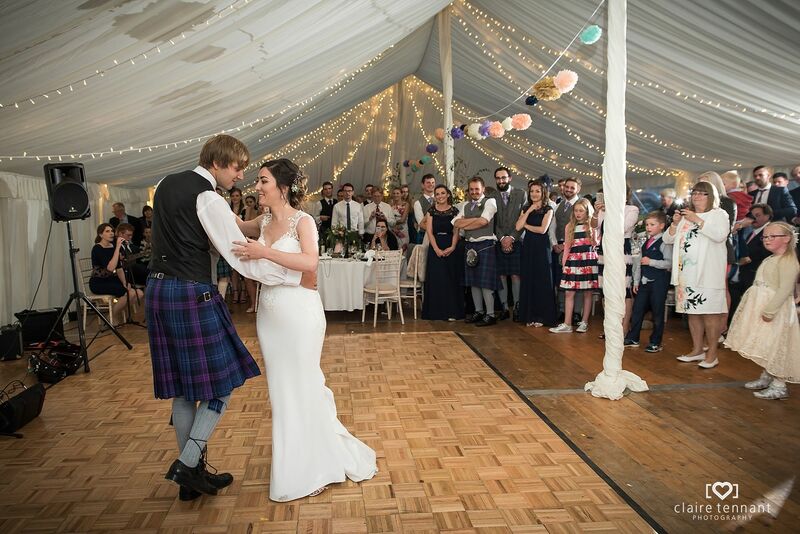 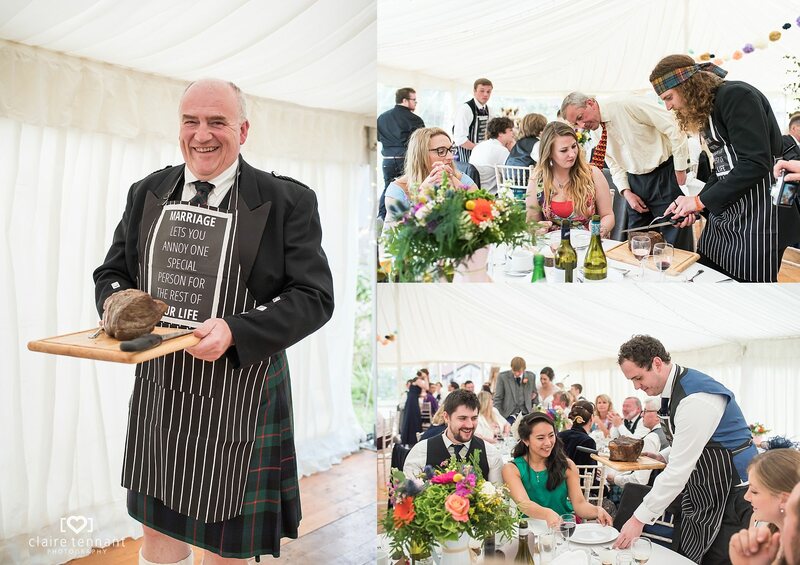 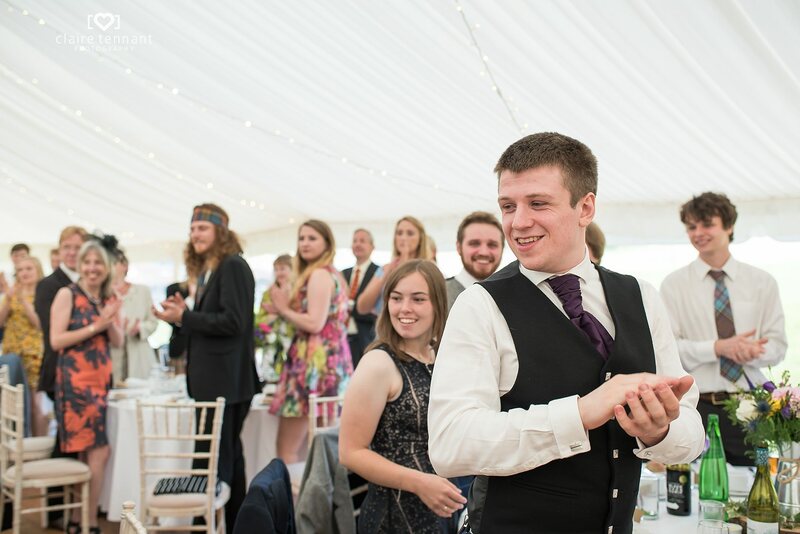 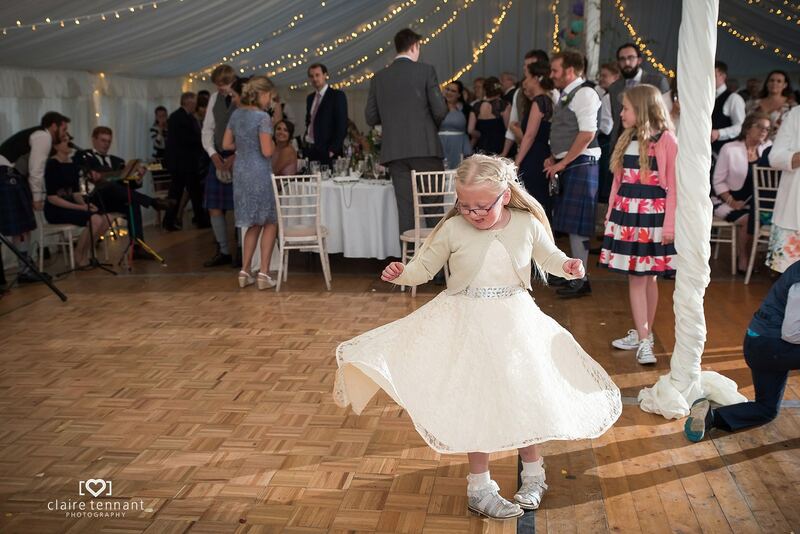 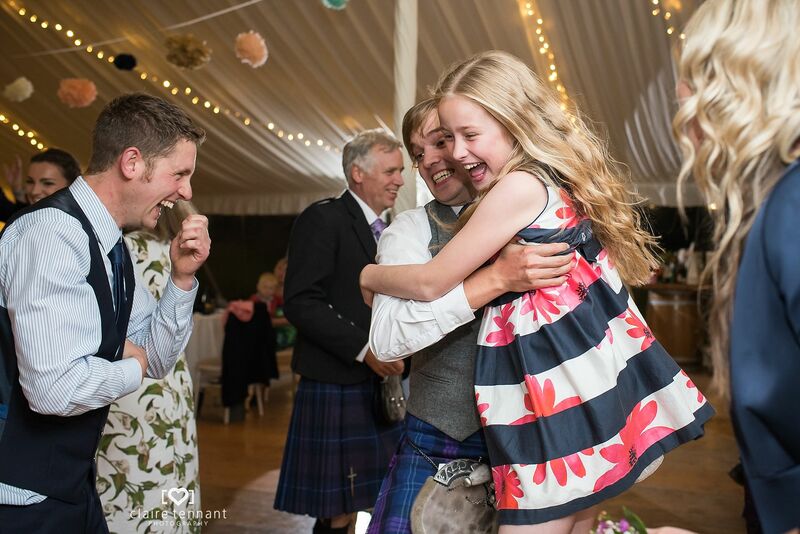 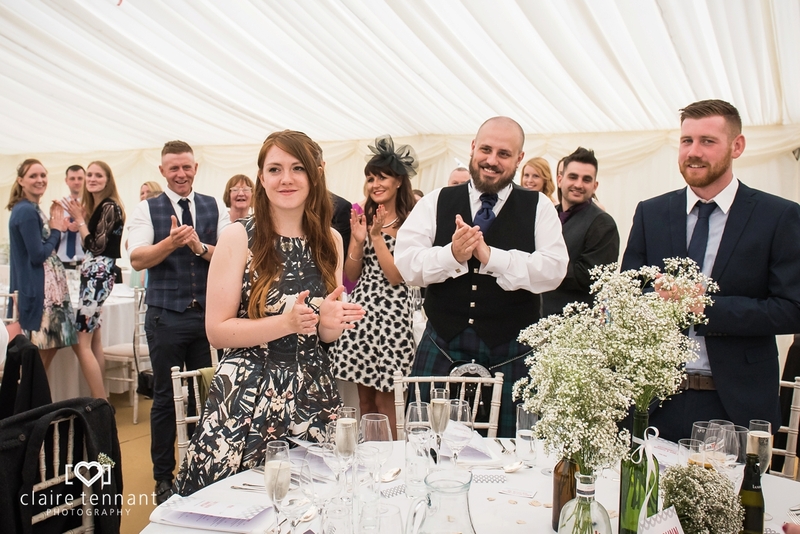 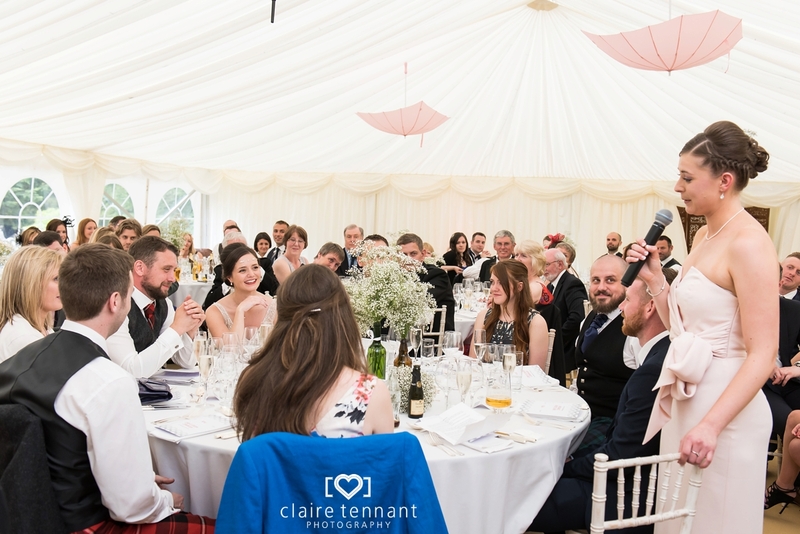 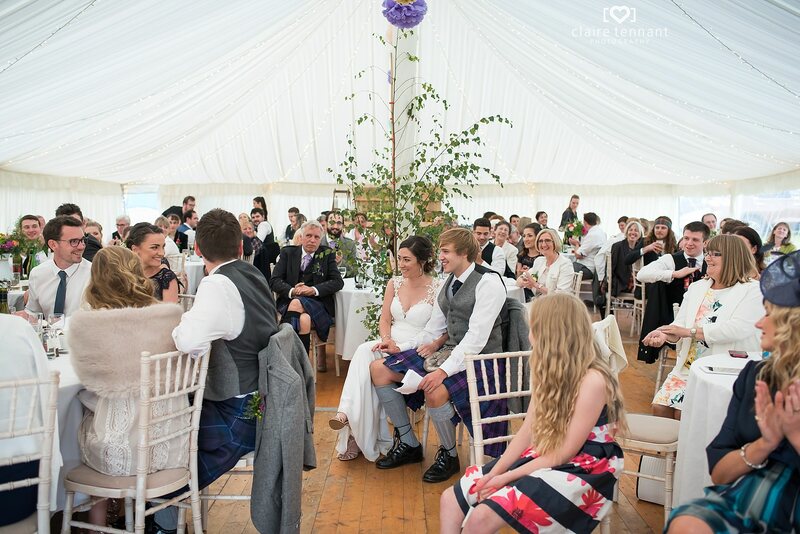 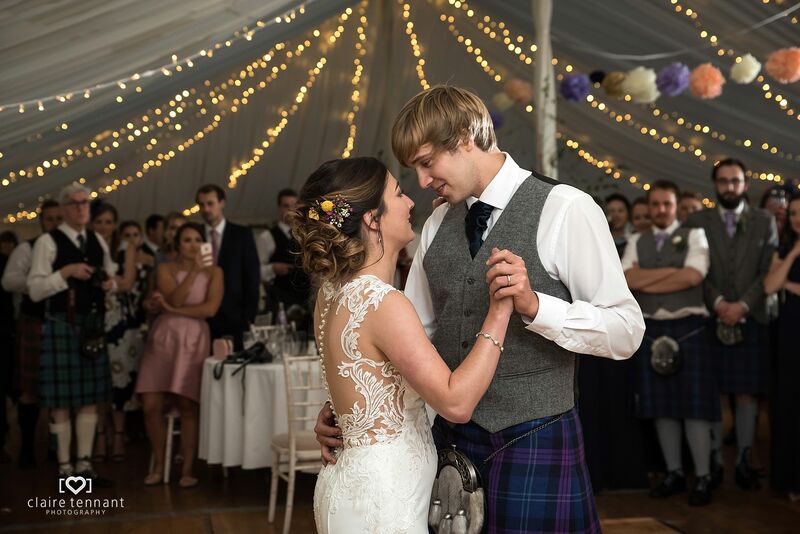 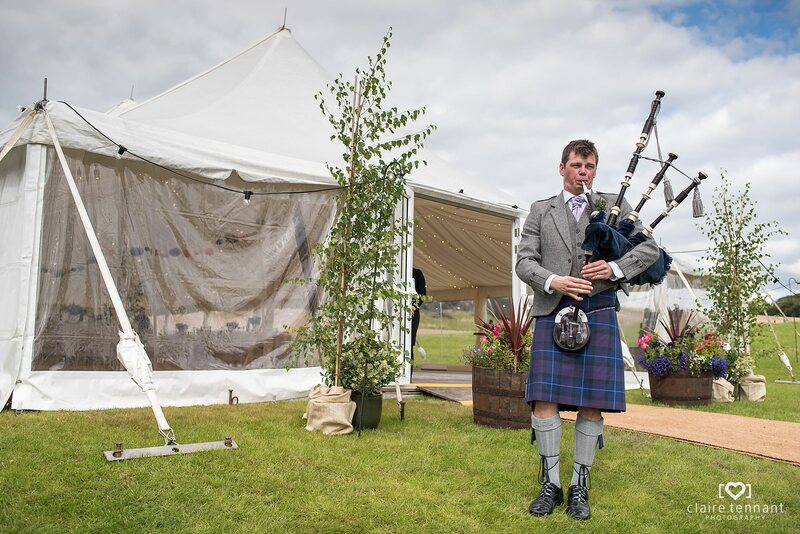 The evening celebrations continued in the marquee and everyone danced the night away to Scottish Ceilidh music. 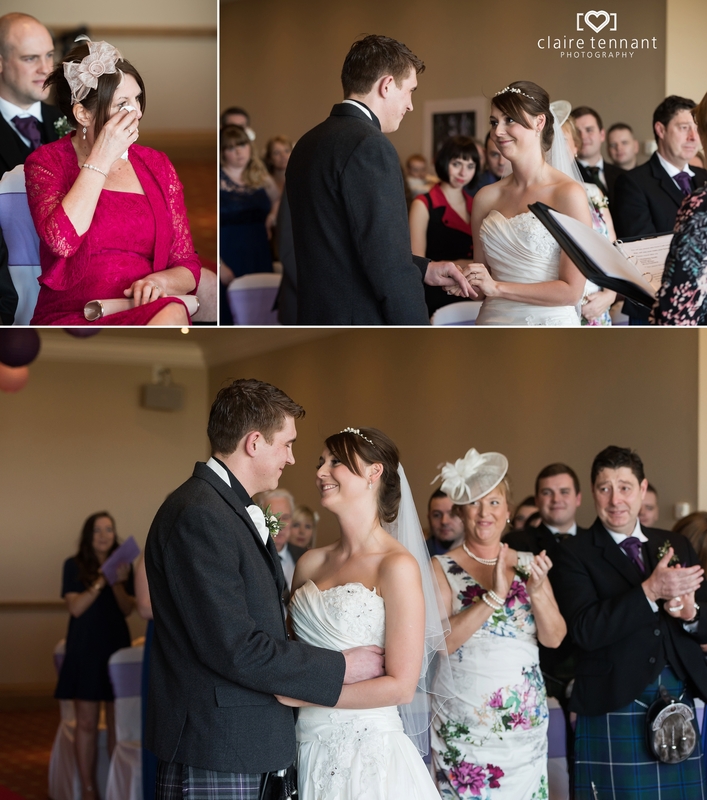 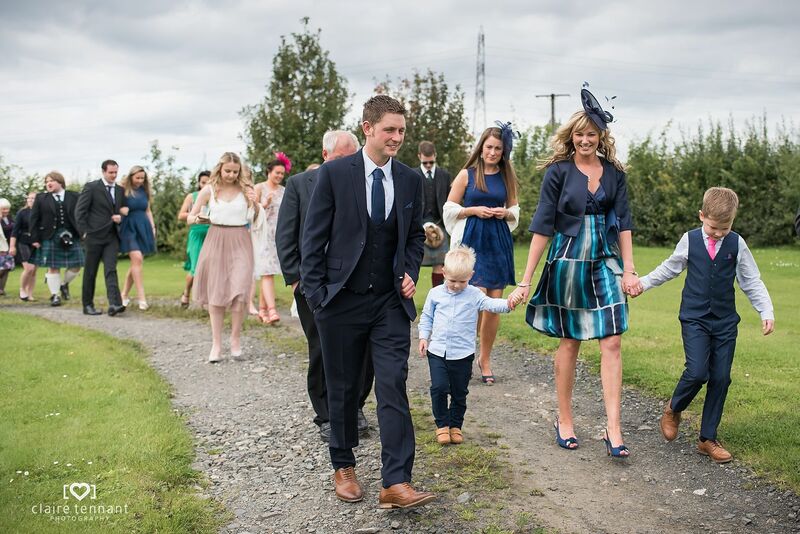 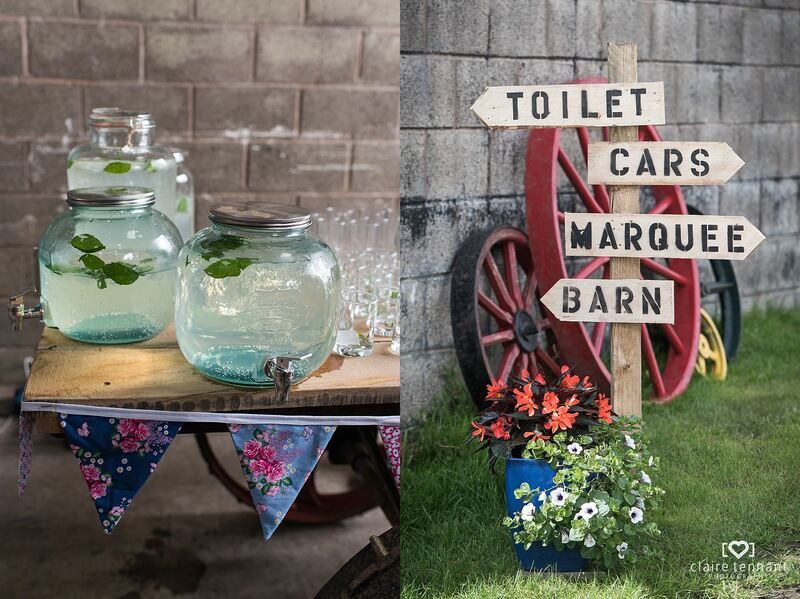 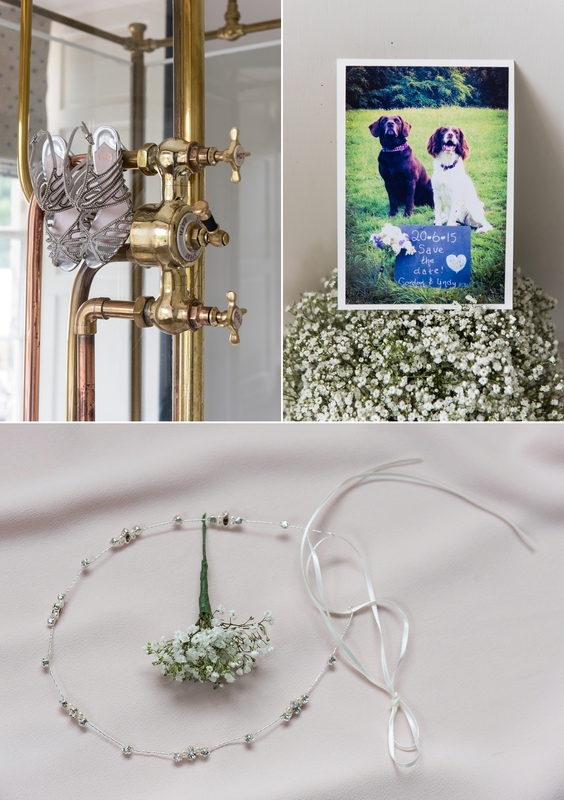 Below are a few of my favourite photos from the day, I really struggled to narrow them down! 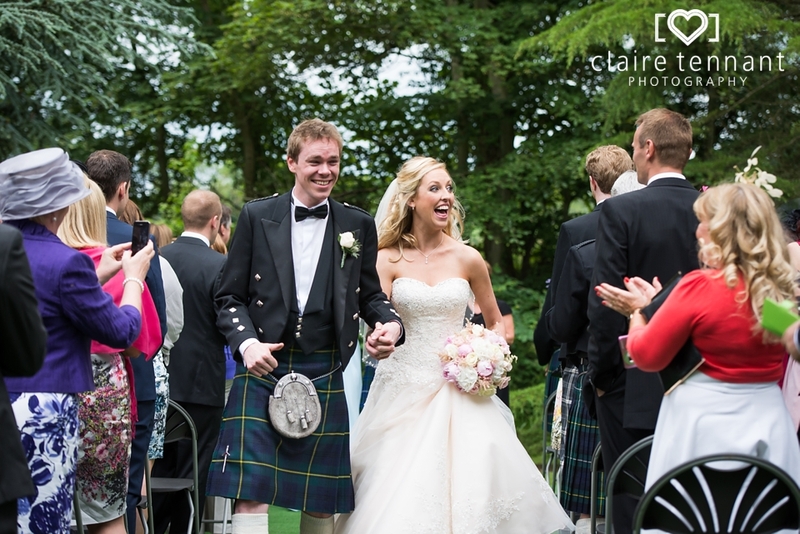 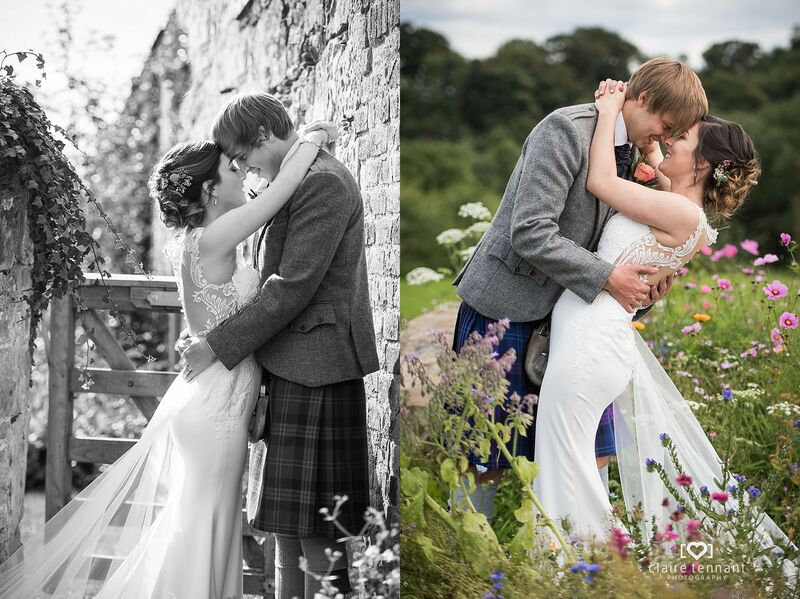 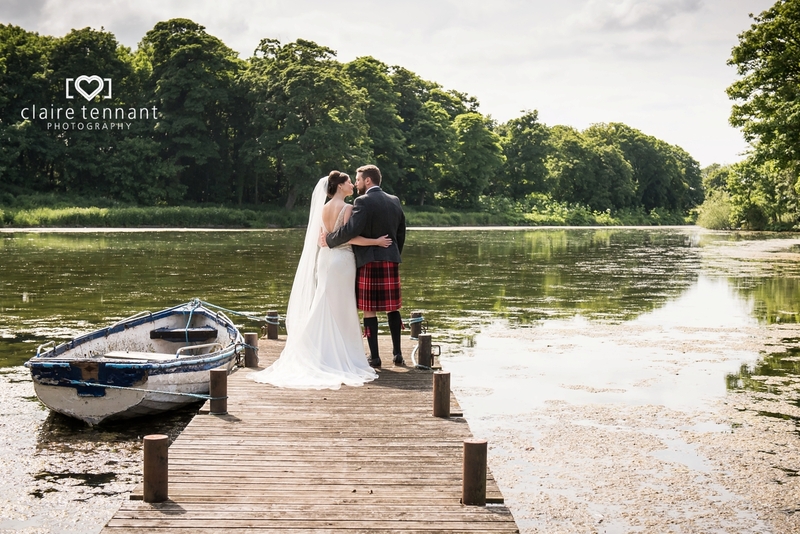 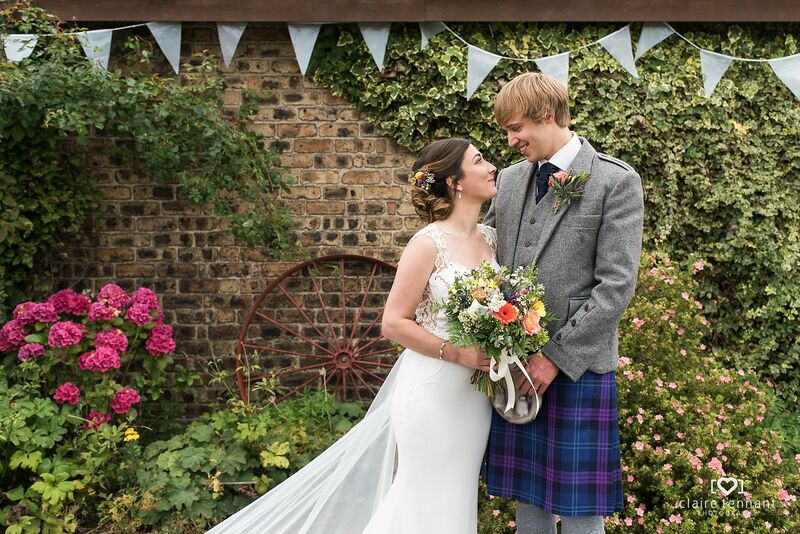 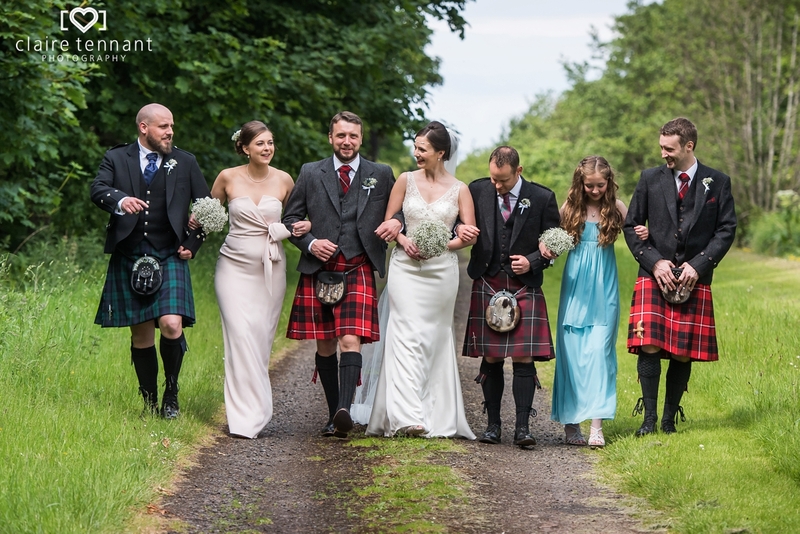 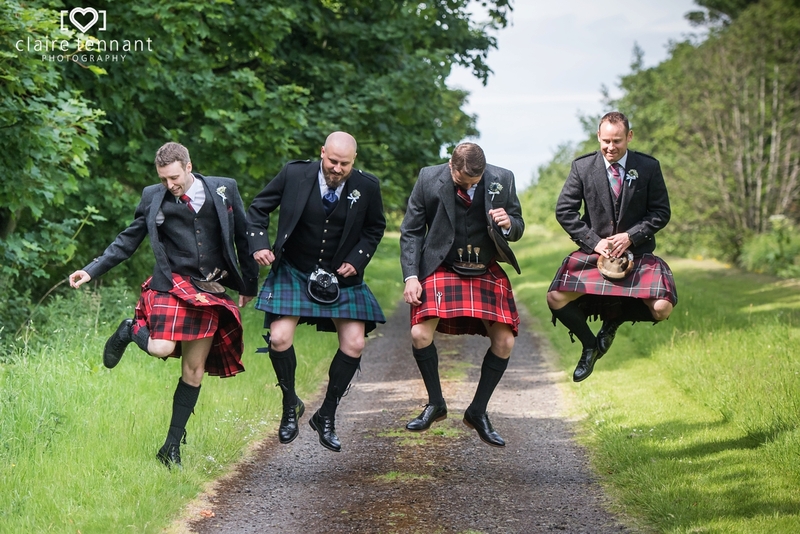 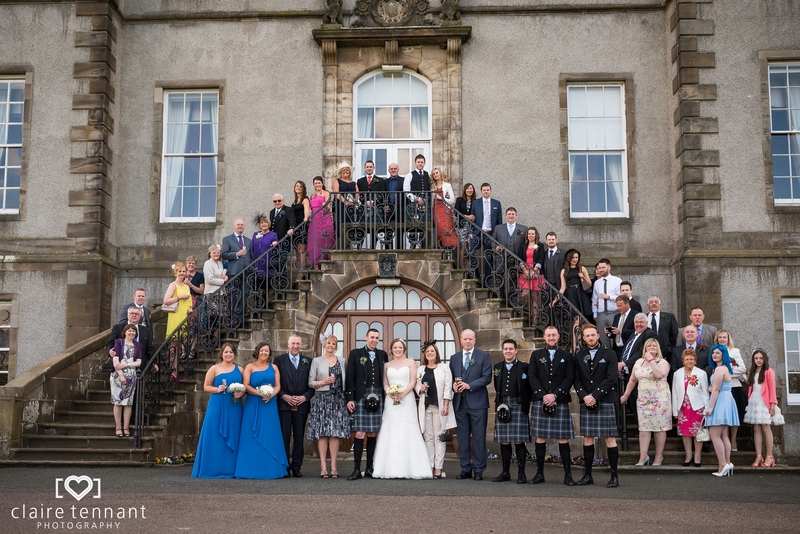 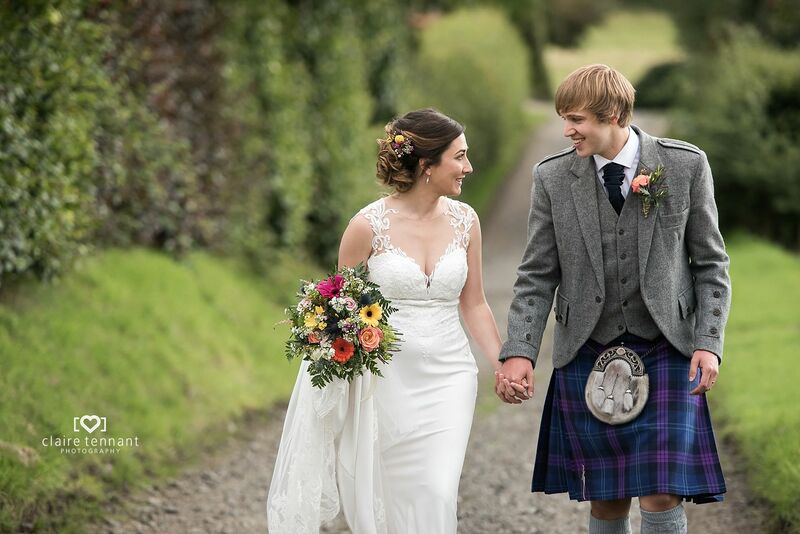 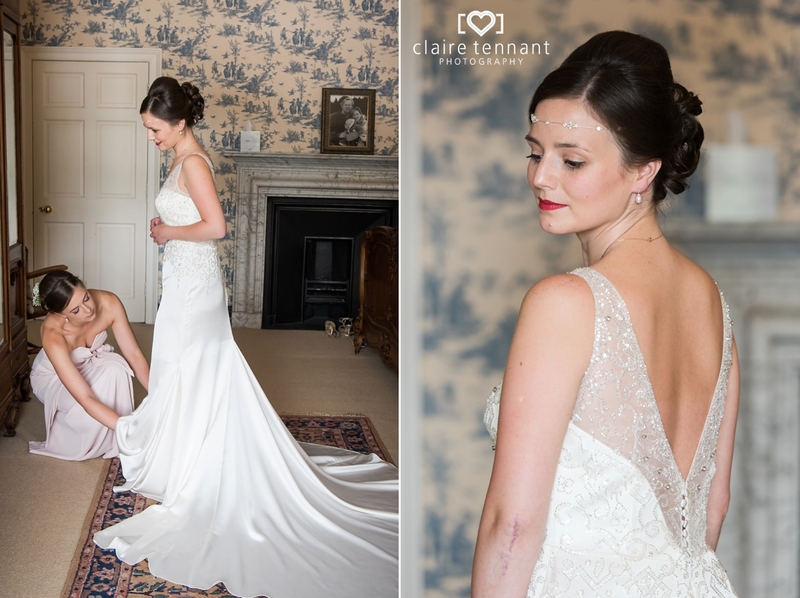 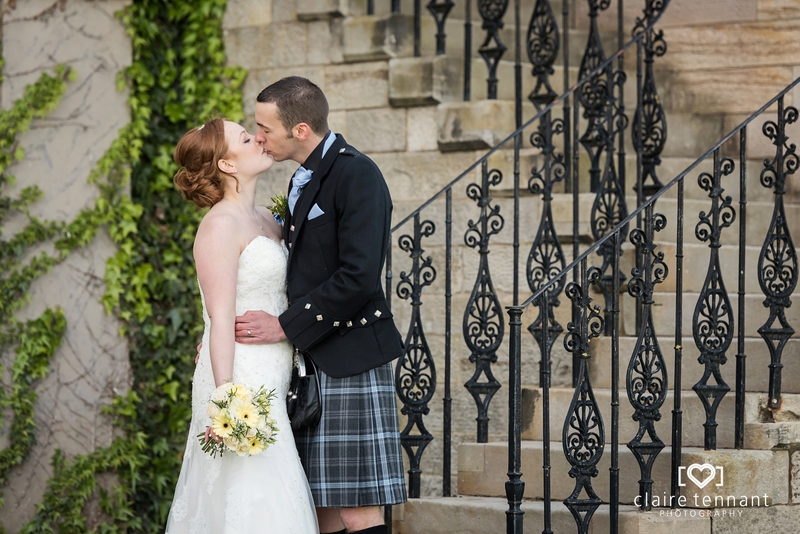 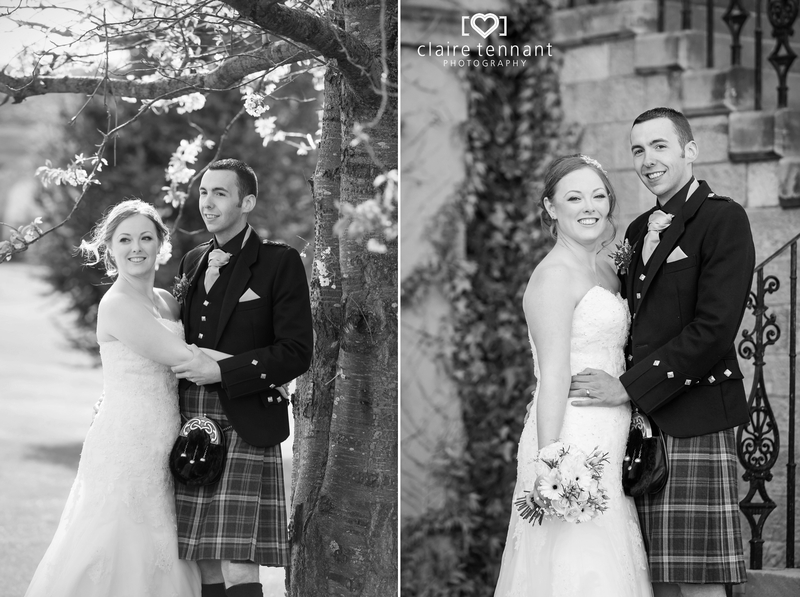 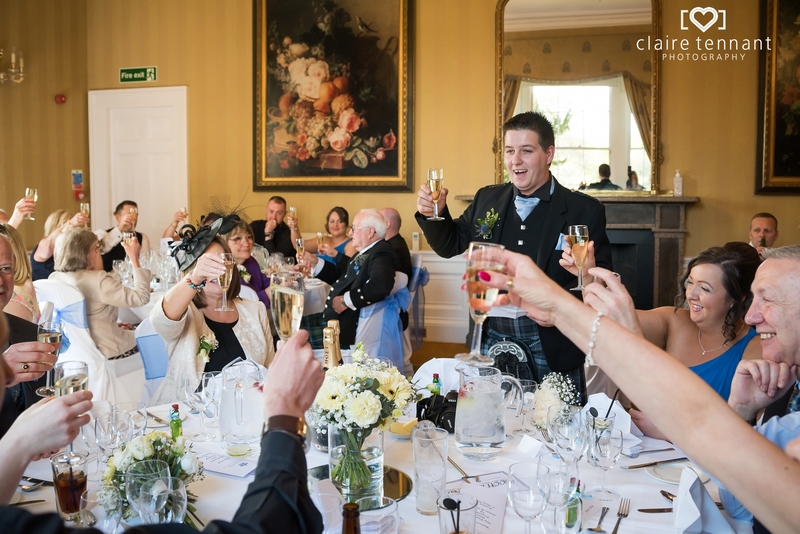 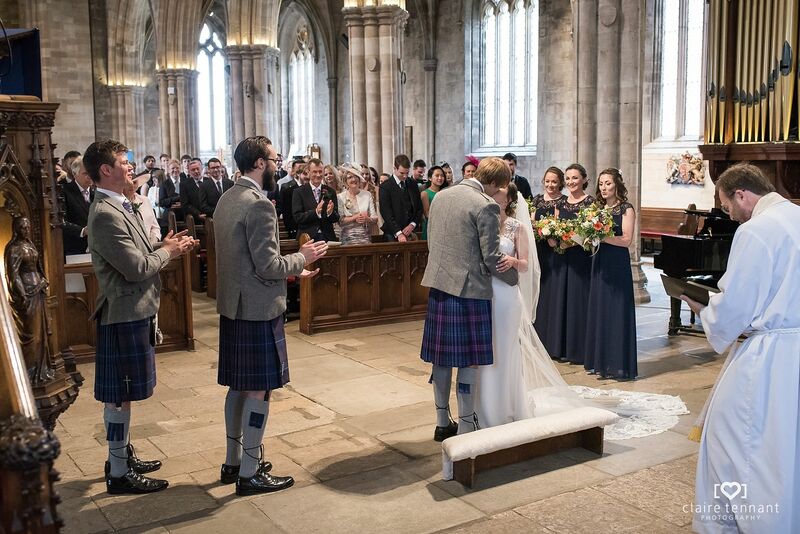 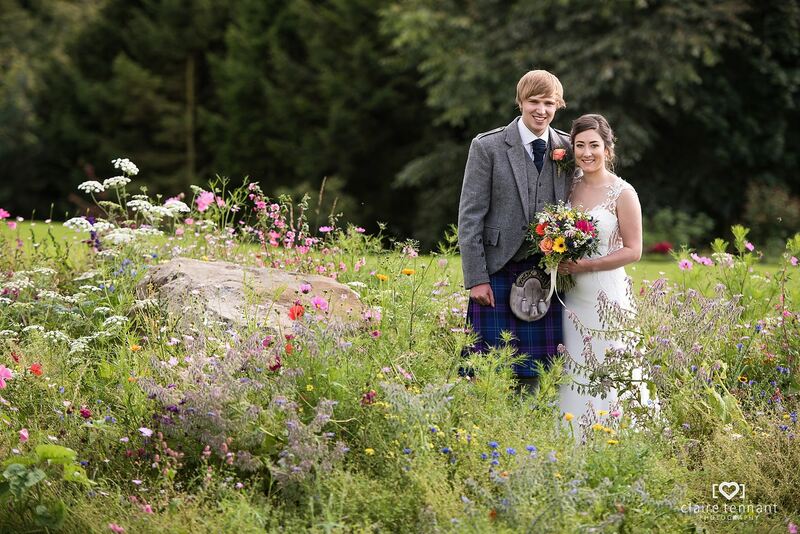 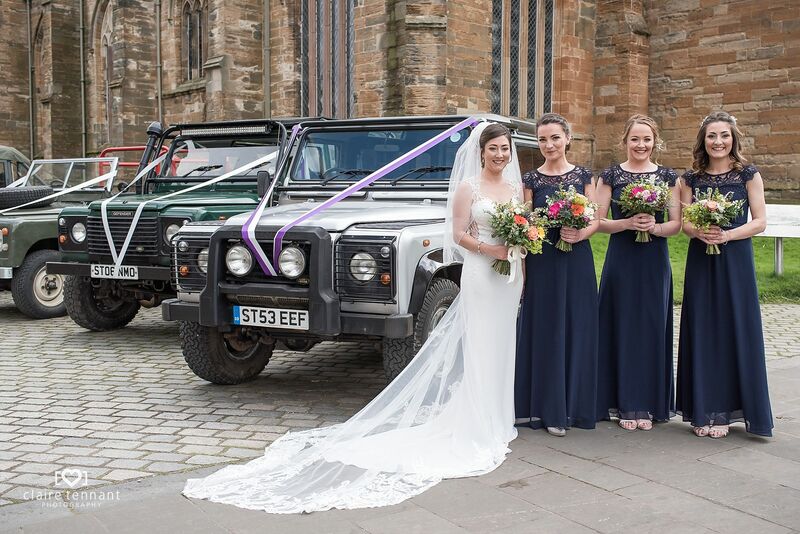 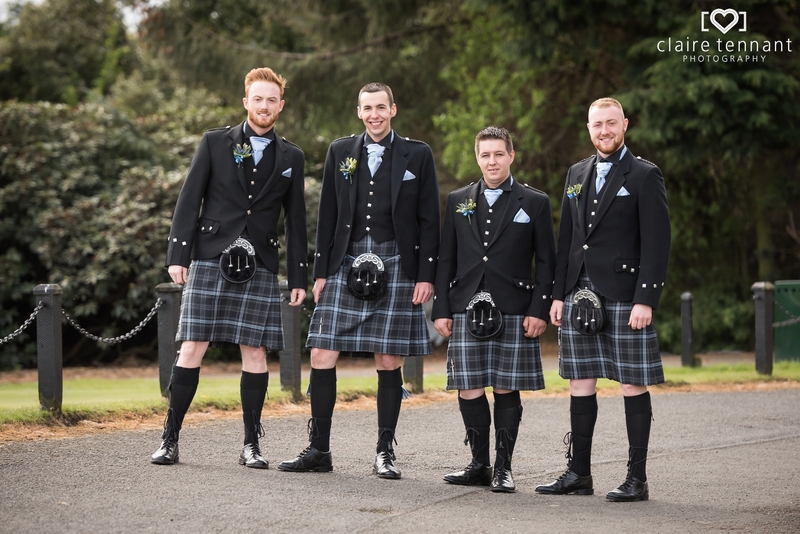 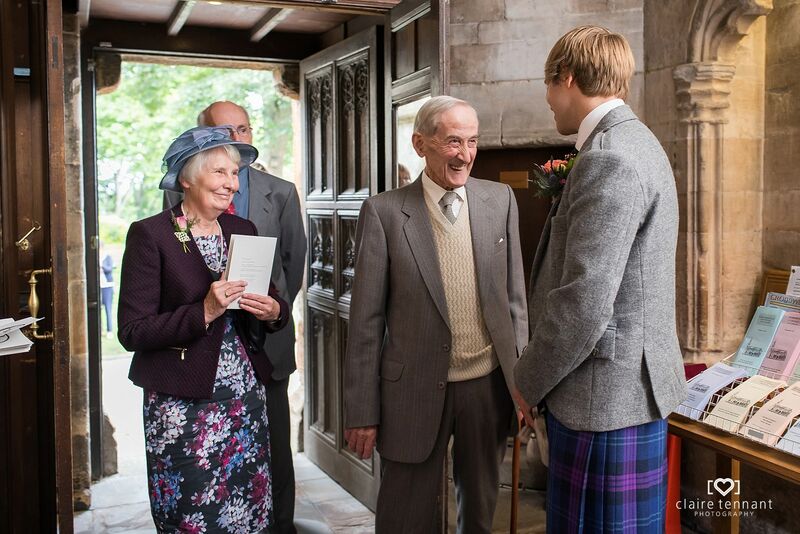 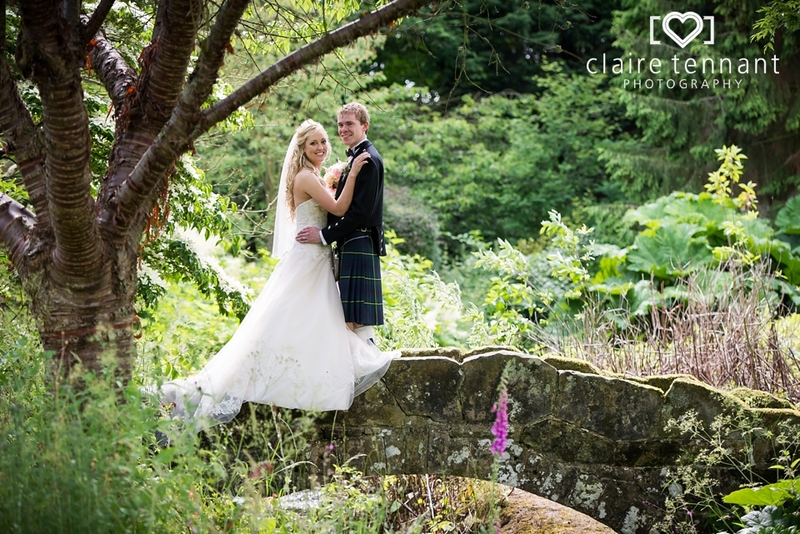 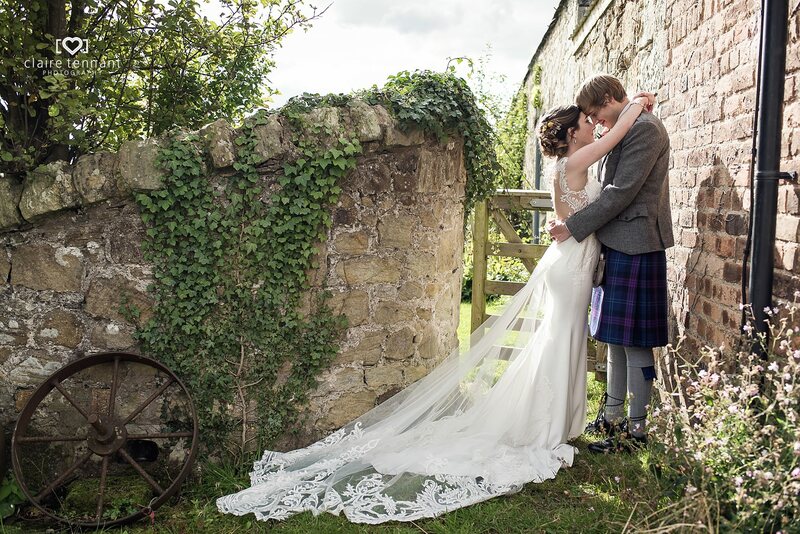 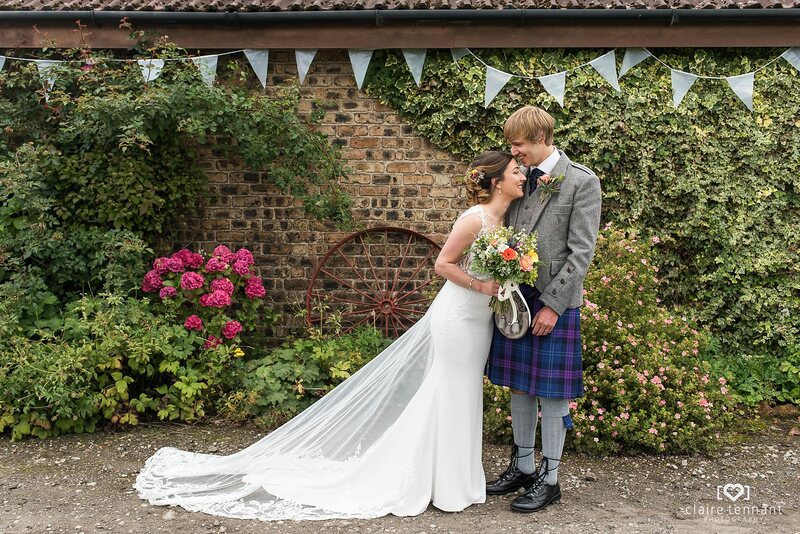 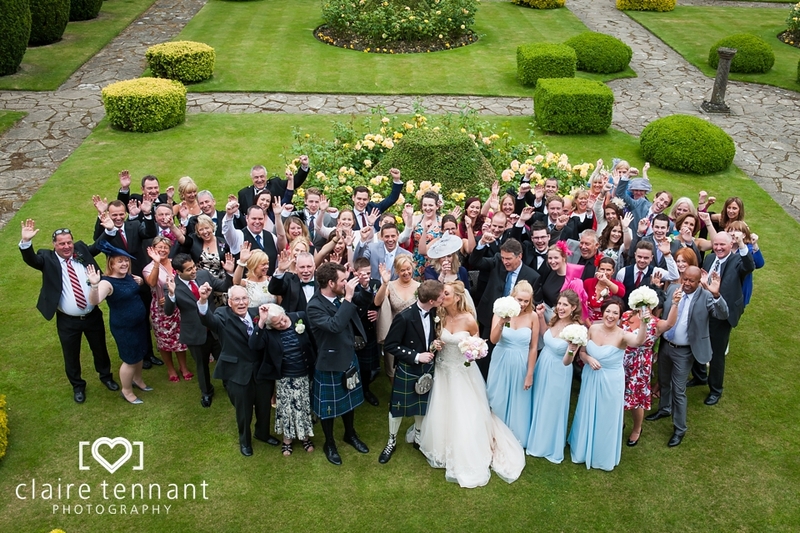 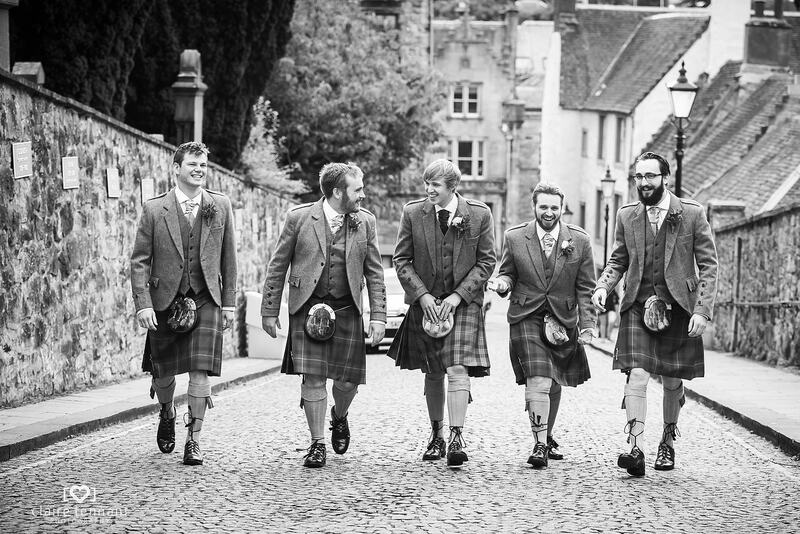 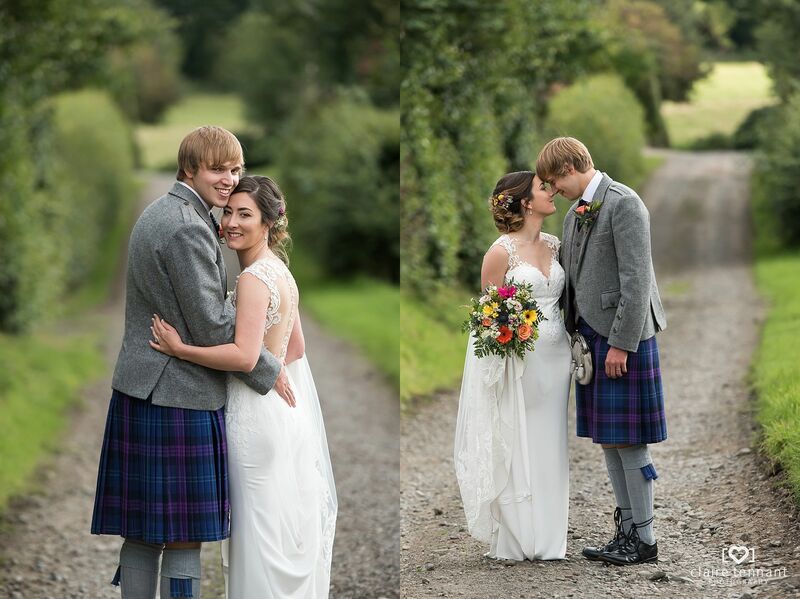 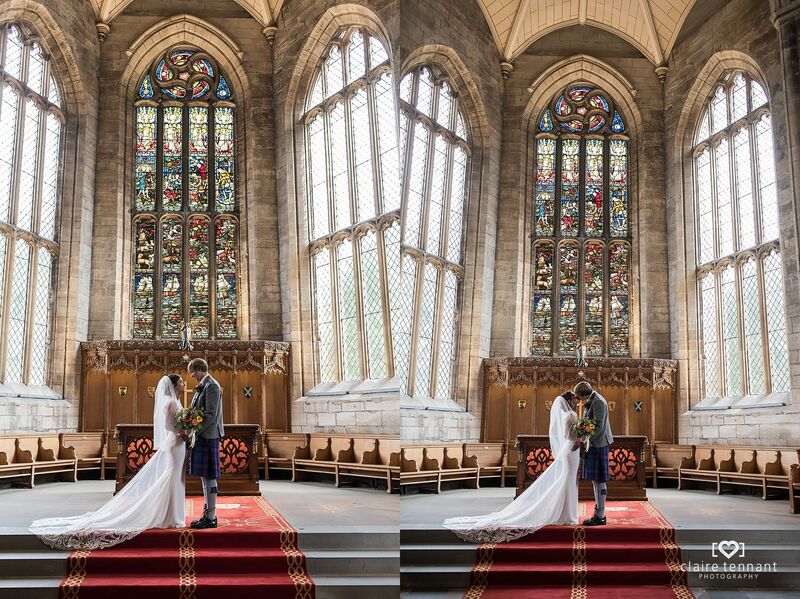 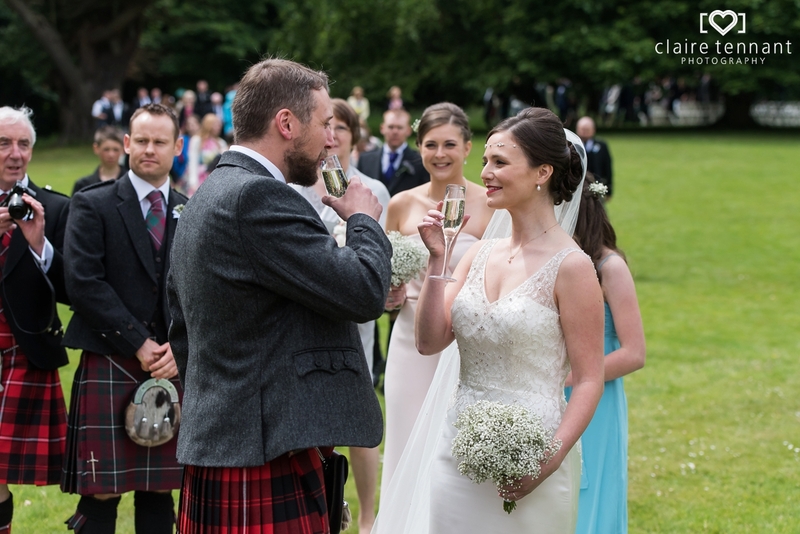 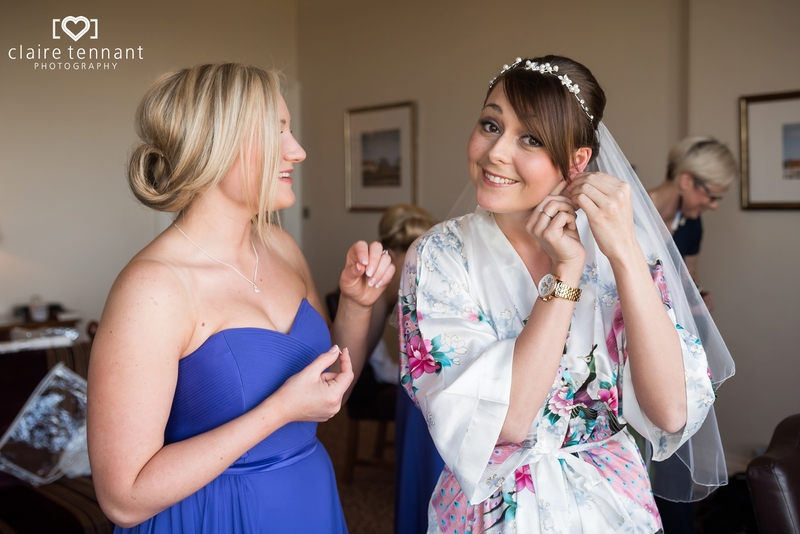 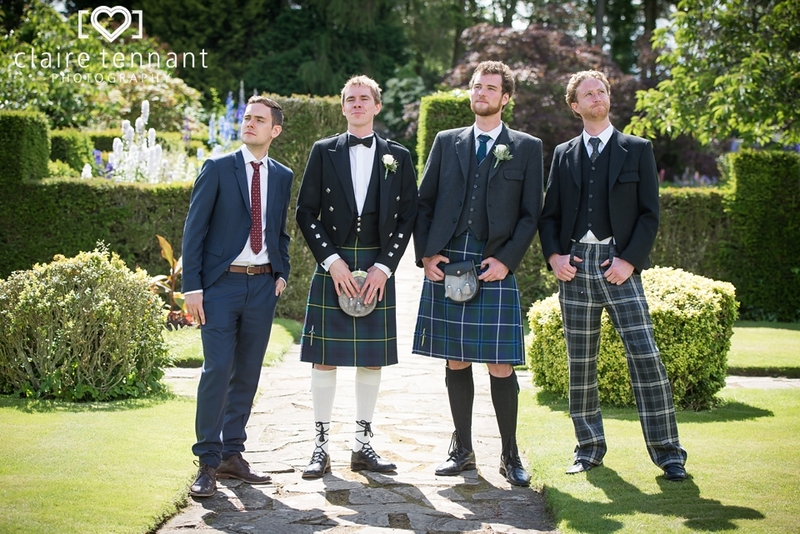 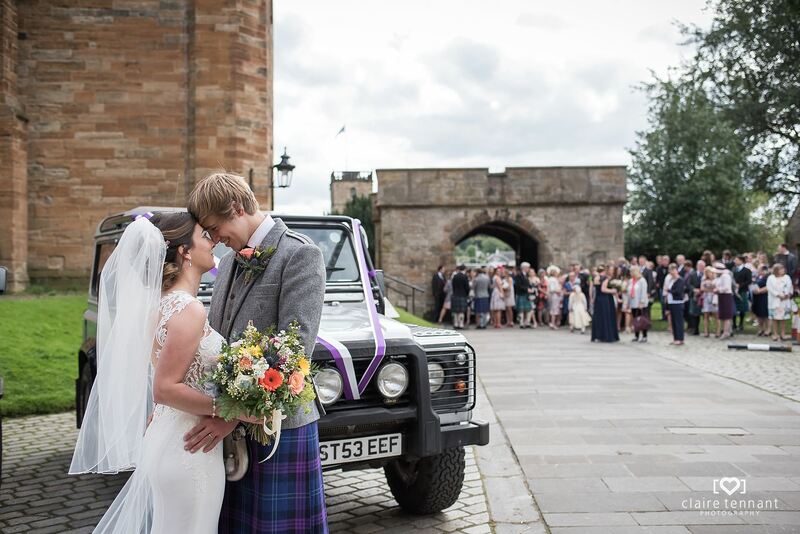 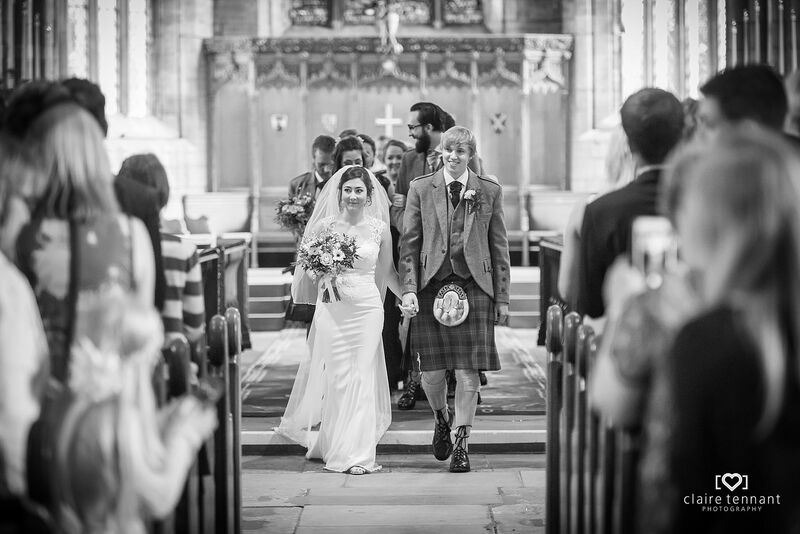 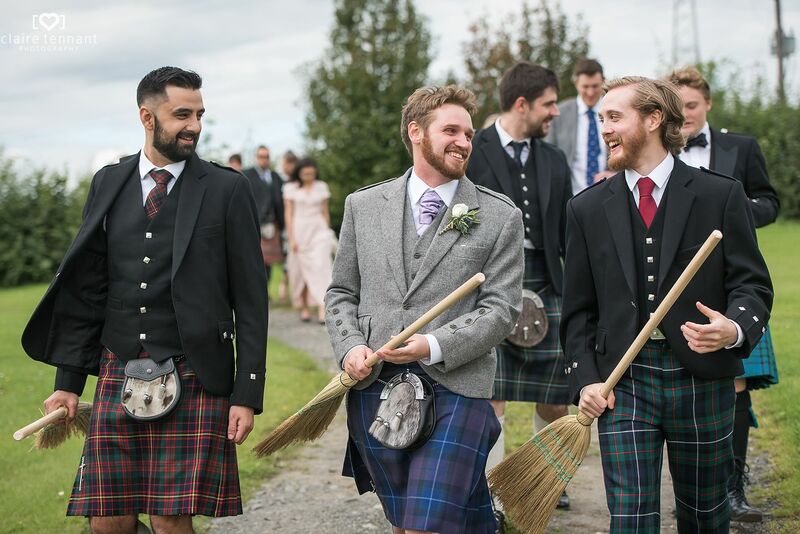 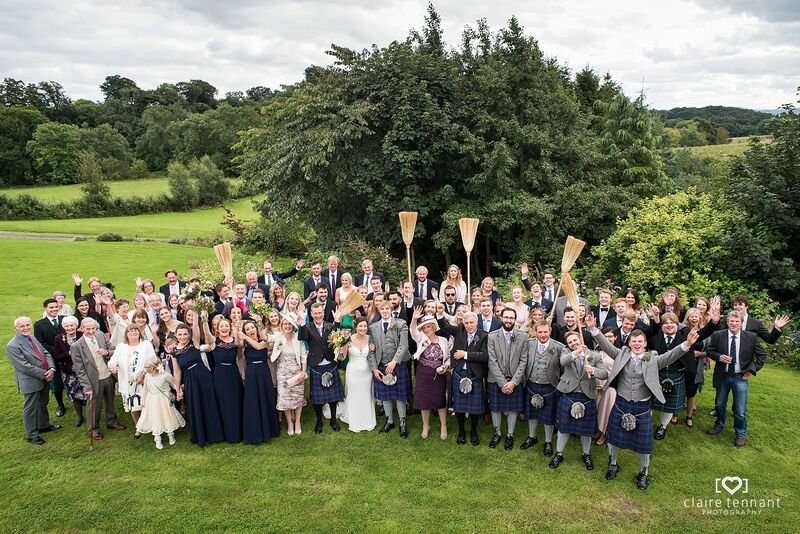 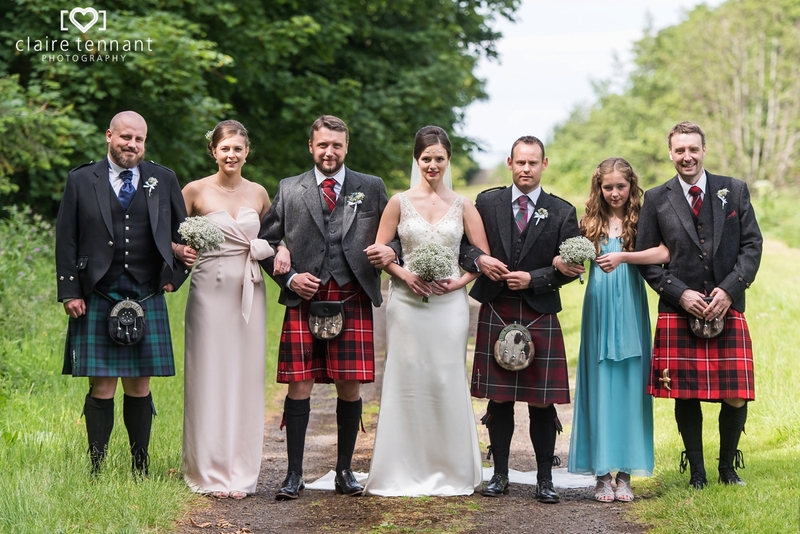 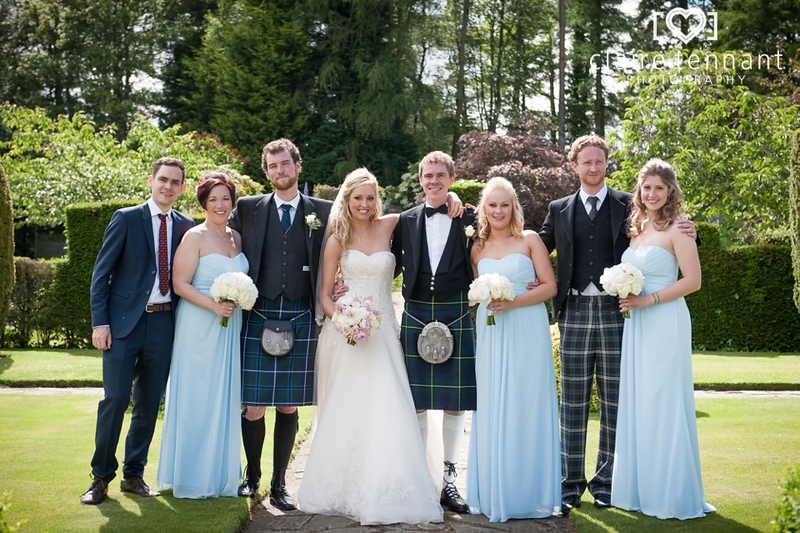 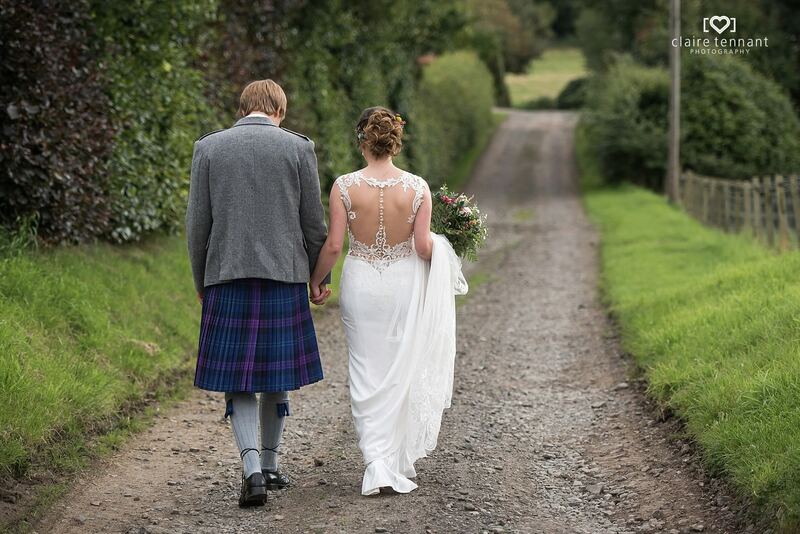 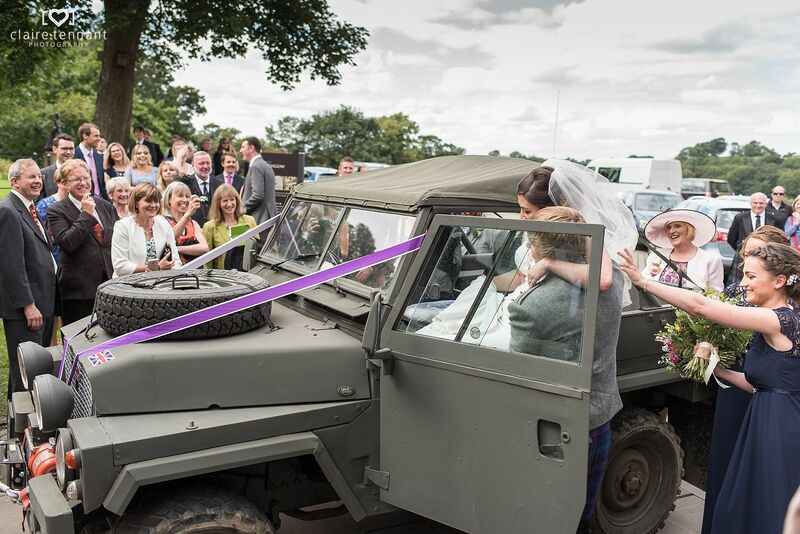 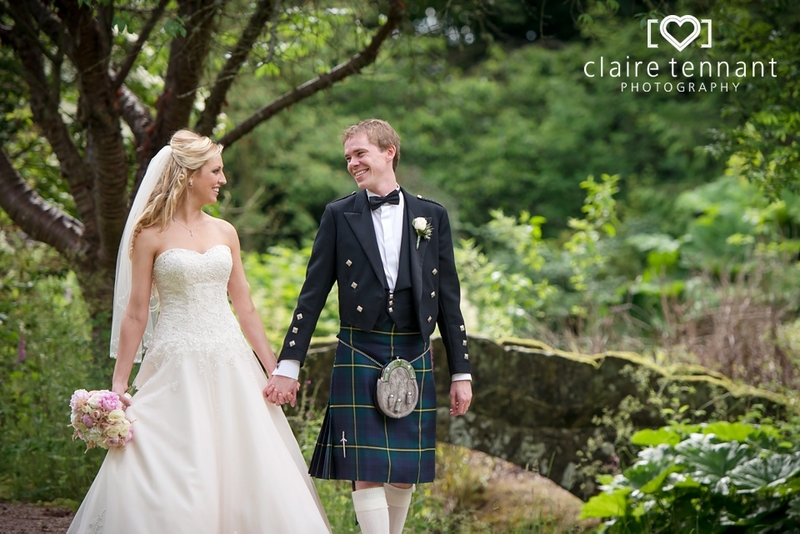 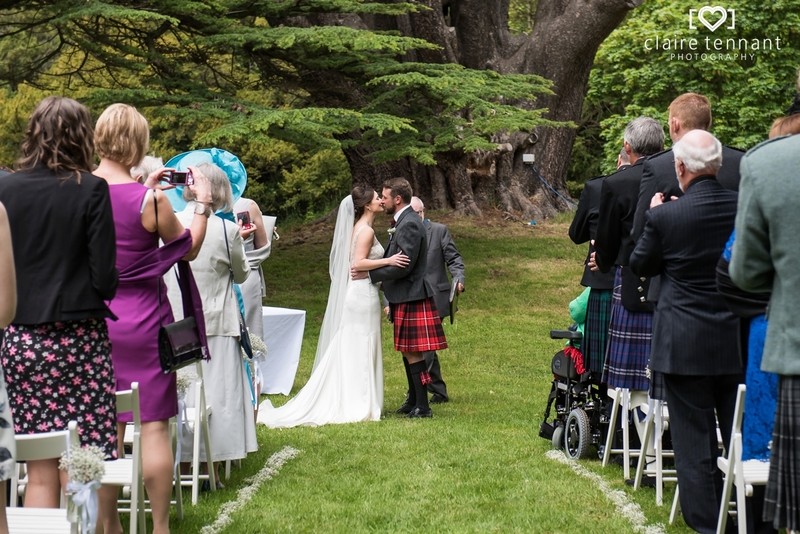 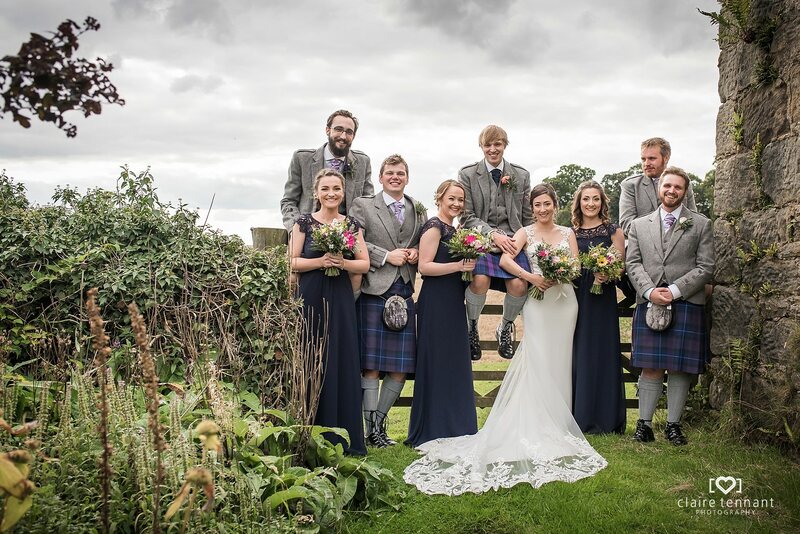 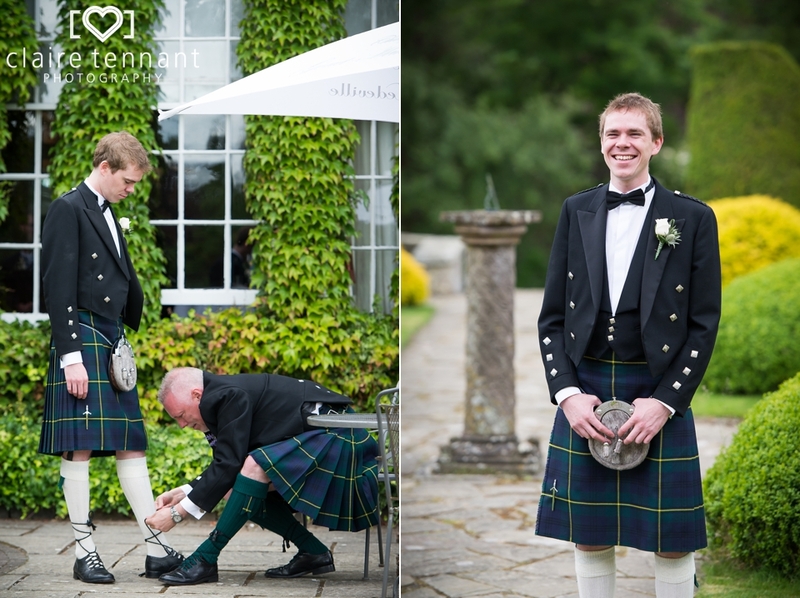 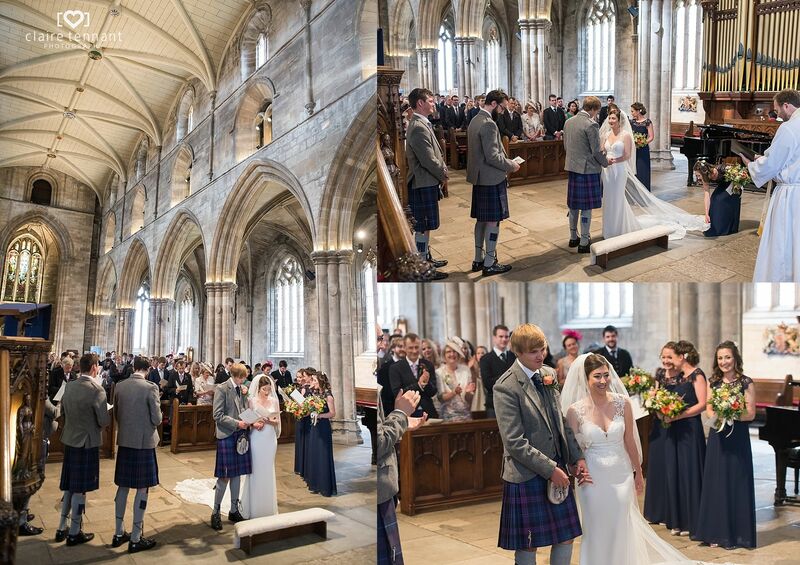 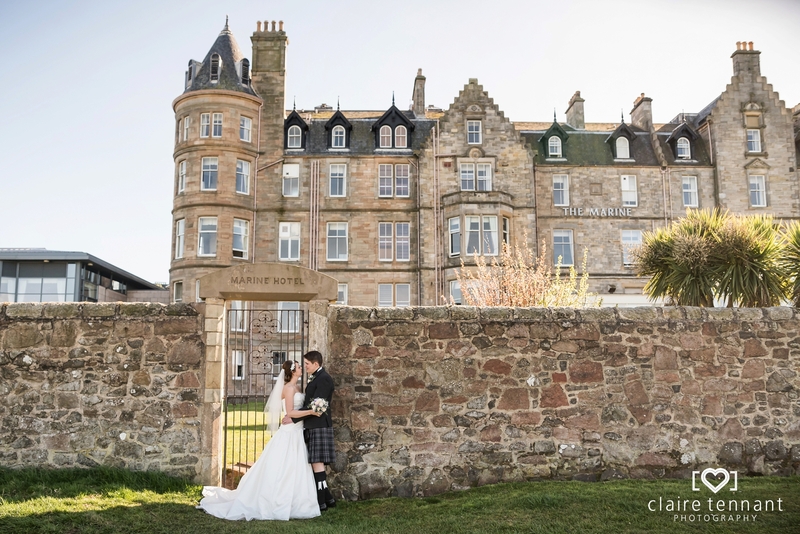 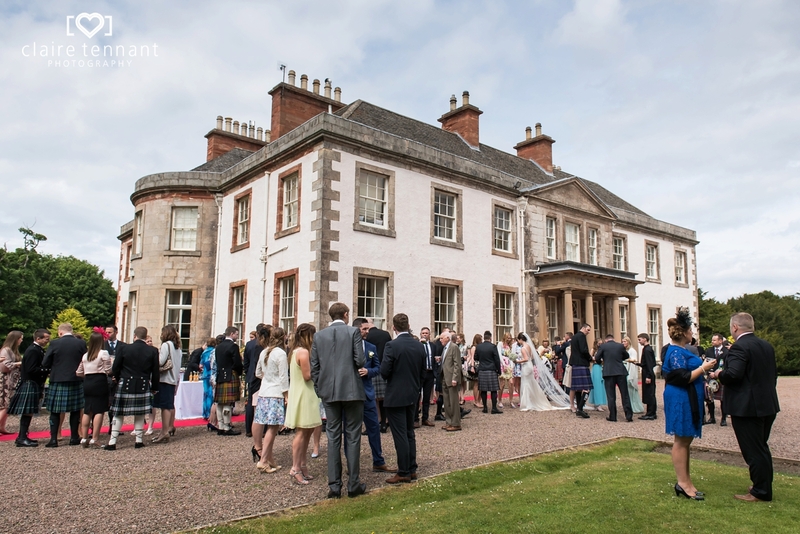 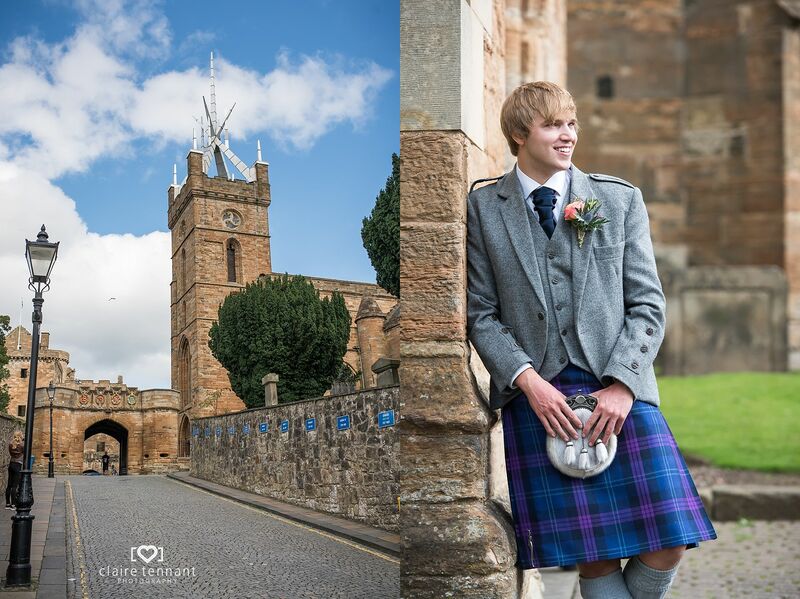 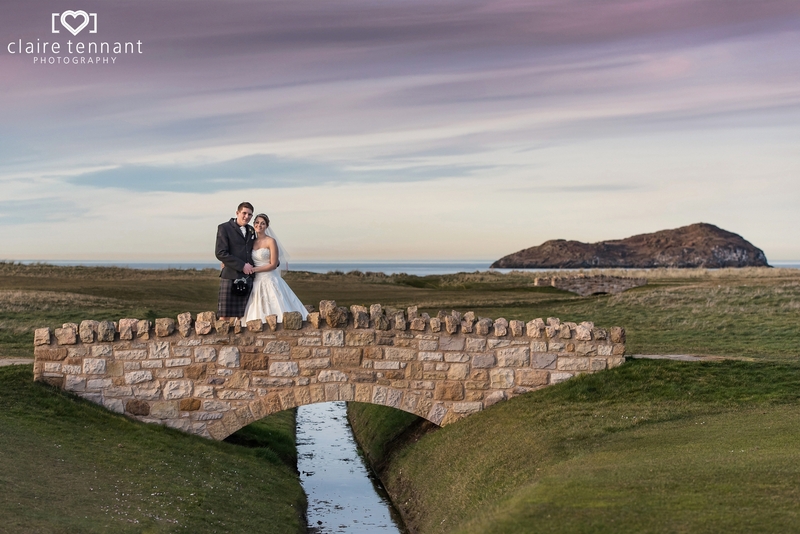 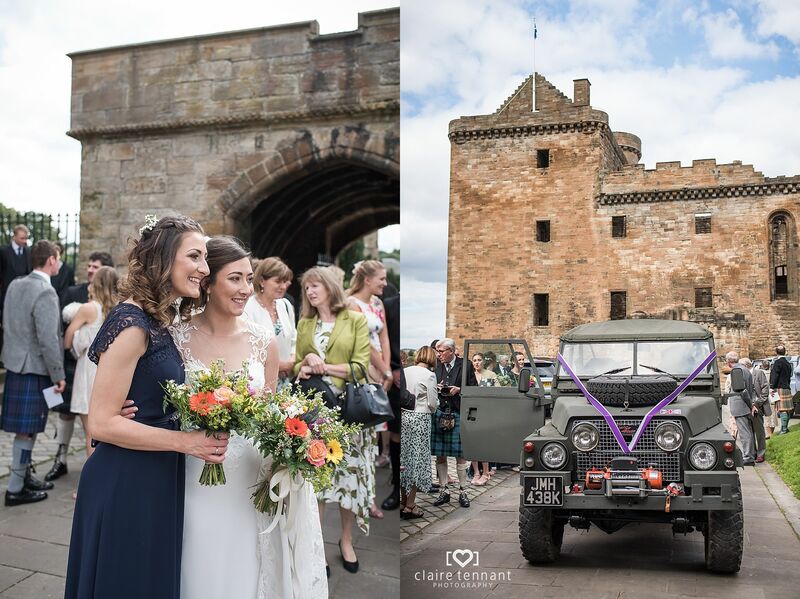 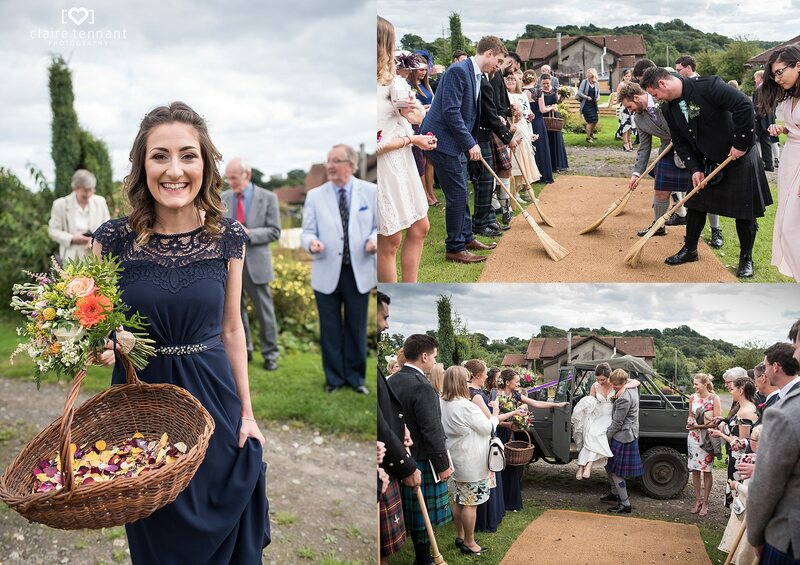 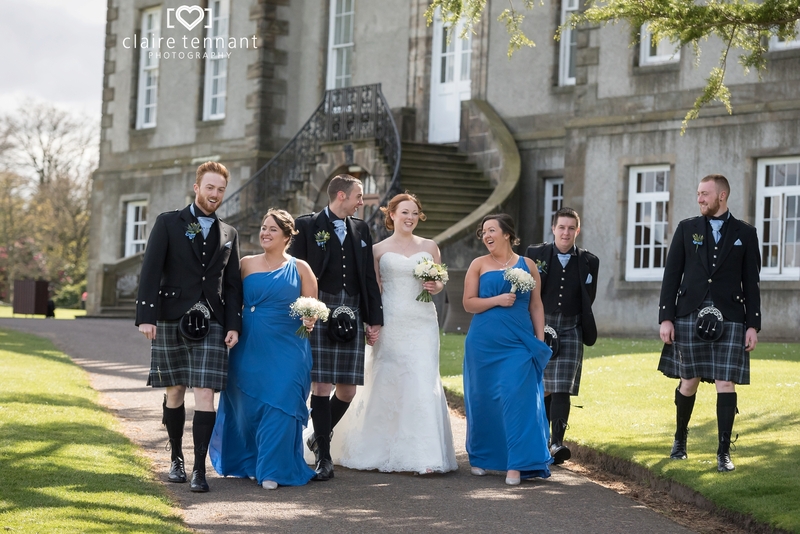 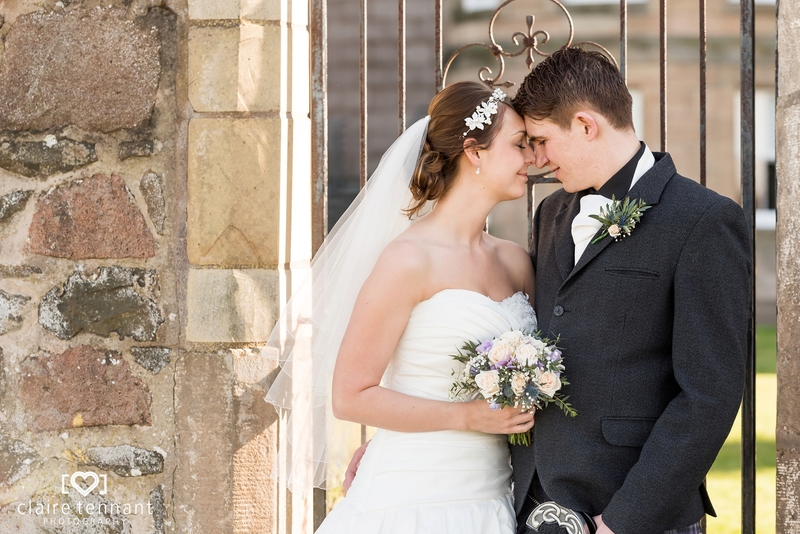 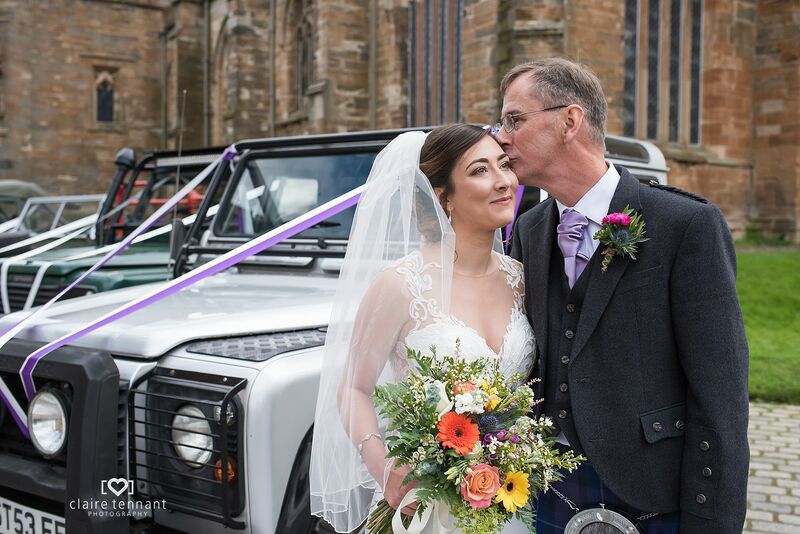 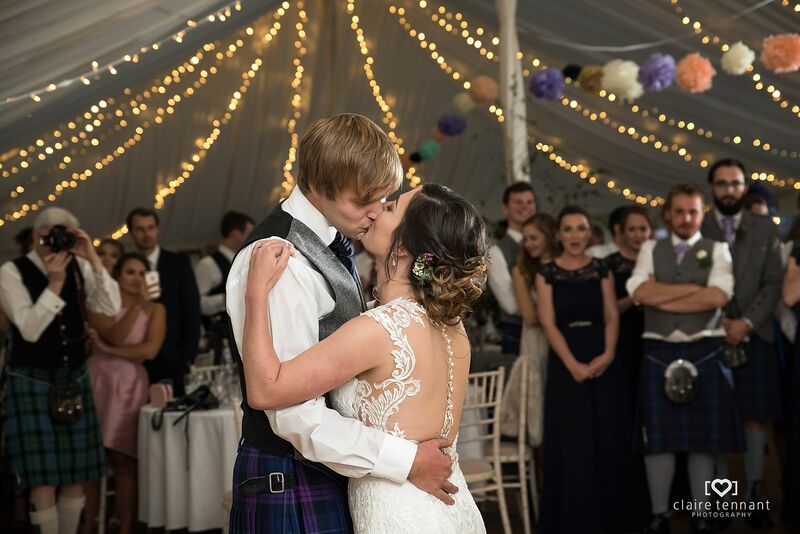 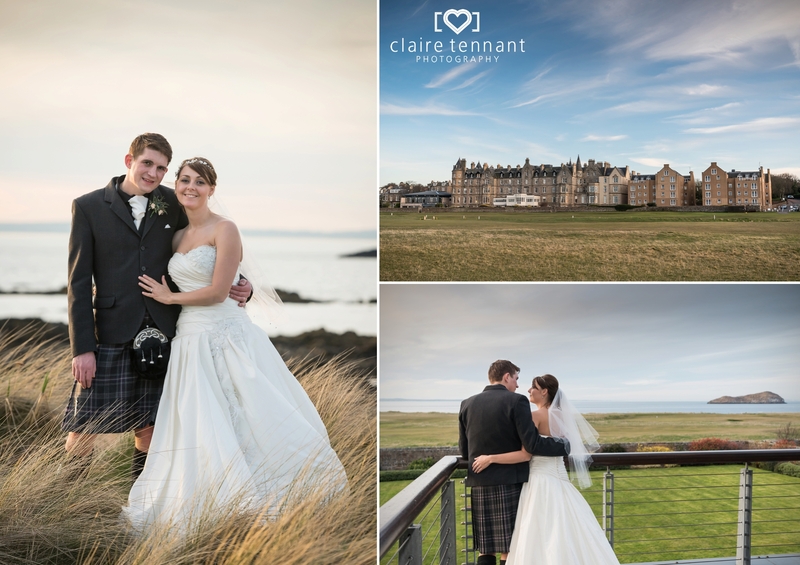 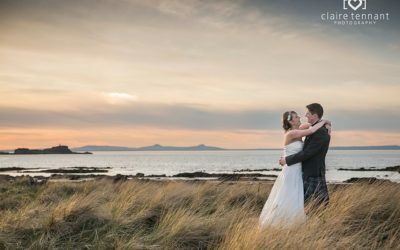 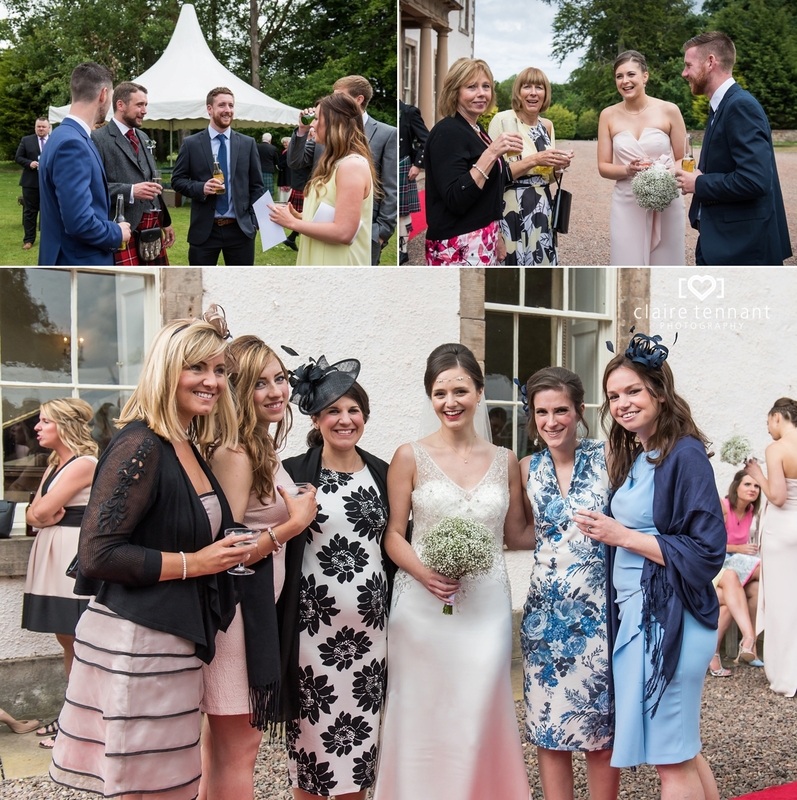 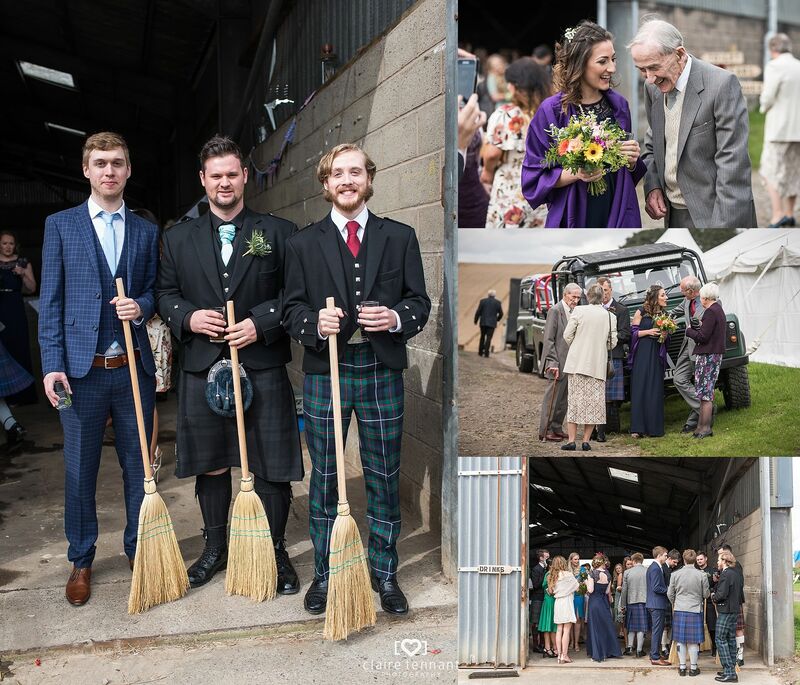 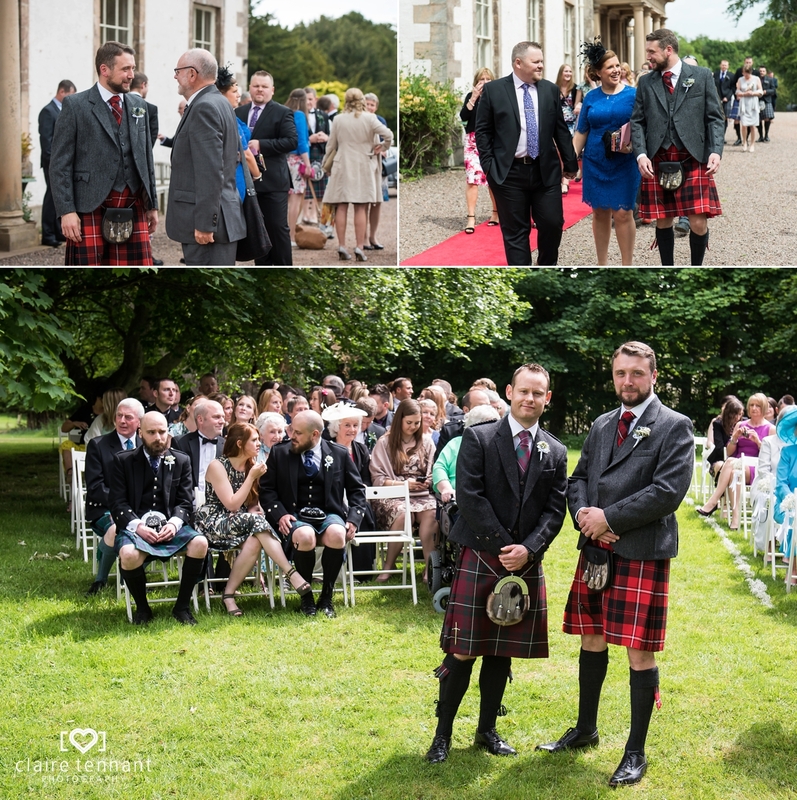 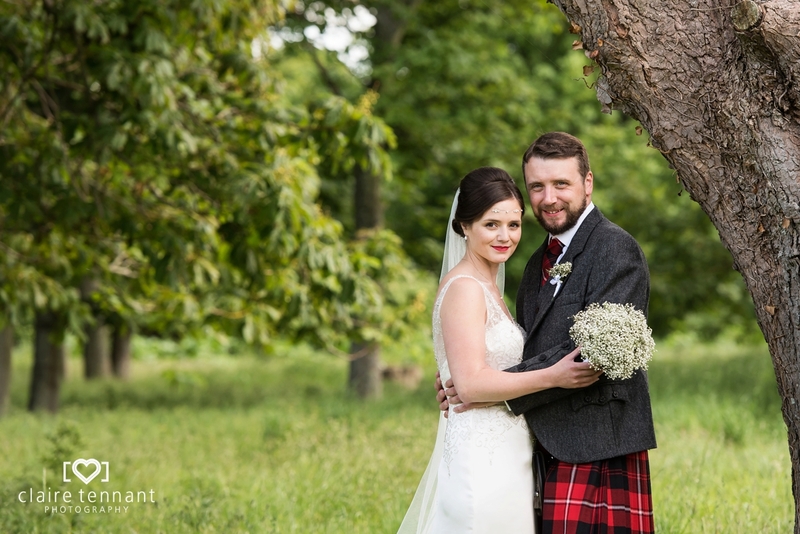 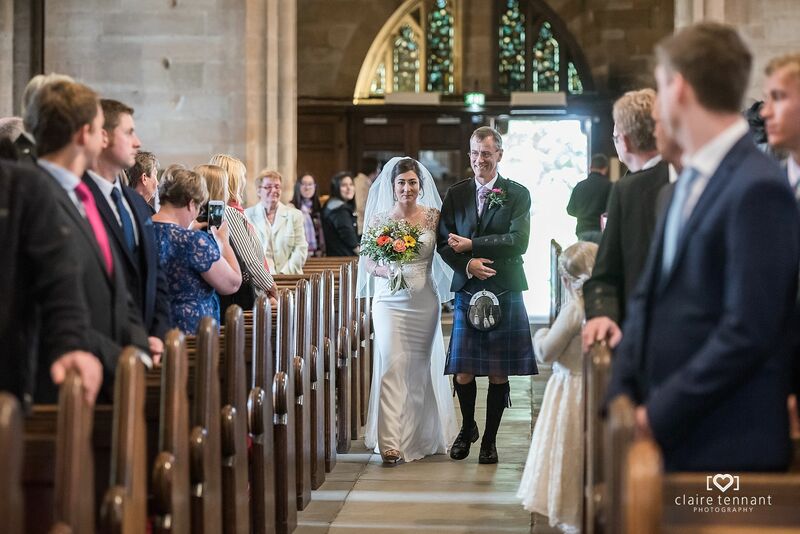 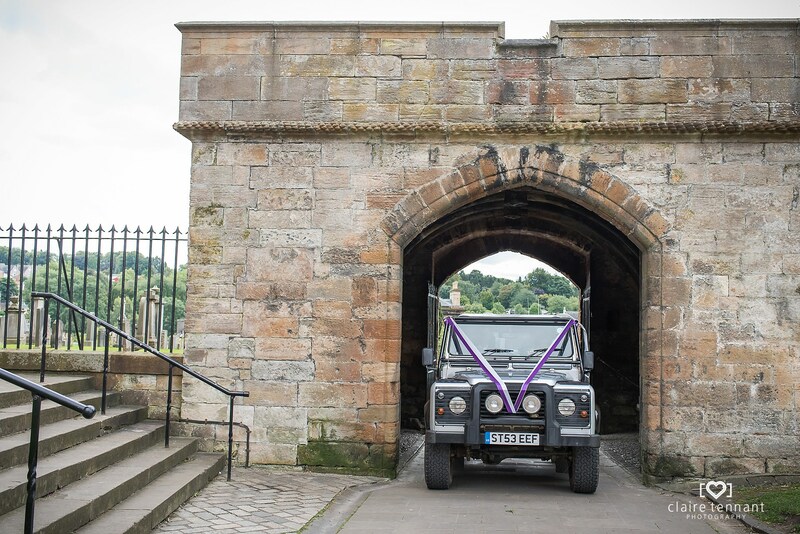 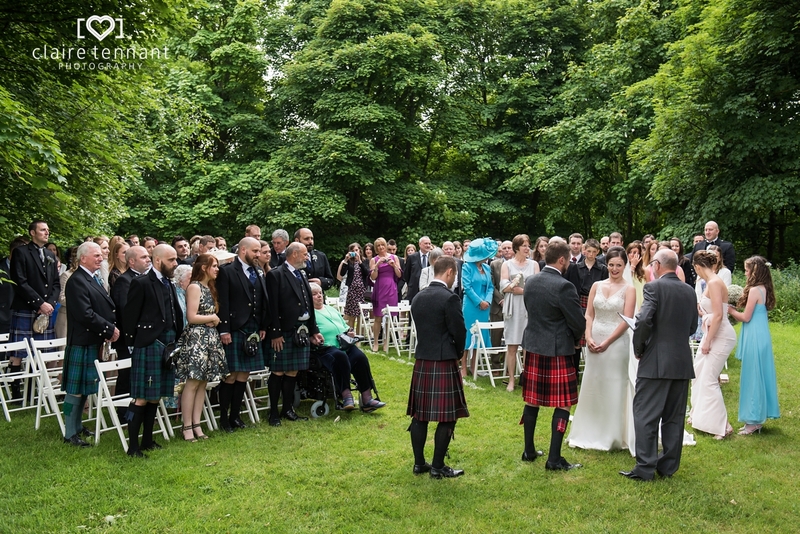 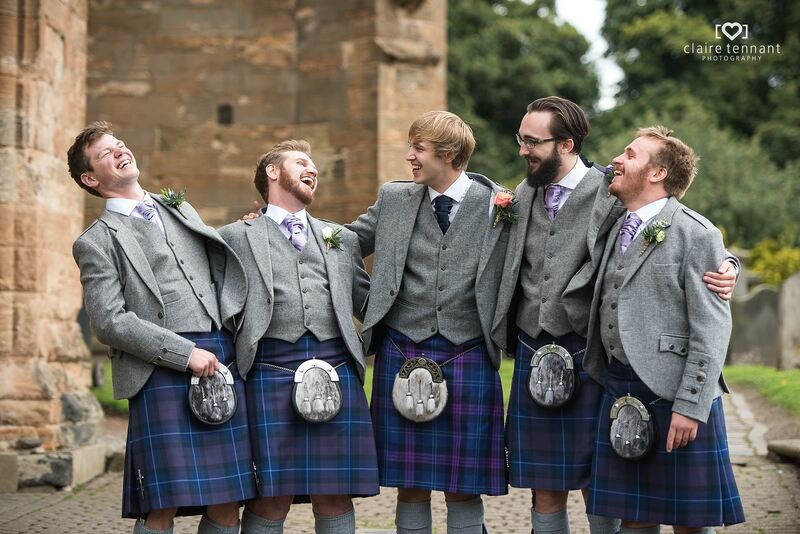 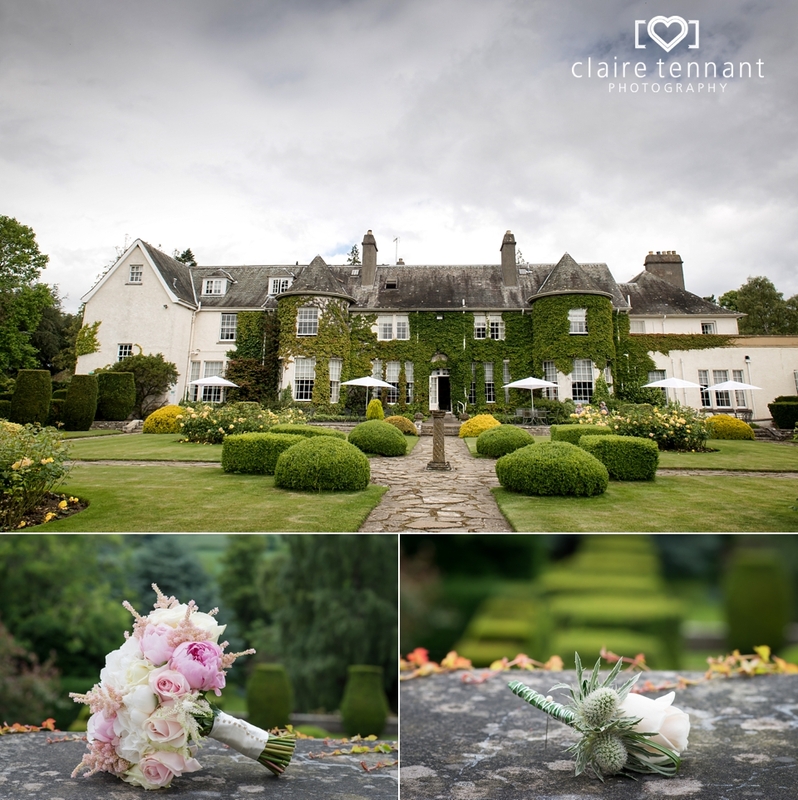 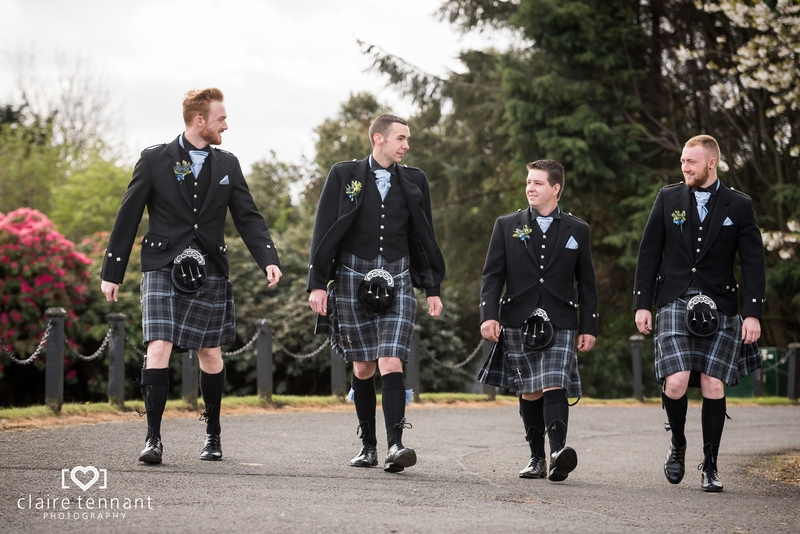 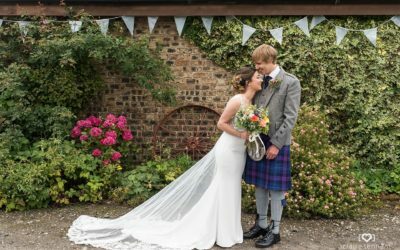 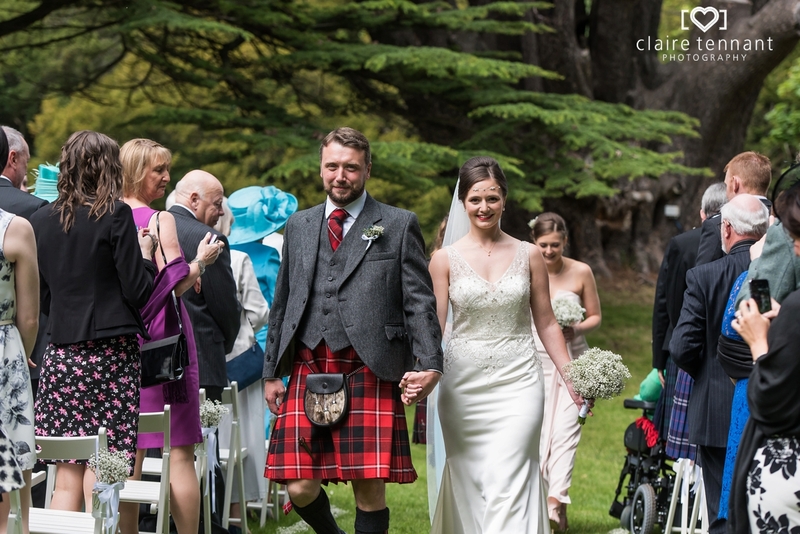 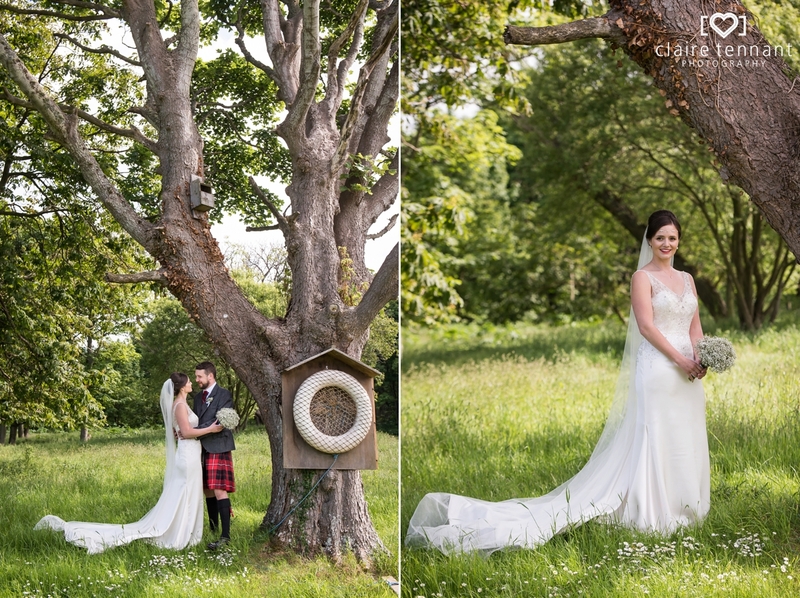 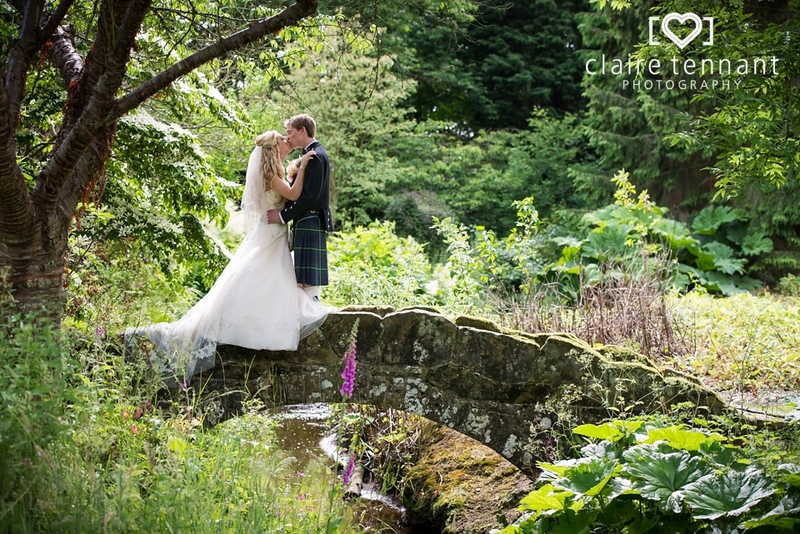 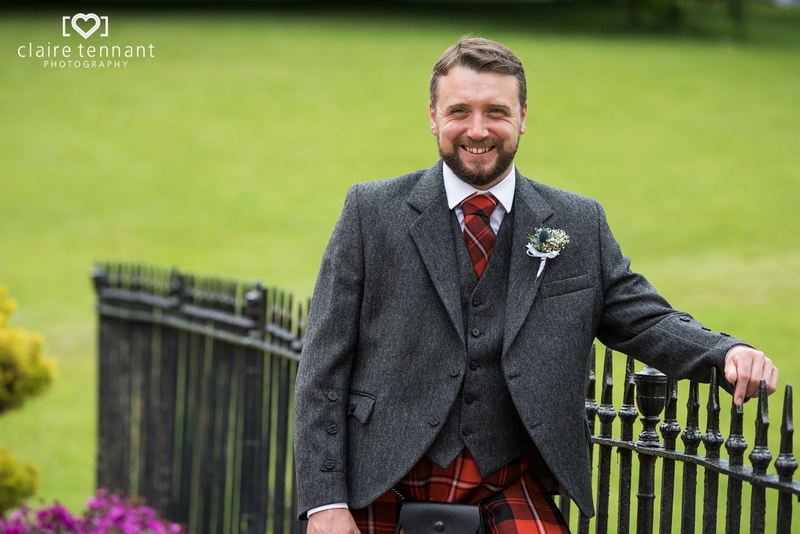 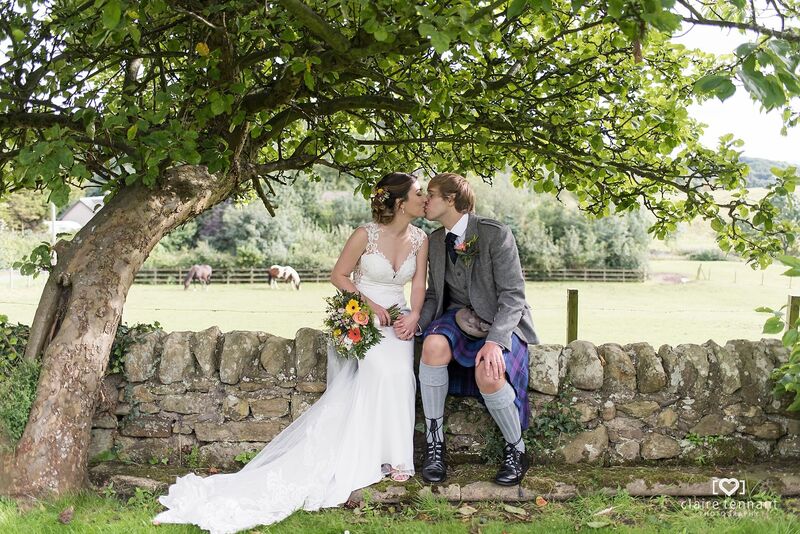 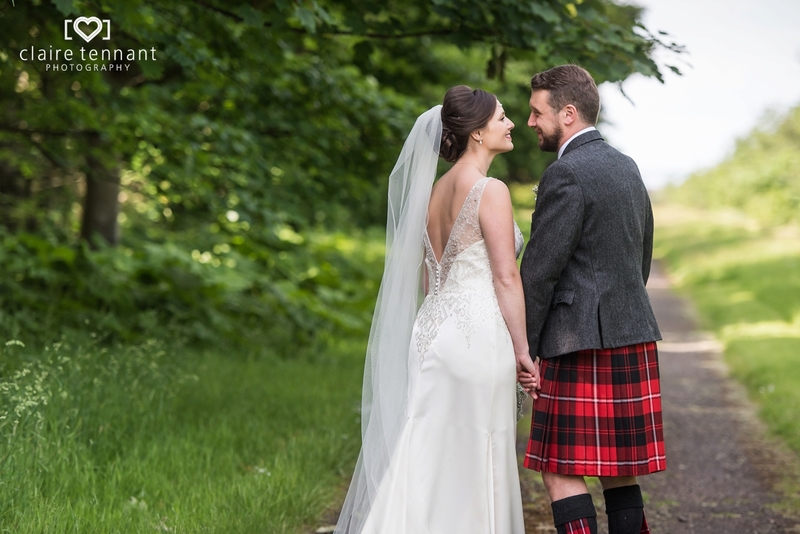 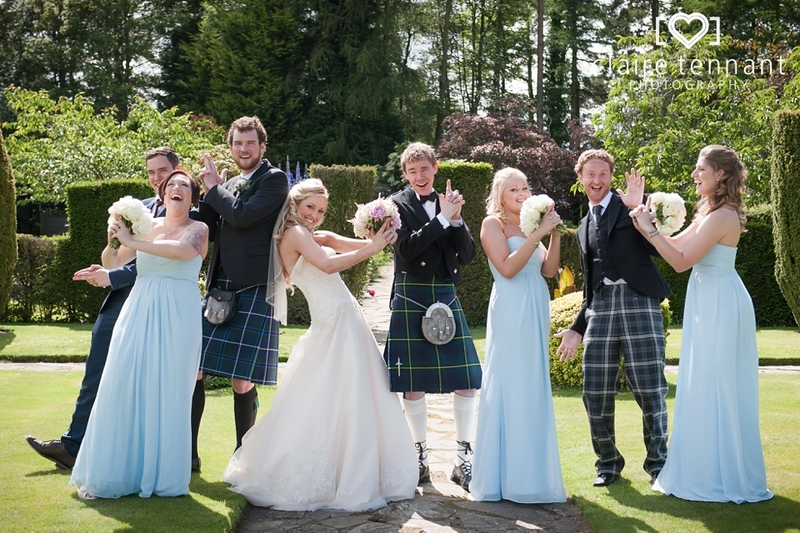 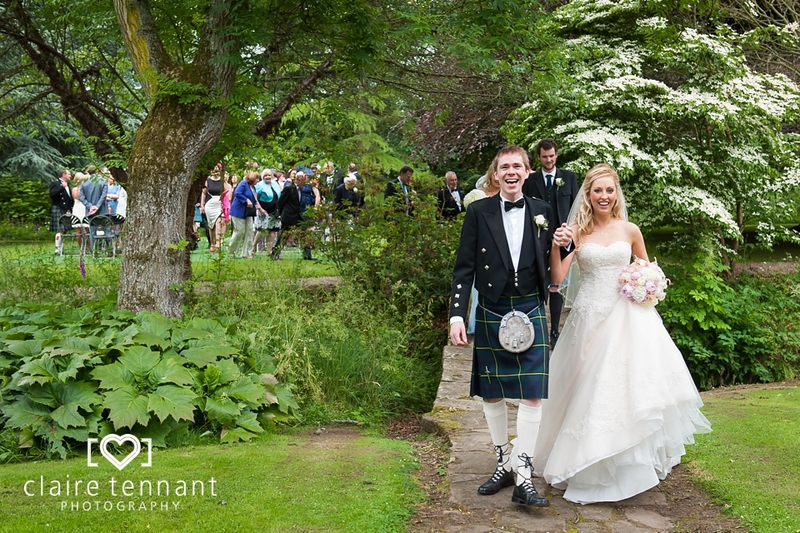 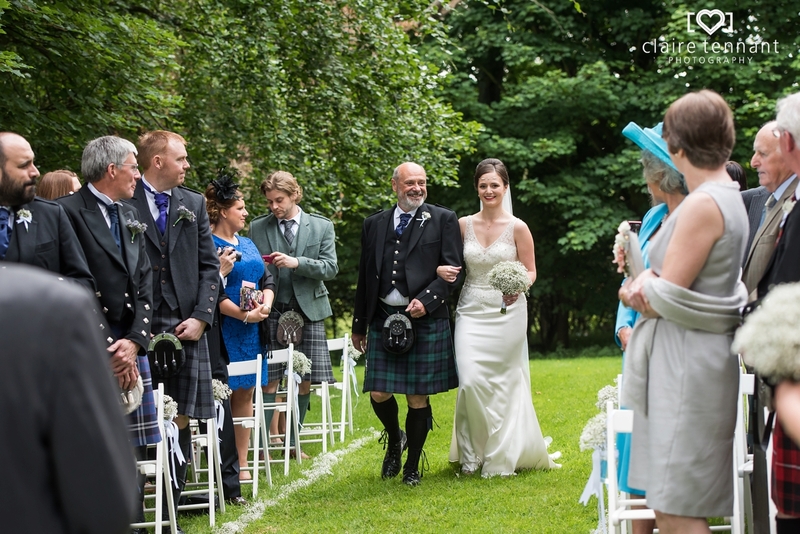 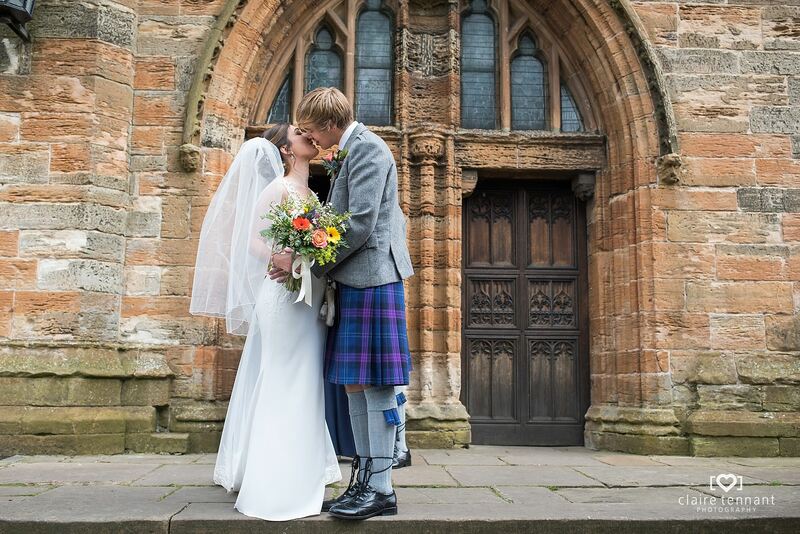 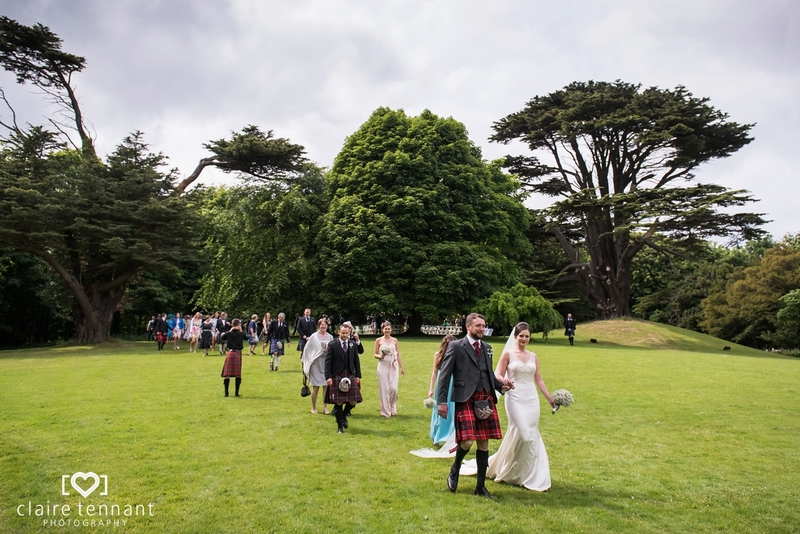 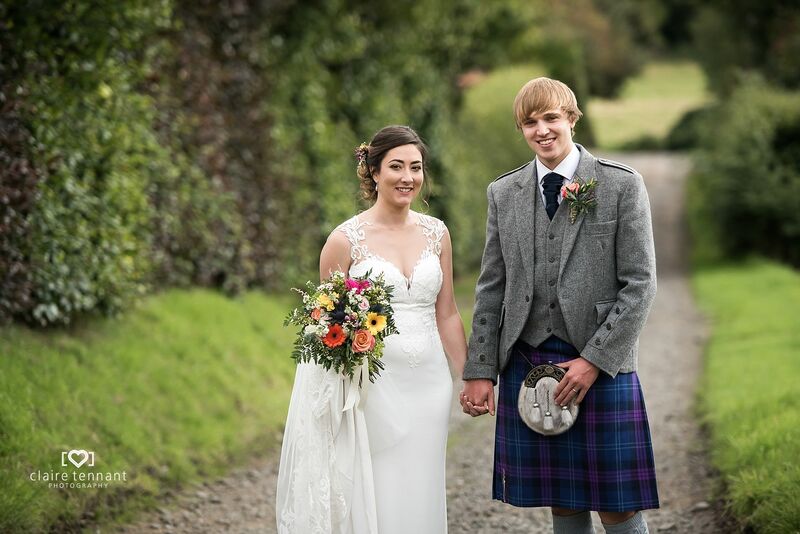 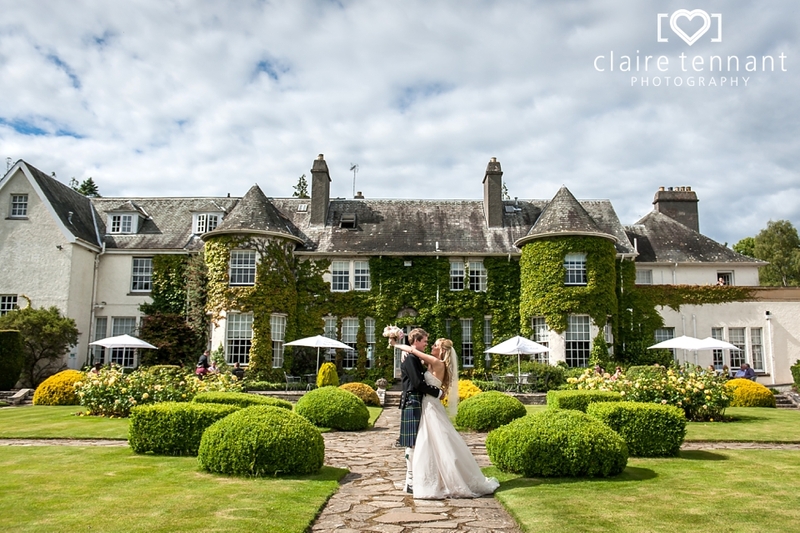 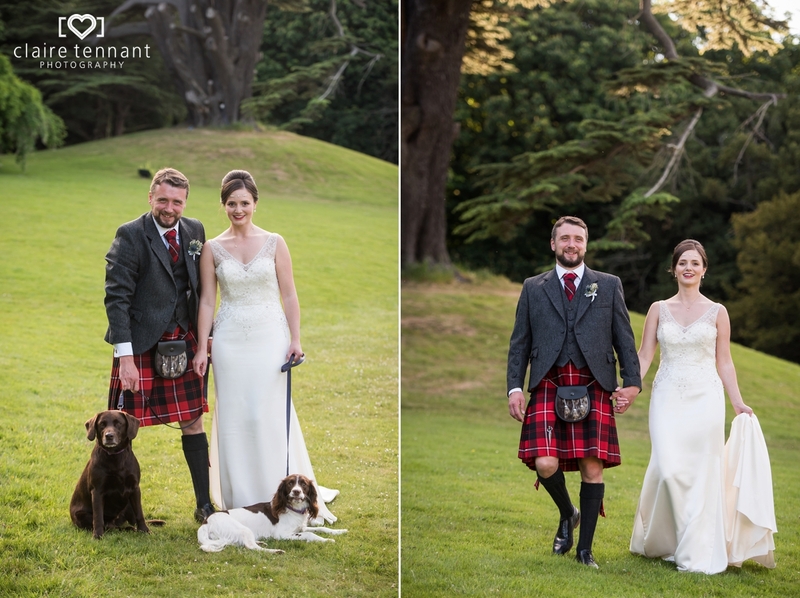 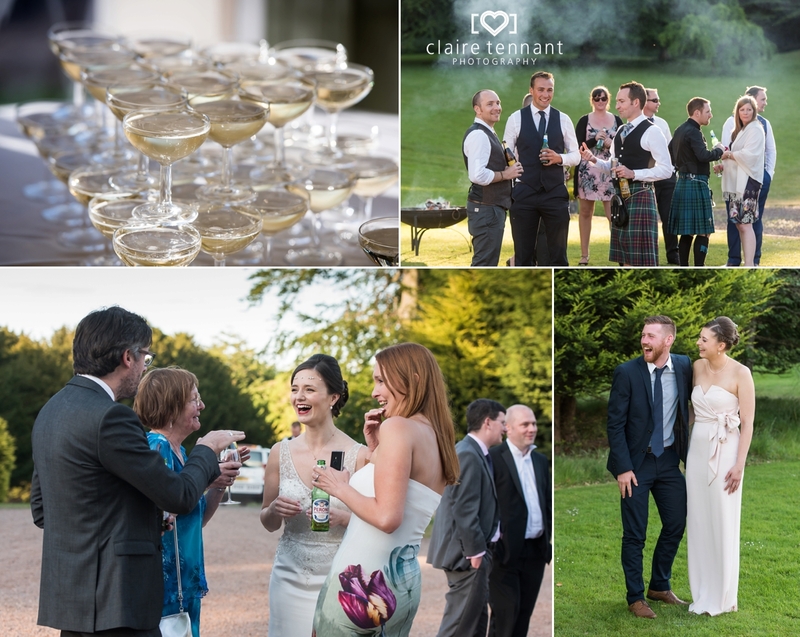 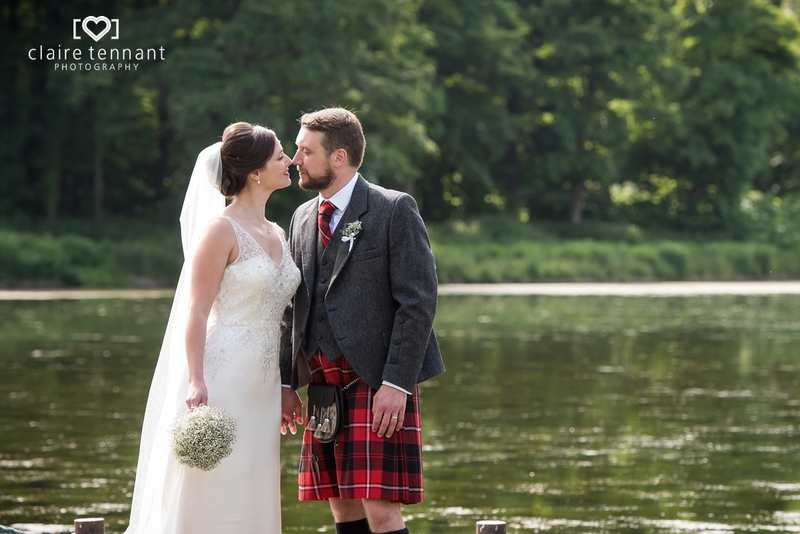 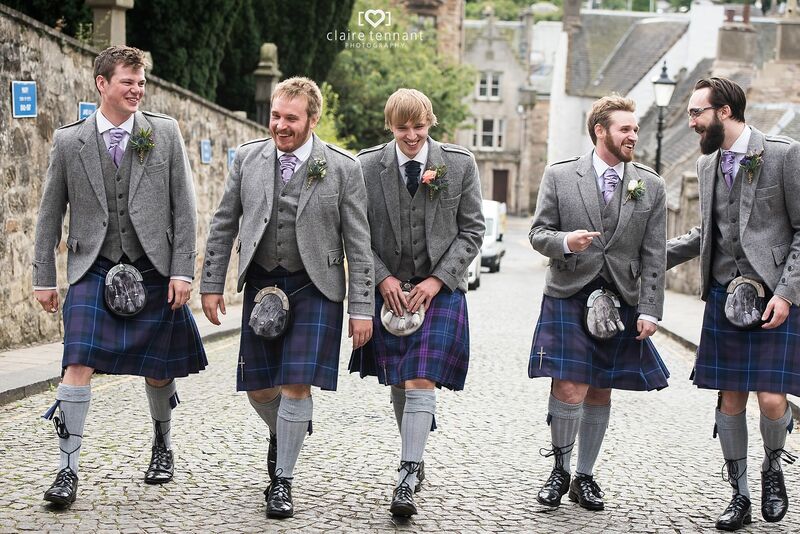 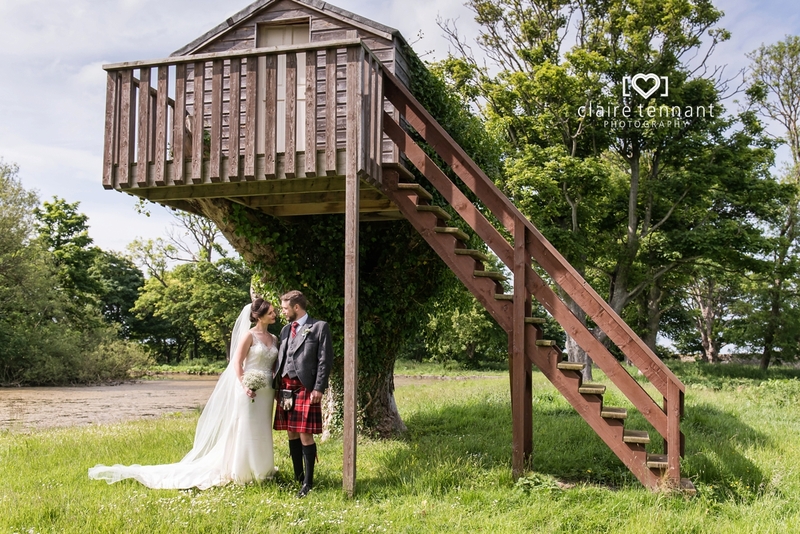 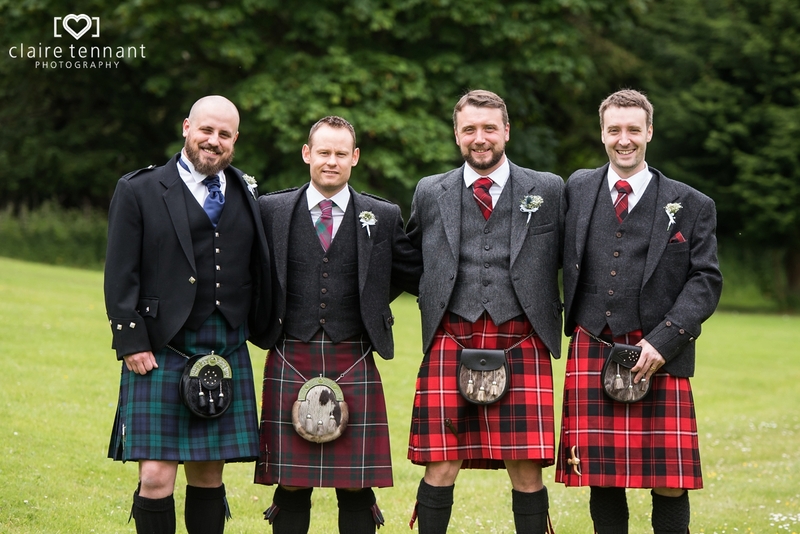 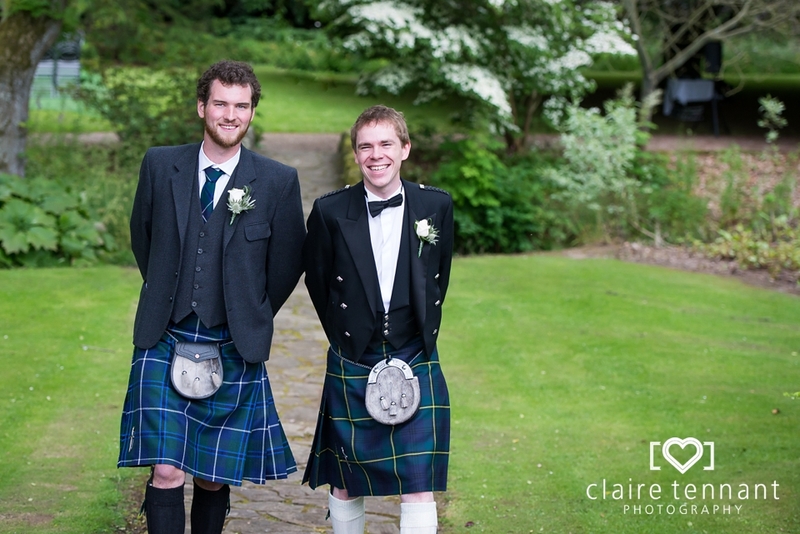 Rufflets in St Andrews was the location for the lovely Scottish Summer wedding of Caitlin and Ross. 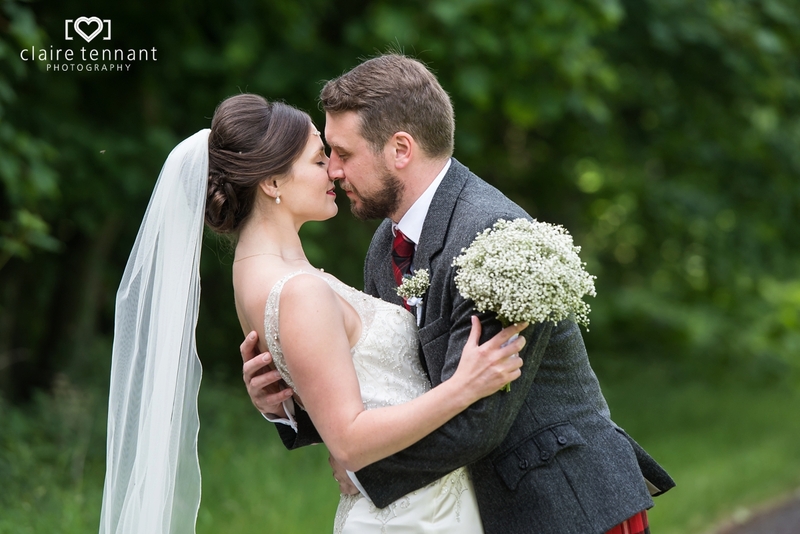 Caitlin and Ross live over in the US and planned everything for their big day from over there so I didn’t actually have the pleasure of meeting them until their big day. 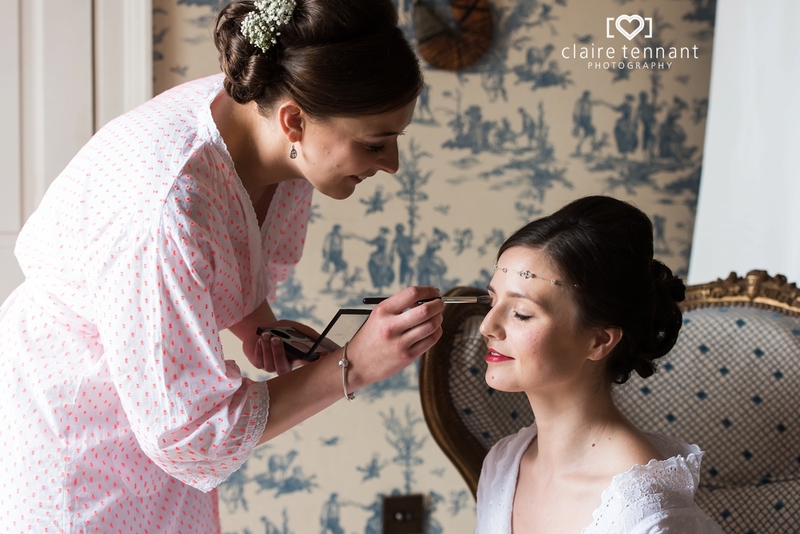 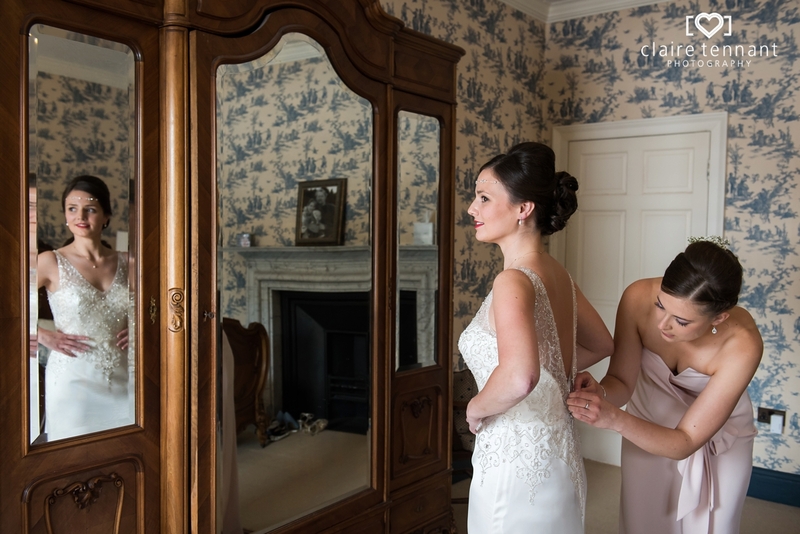 When I arrived the girls were getting ready in a beautiful room in Rufflets which had a balcony with views of the grounds below. 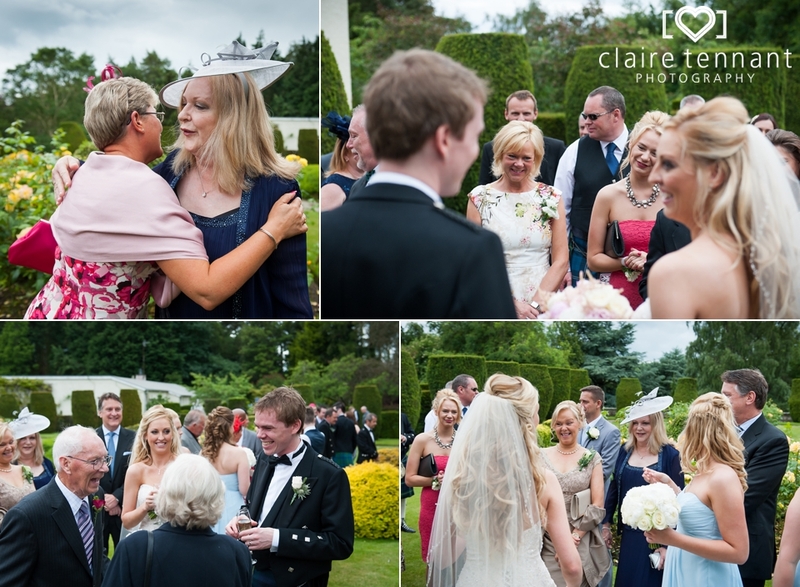 It was a hub of activity and everyone was very excited..especially Caitlin! 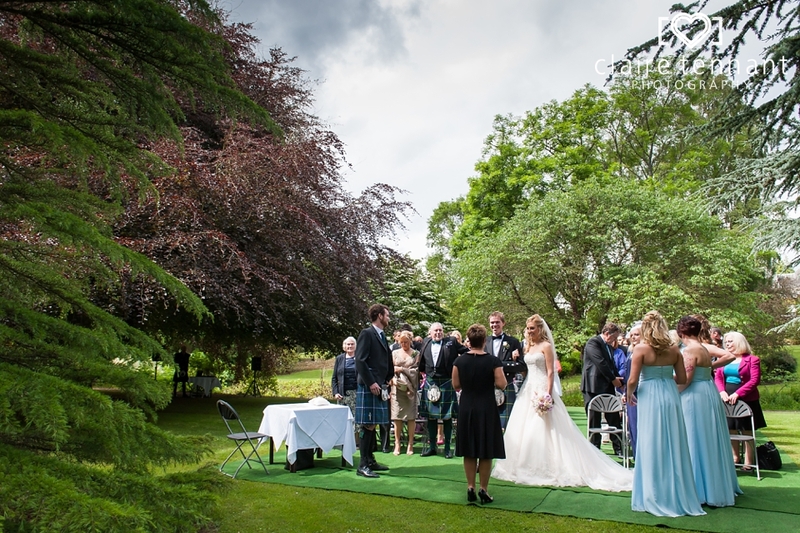 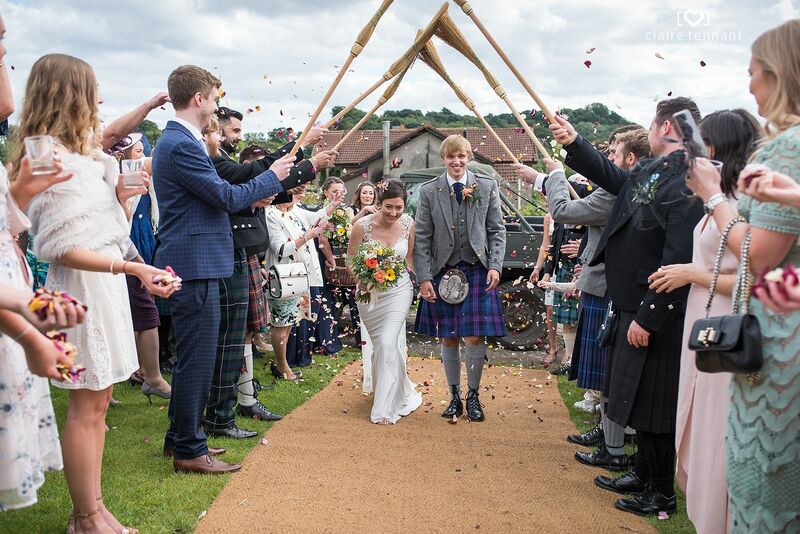 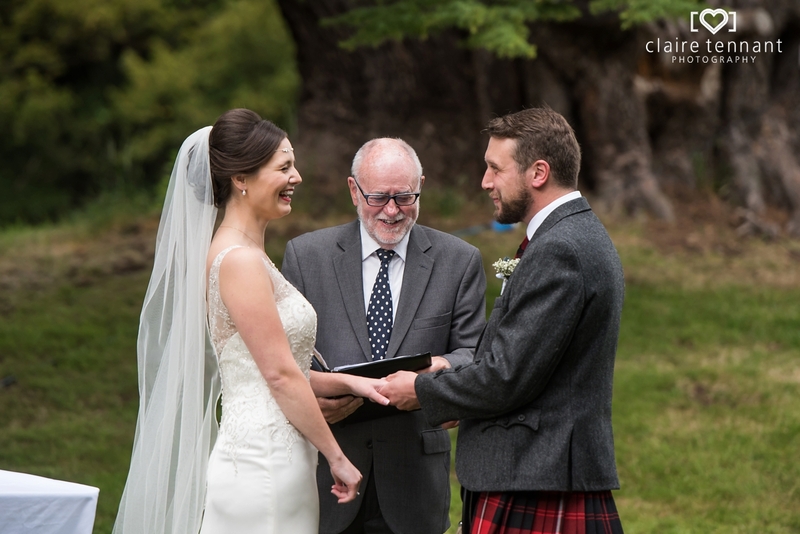 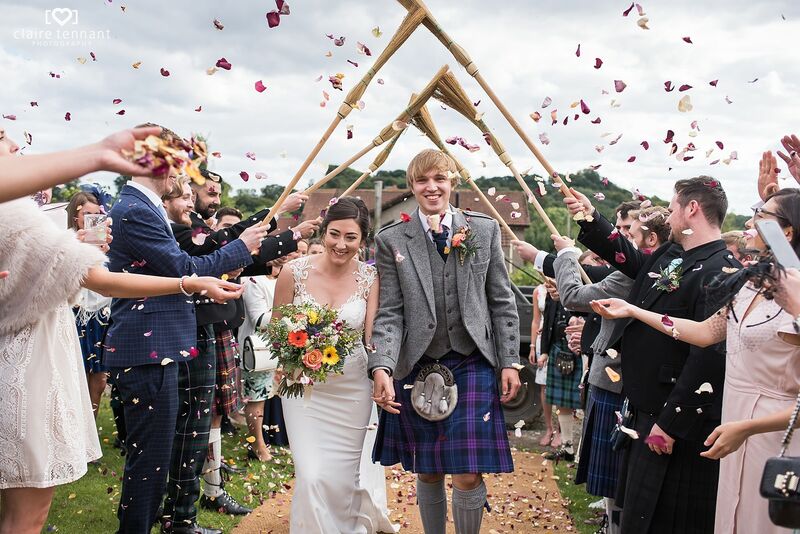 A few dark clouds appeared overhead but after some light rain the weather improved and Caitlin and Ross chose to go ahead with having their ceremony outdoors. 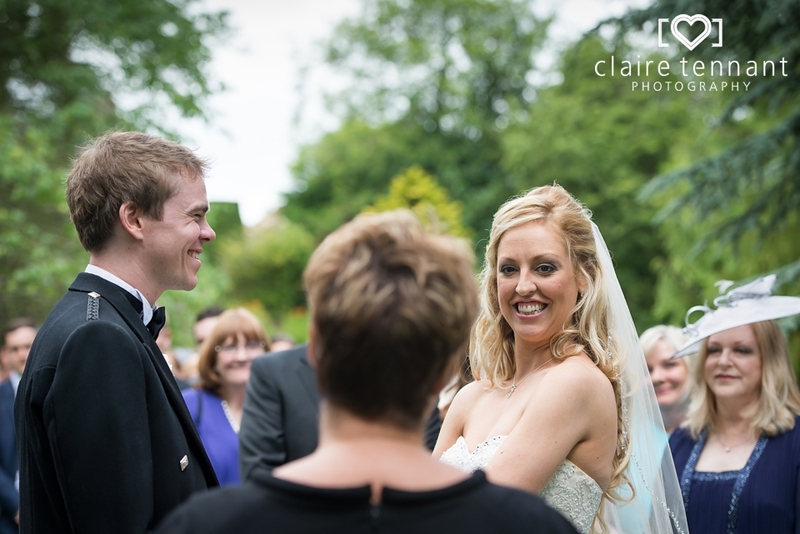 The ceremony took place at the foot of the hill in Rufflets lush grounds which was fantastic for photography as I could get a great view of all the special moments. 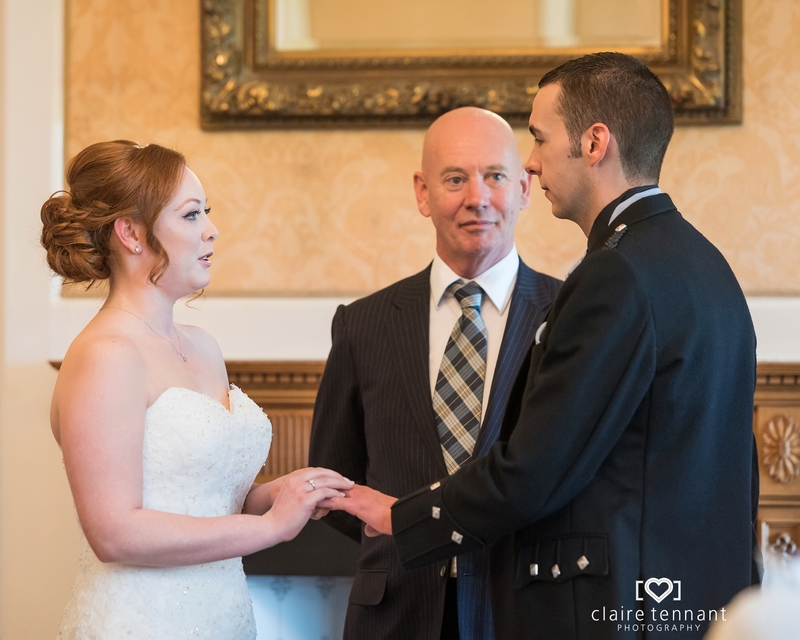 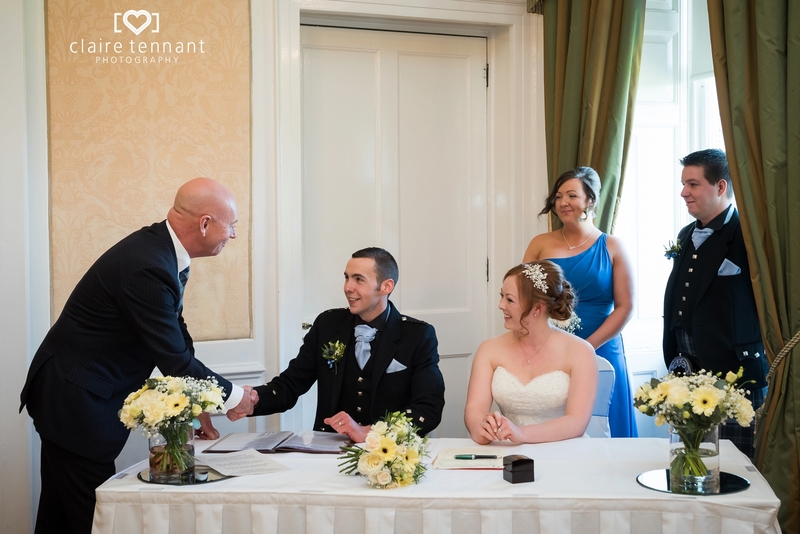 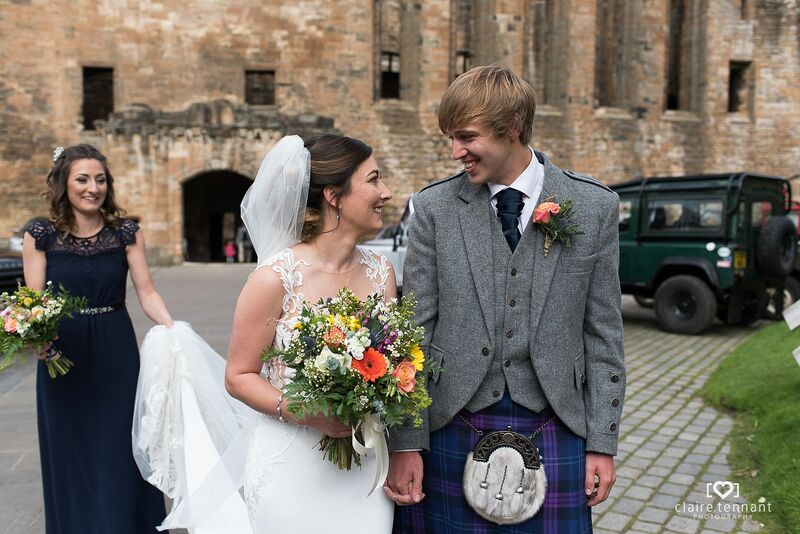 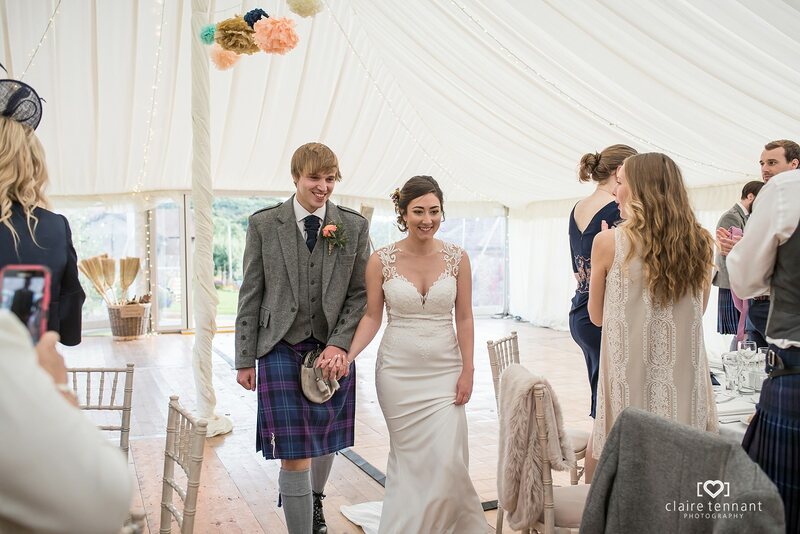 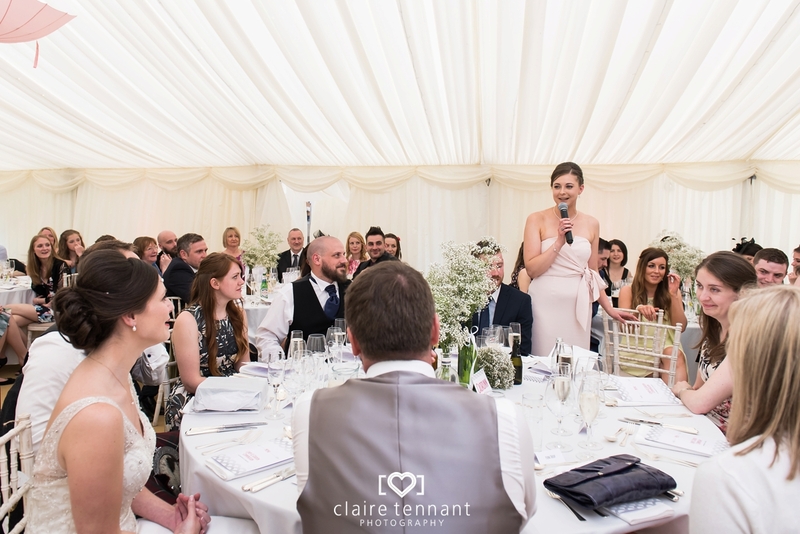 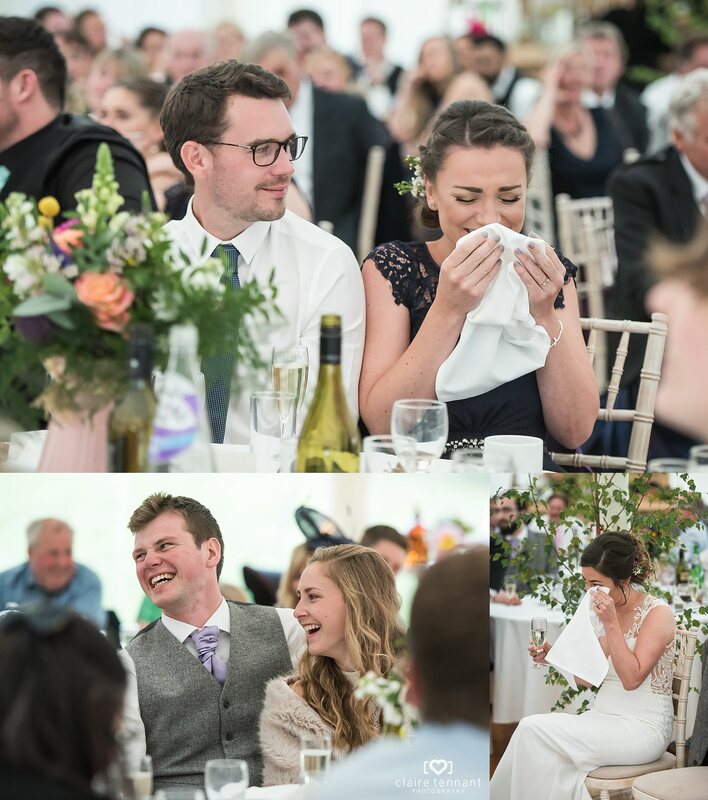 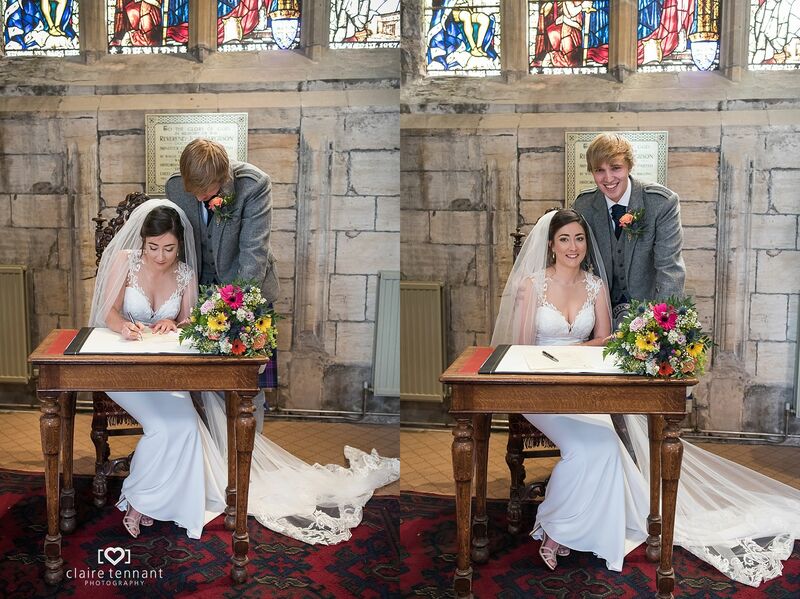 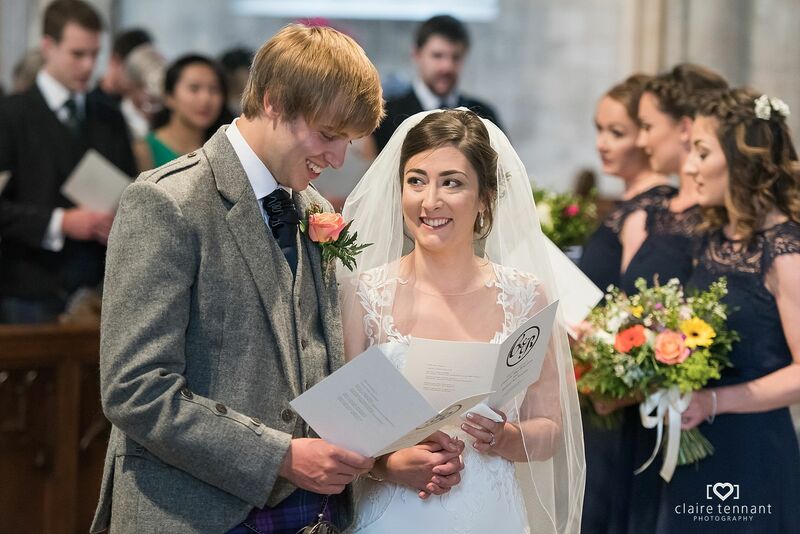 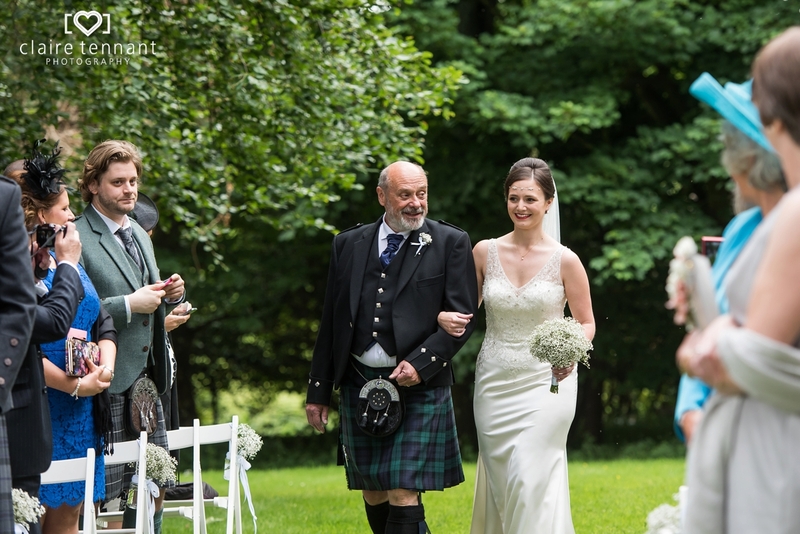 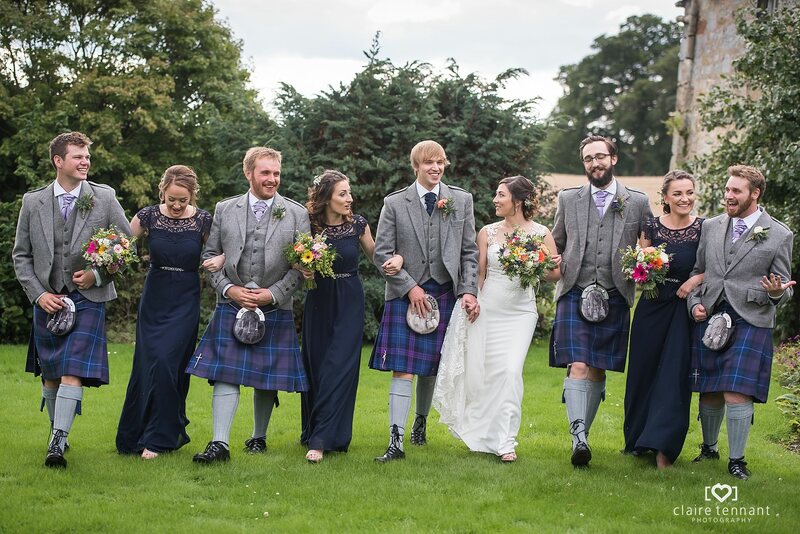 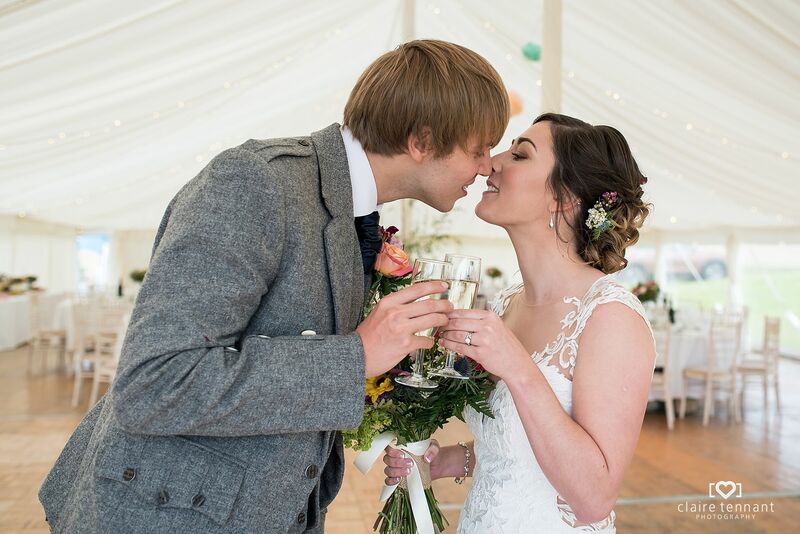 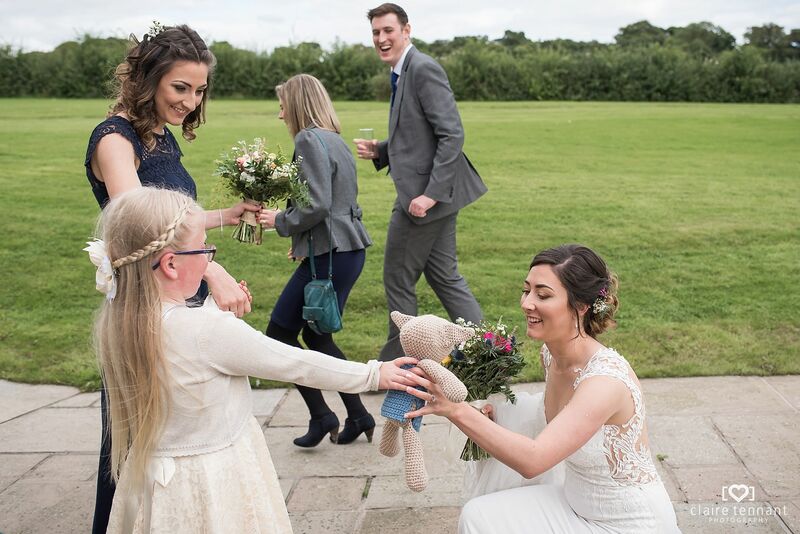 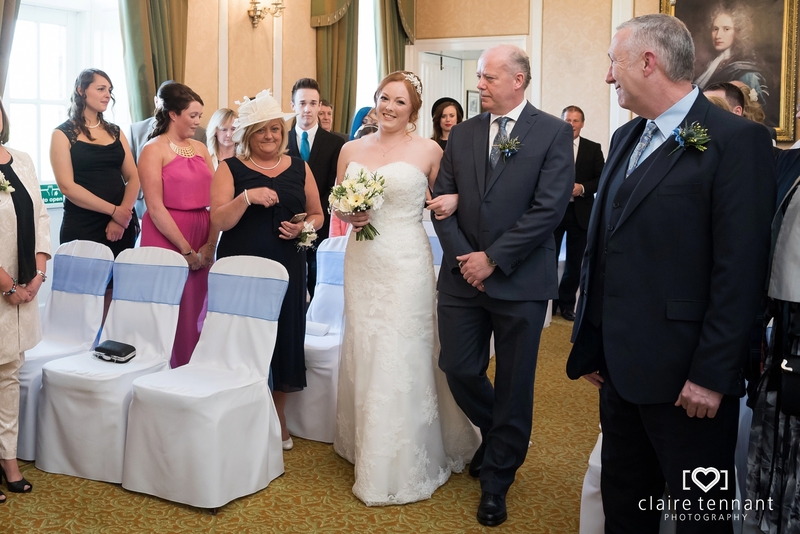 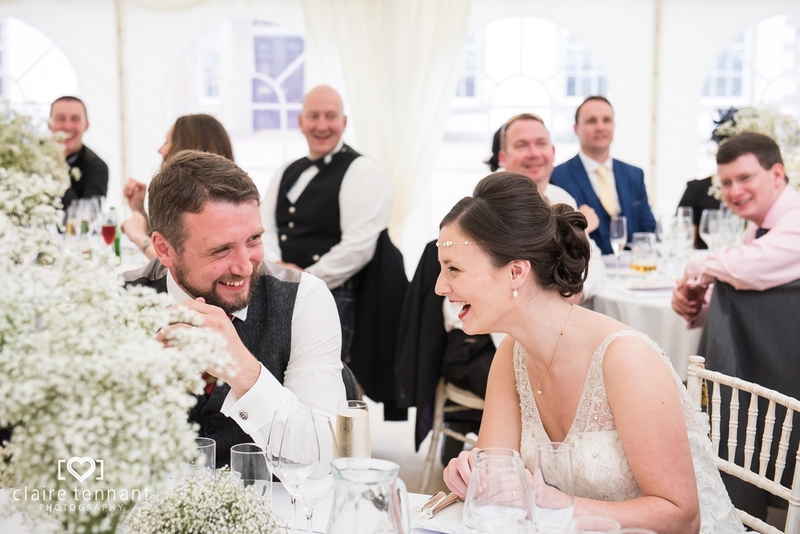 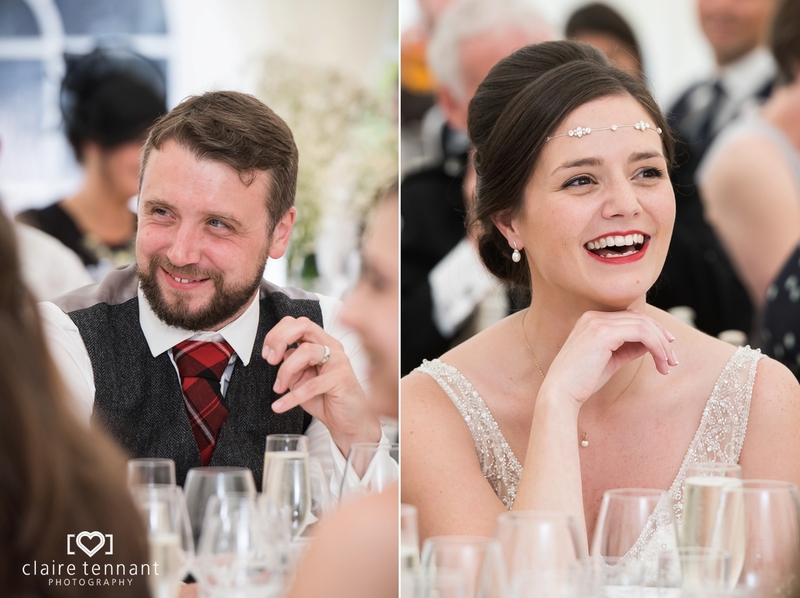 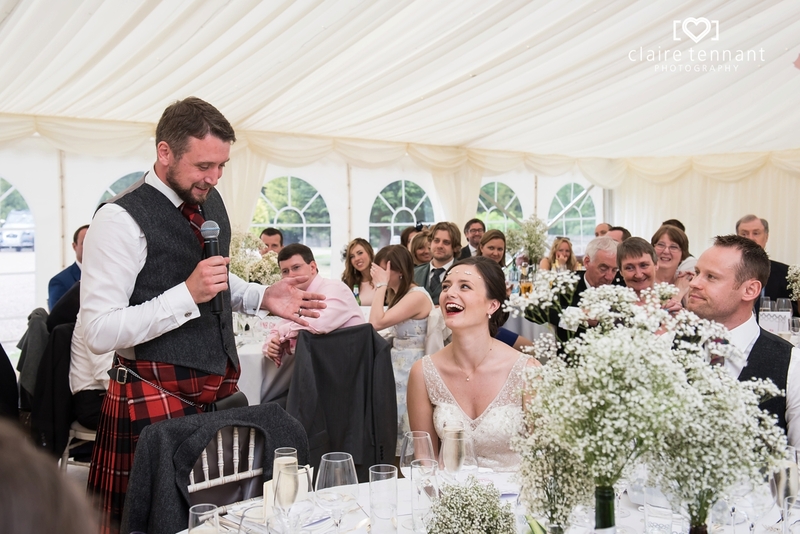 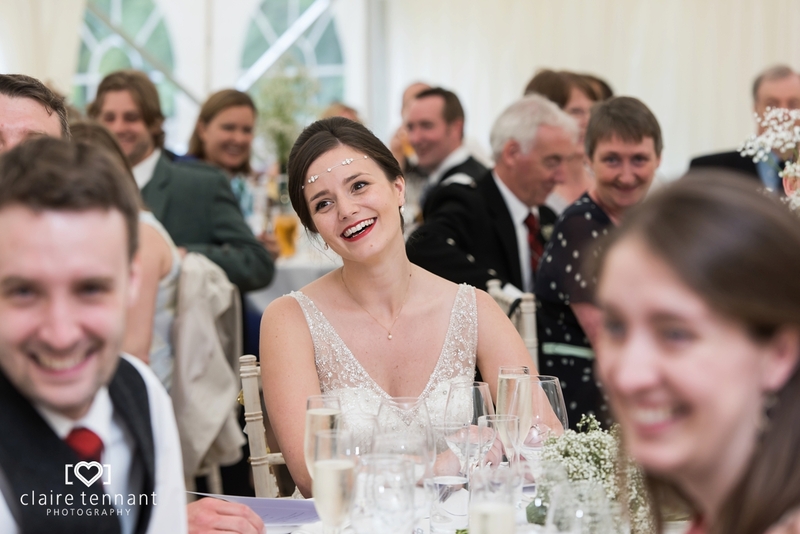 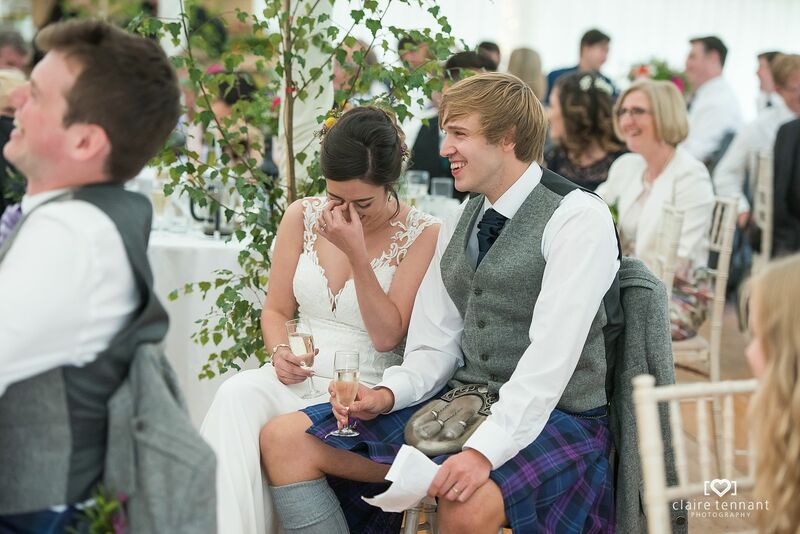 I love the look on Caitlin and Ross’ faces after they were pronounced husband and wife as it sums up how happy they were all day :-). 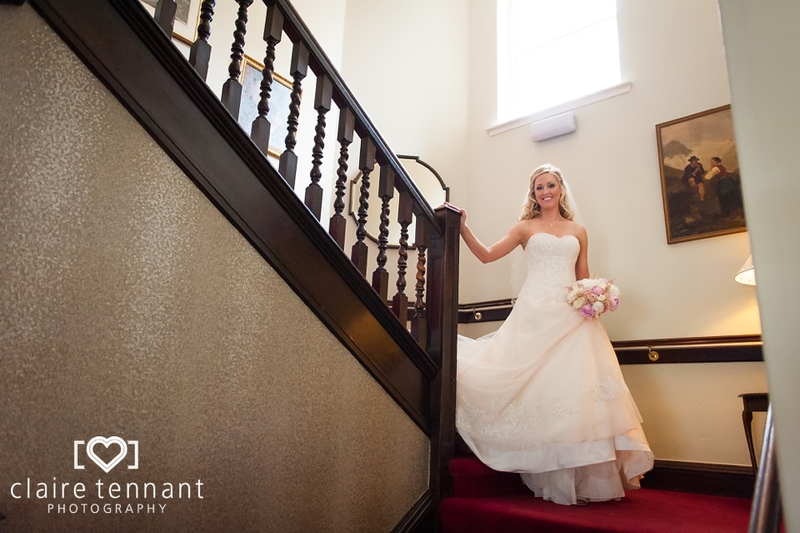 I had a lot of fun photographing this wedding and looking forward to returning to Rufflets in the future. 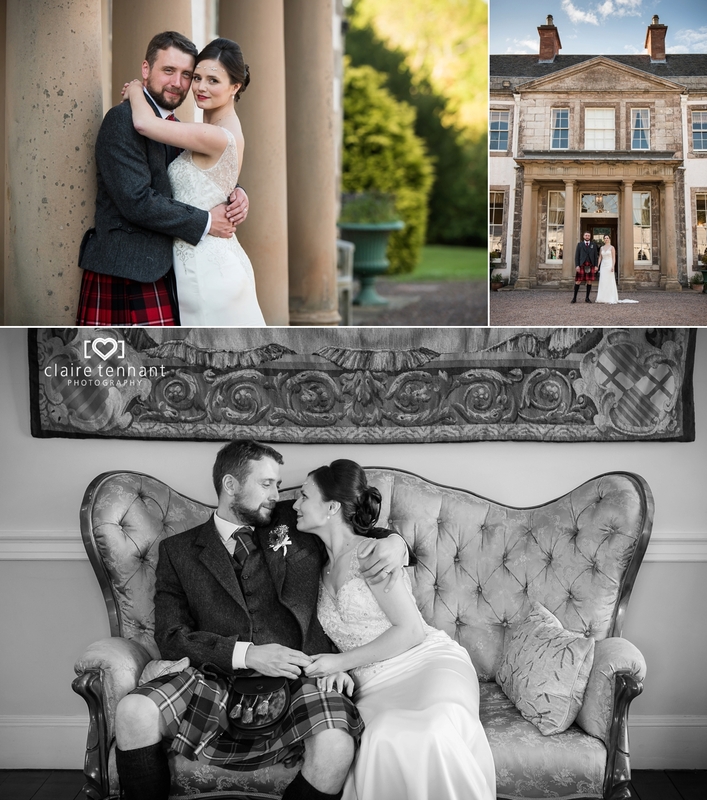 Here are a few of my favourite shots from the day. 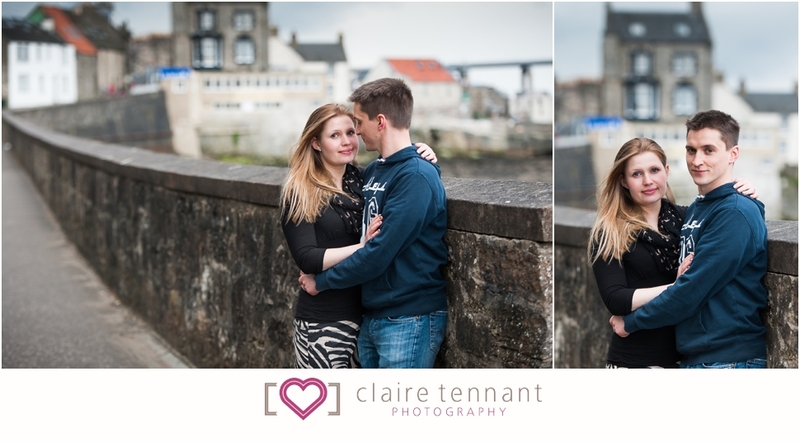 On Sunday I met up with Sophie and James for their South Queensferry pre-wedding shoot. 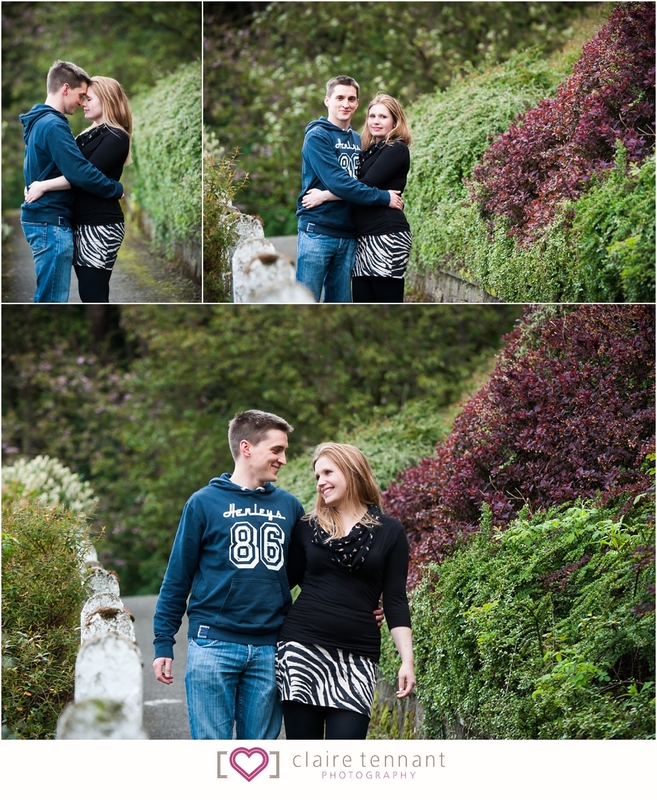 We had a walk around the town stopping off at various locations along the way. 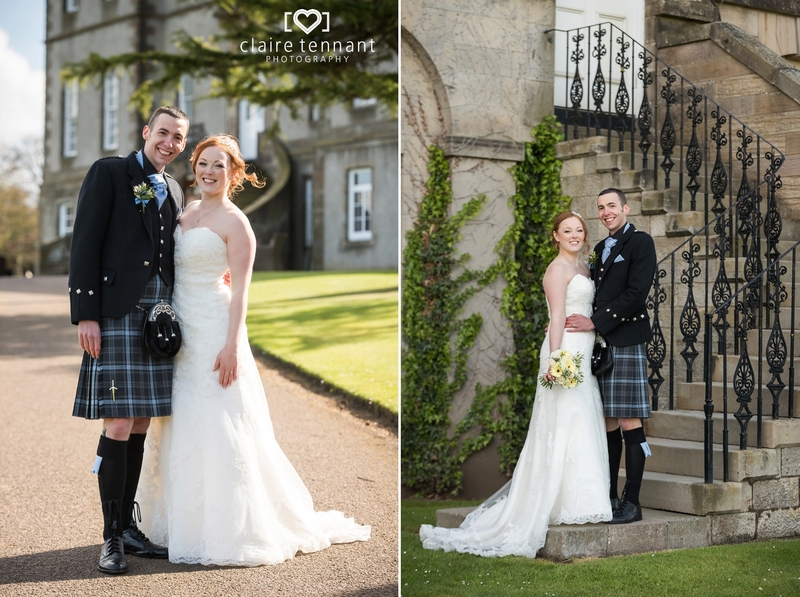 Considering they started off a little unsure about being in front of the camera I thought they did a great job of looking relaxed and natural! 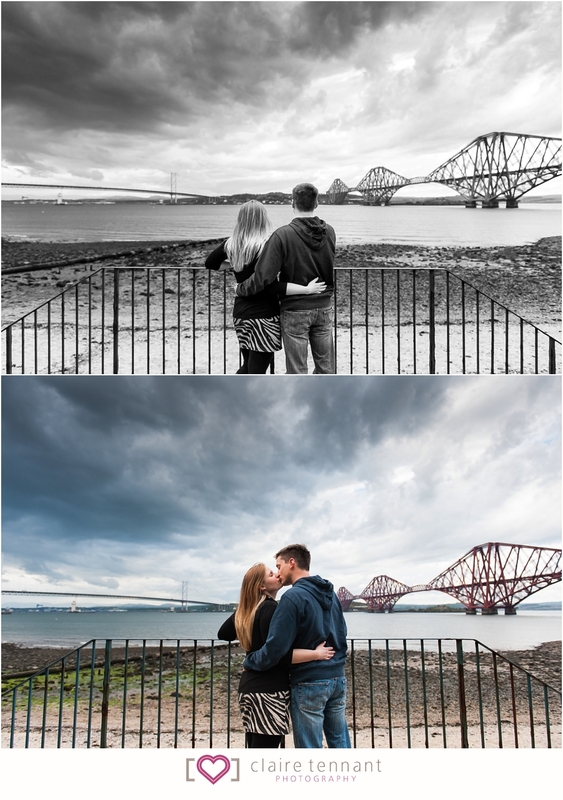 Amazingly we managed to avoid any rain regardless of the dramatic clouds overhead! 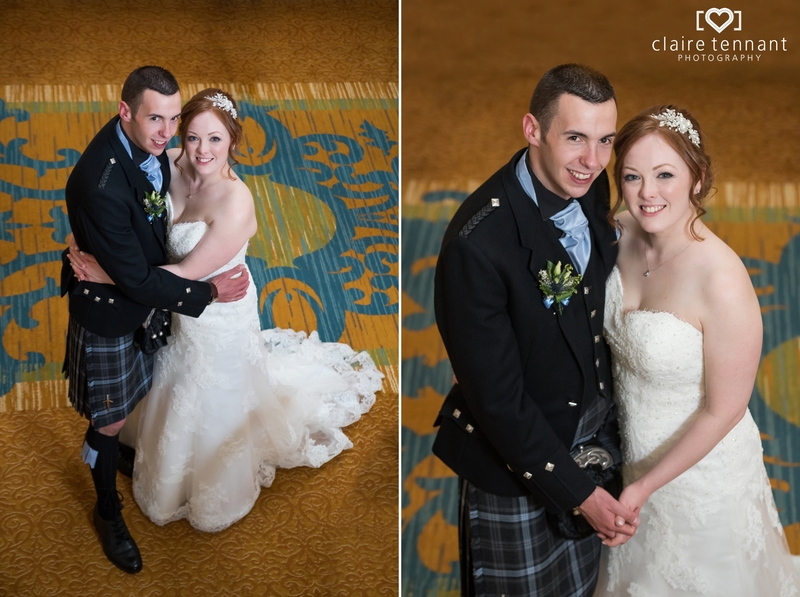 Sophie and James are getting married at Holyrood MacDonald Hotel in Edinburgh in two months time, I can’t wait to photograph their big day :-).